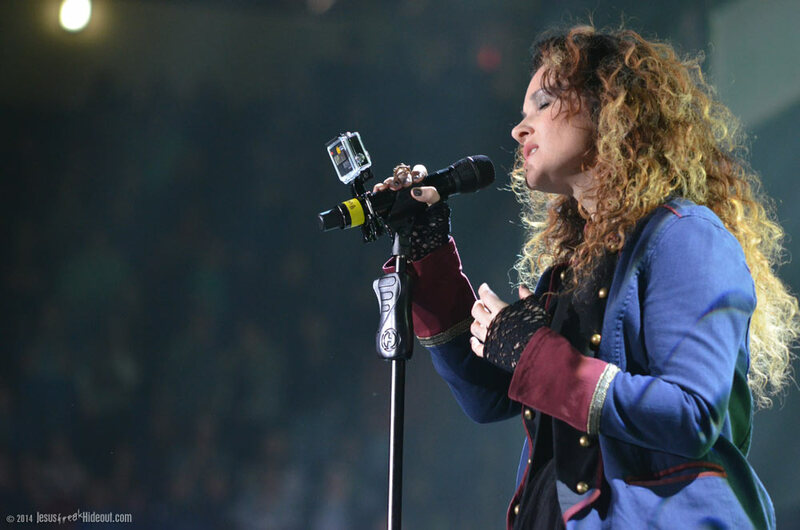 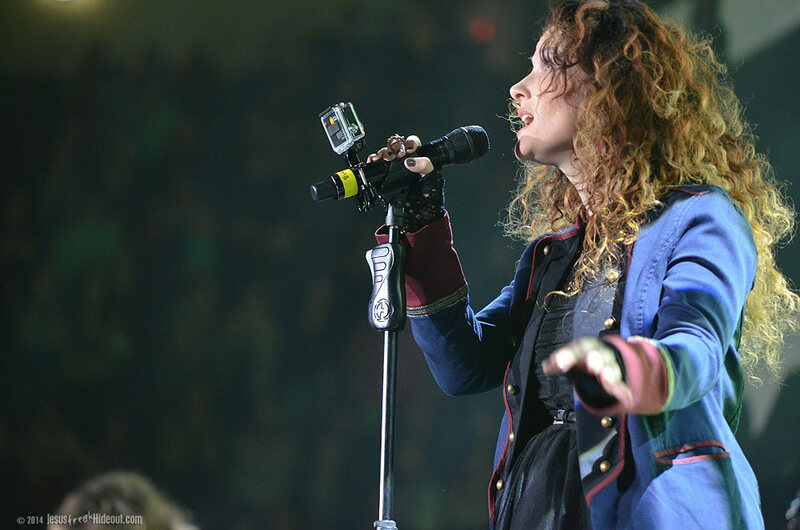 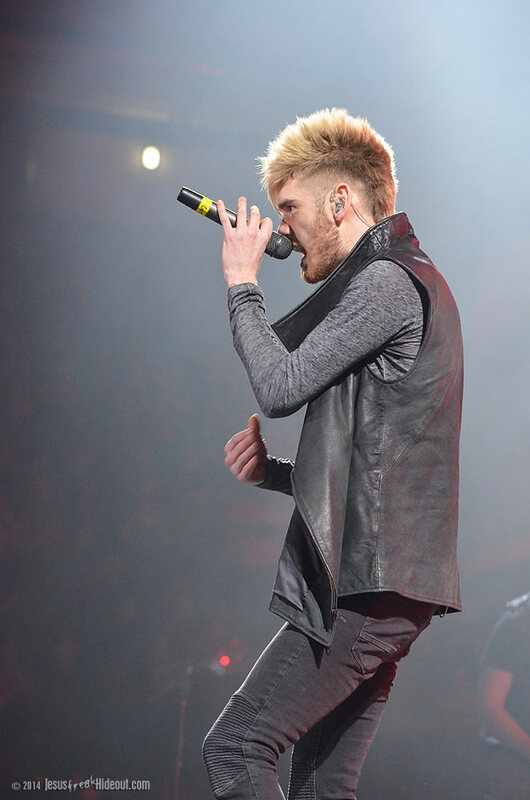 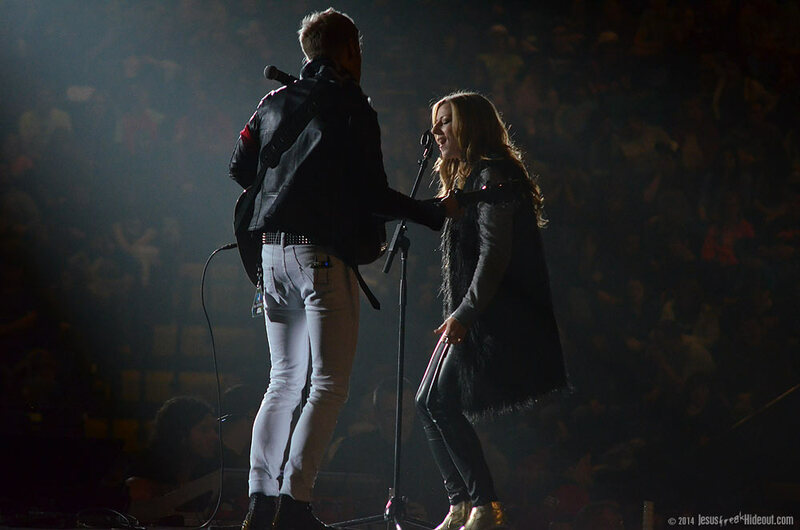 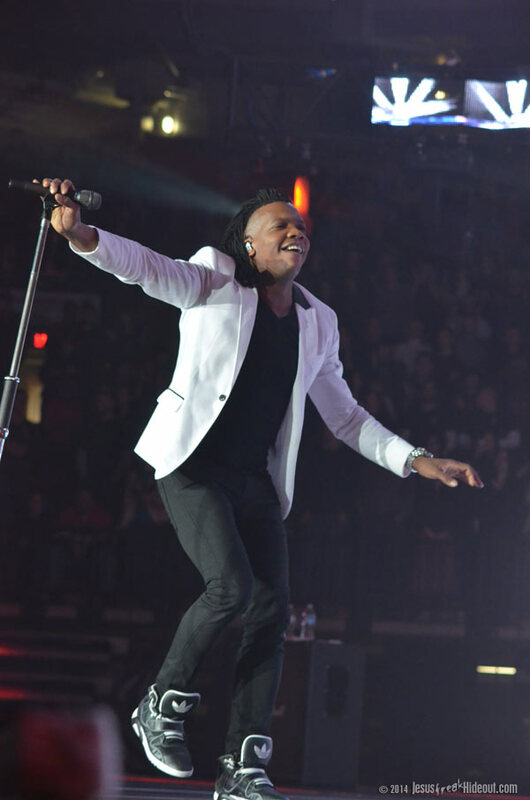 There are few tours where you can see some of the top names (and up-and-comers) in Christian music all in one place in one night, but Winter Jam Tour has been making a habit of uniting artists like these for almost two decades now. 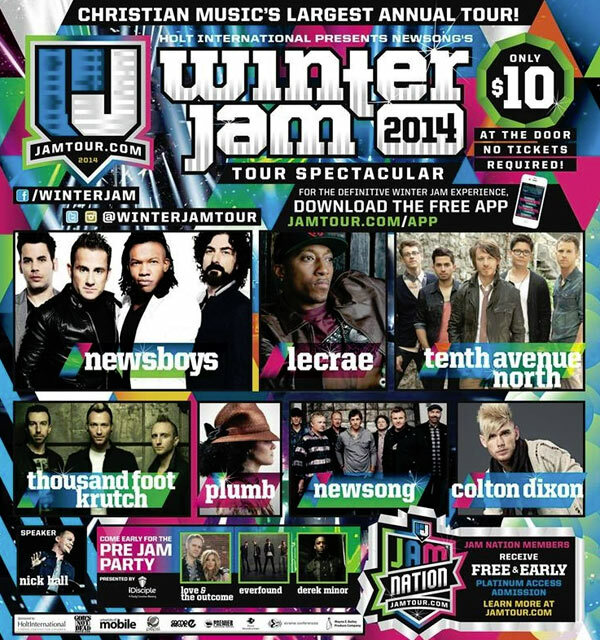 To sweeten the deal, the tickets for Winter Jam are just a slick $10 a person, but the downside is that there is no way to get those tickets ahead of time (If you want to get early admission into the venue, there are special "Jam Nation" tickets that are tiered at $29.99, $39.99 and $49.99. 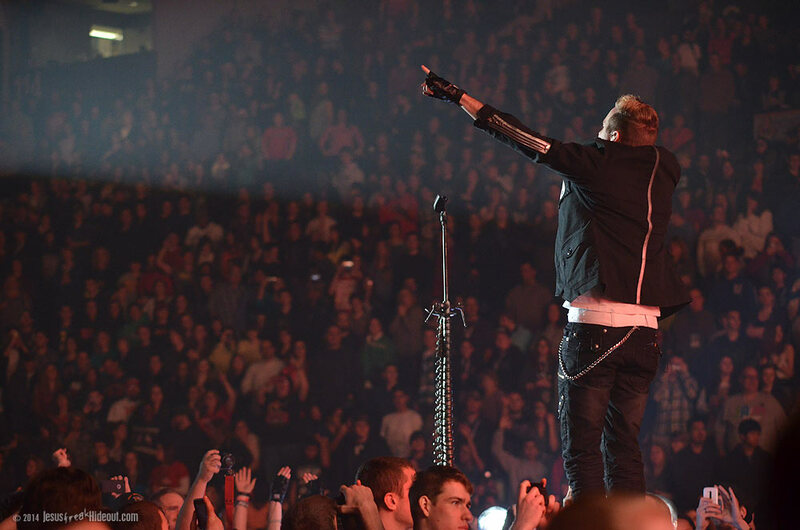 But the last one includes admission into more than one date on the tour! 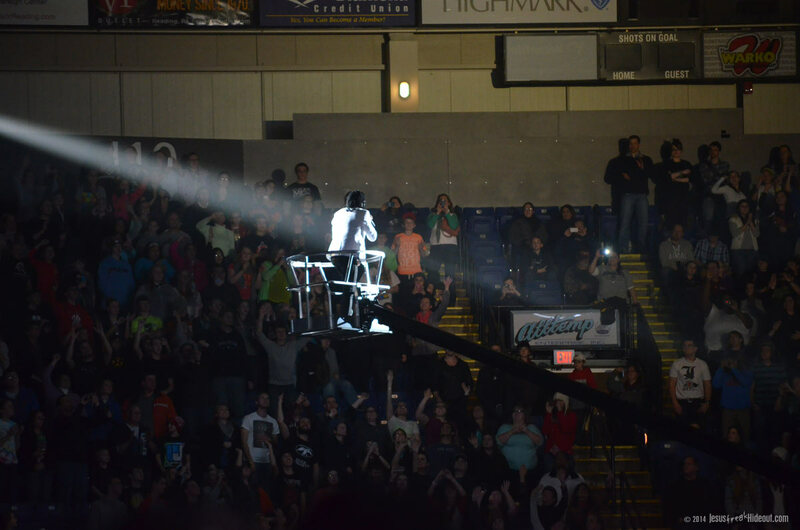 ), so those who hope to score a seat anywhere in the venue must brave the cold (after all, it is Winter Jam) and wait in a long line for a chance at a seat inside. 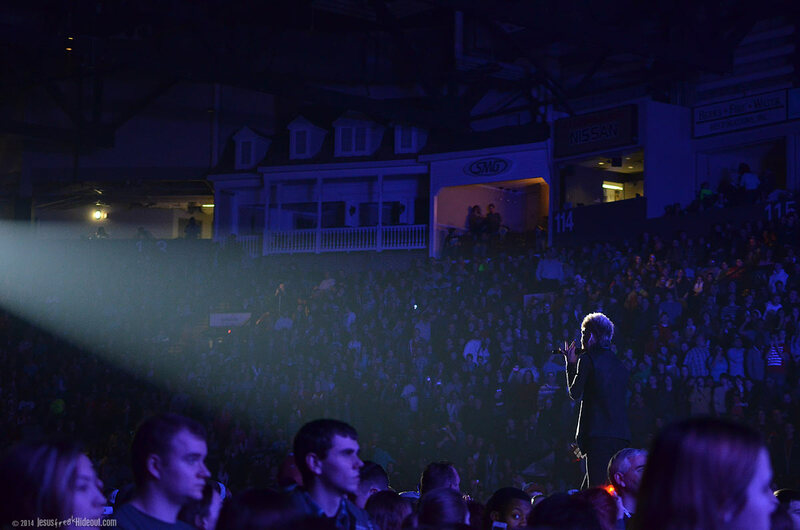 If the venue sells out, they turn people away. 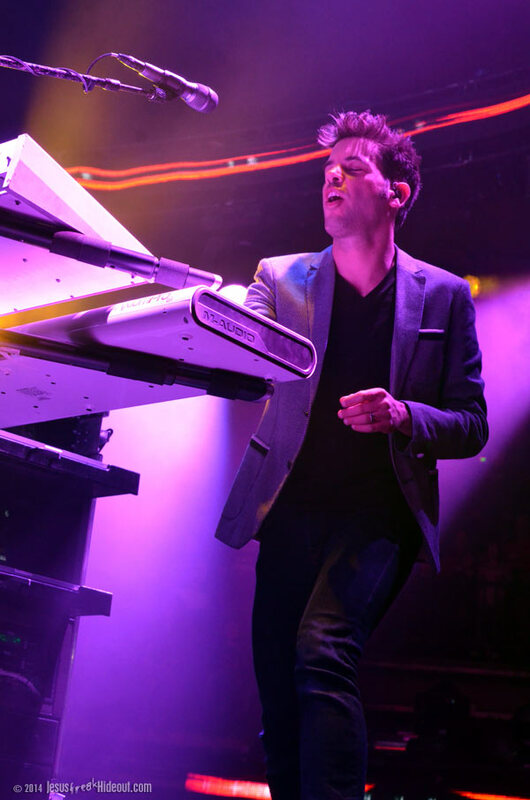 So you best get there early (and bundle up if you're on the east coast!) 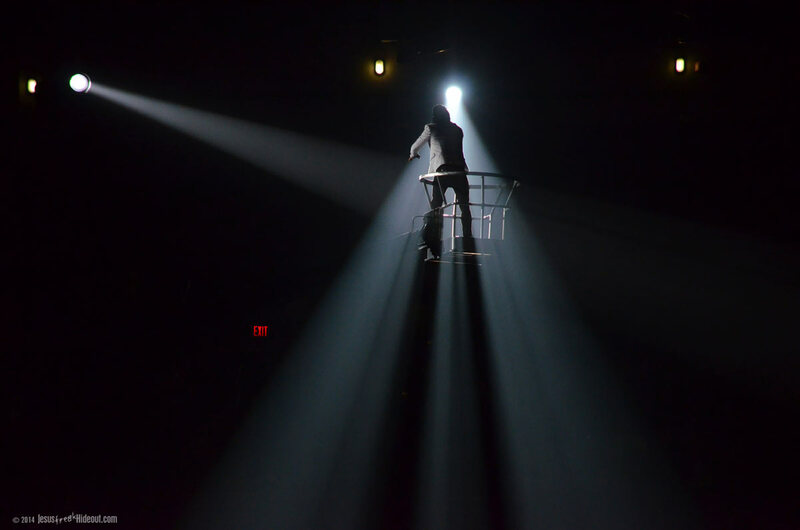 if you don't want a seat behind the stage or in the nosebleed section (or both!). 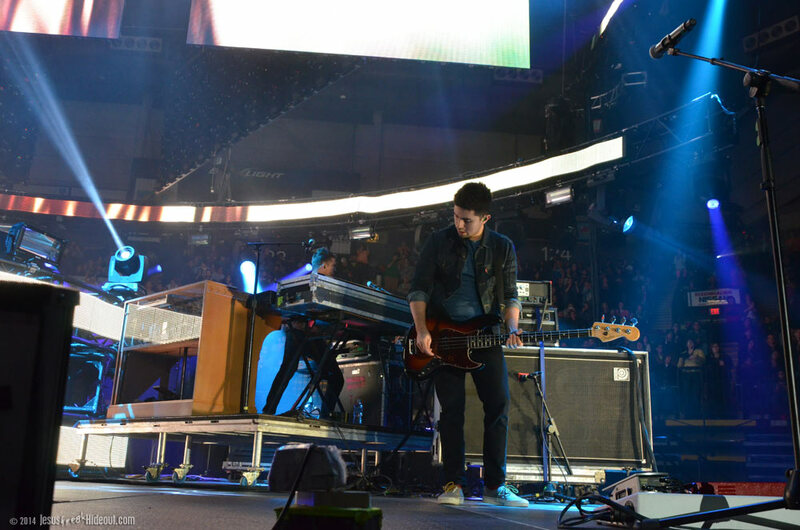 Winter Jam is a well-oiled machine, too. 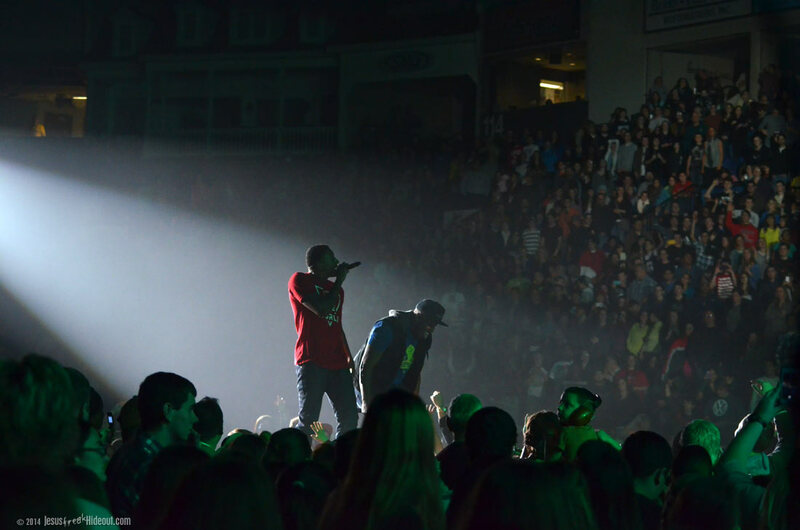 And it kind of has to be to be as successful as it is. 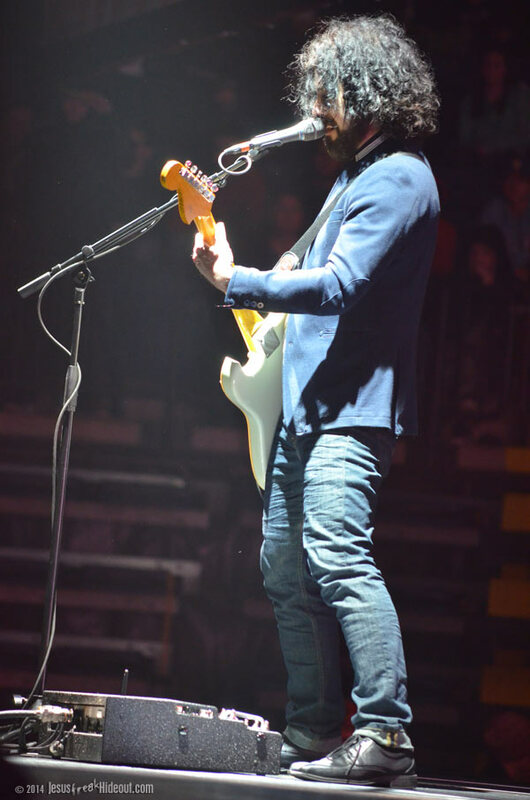 The first hour, which starts promptly at 6pm, is the "Pre-Jam" show which includes several newer artists opening the night as well as sponsor announcements (which, you can imagine, for a $10 ticket, there are quite a few of). 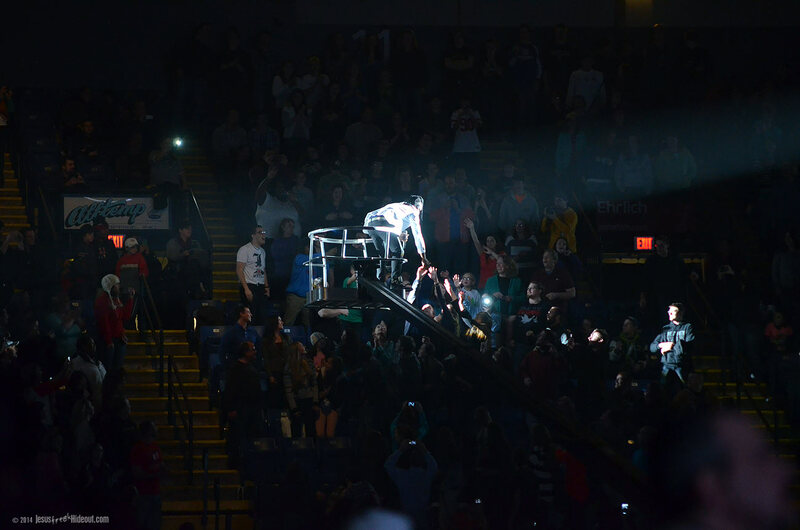 During this time, people are still funneling into the venue through the main gate, and grabbing seats. 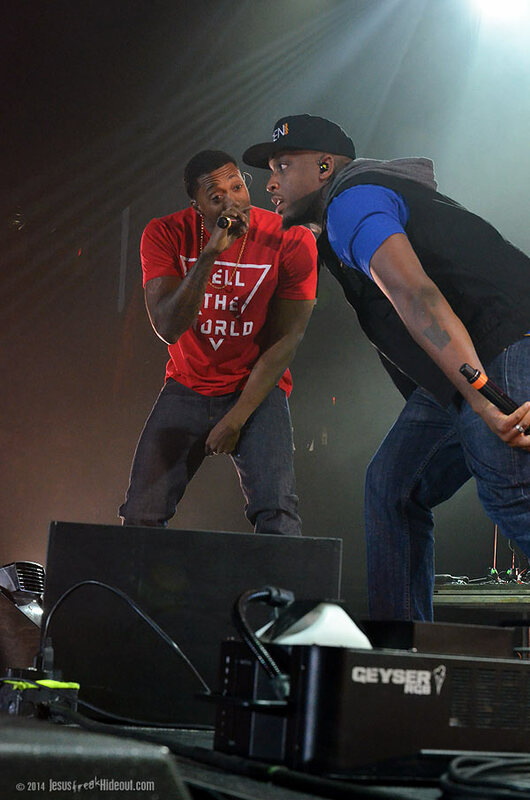 Reach Records' Derek Minor opened the night with a lively show. 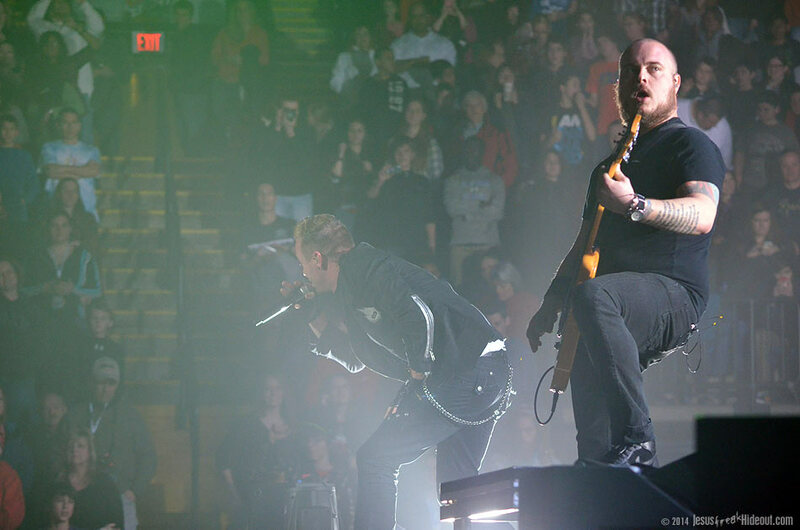 Sadly, we only heard it from within the bowels of the Santander Arena. 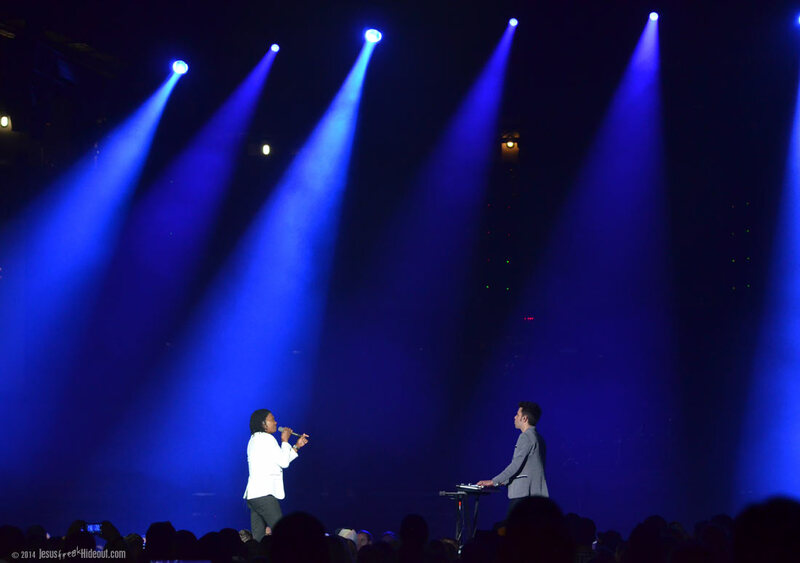 We were supposed to have a 5:30 interview with an artist but traffic (and confusion at the doors) kept us from getting in until closer to 6, and then our interview was pushed back until a time during the first couple openers. 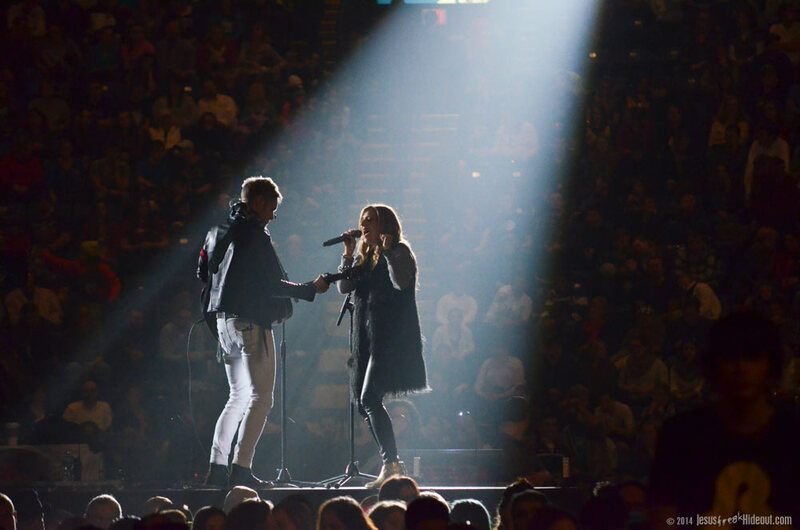 Unfortunately, this meant we missed Word Records' Love & The Outcome (the husband/wife duo of Jodi King and Chris Rademaker) as well (and I had been hoping to see them). 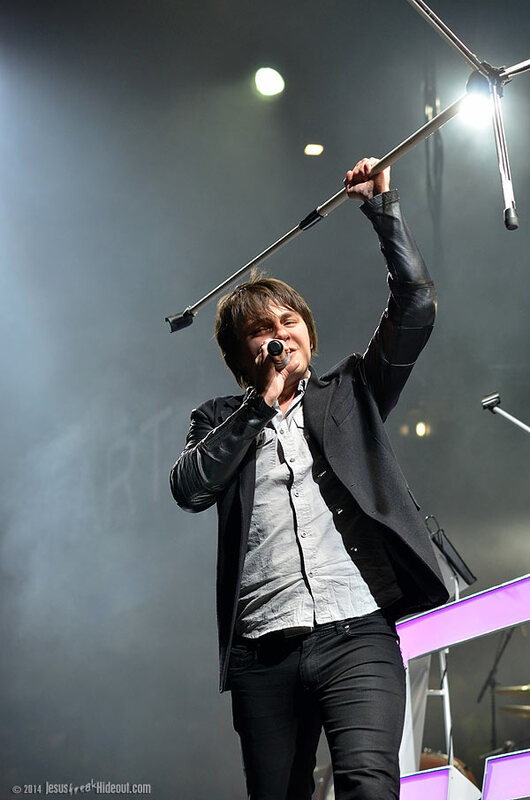 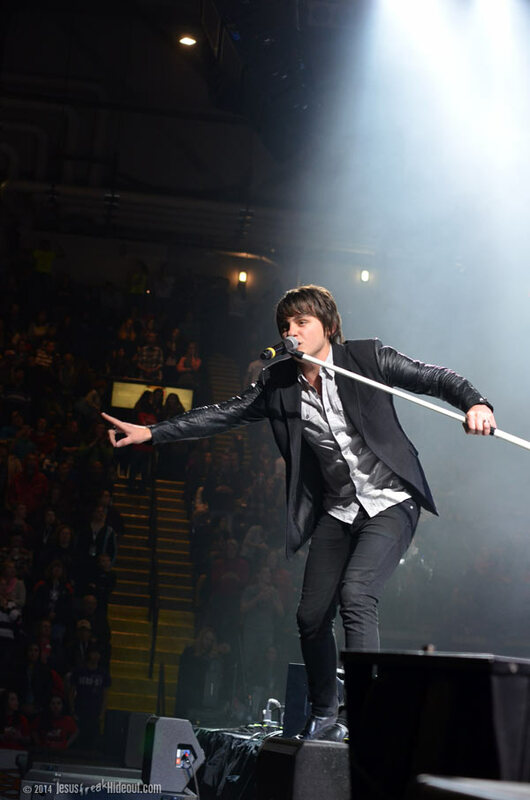 By the time we made it into the arena, announcements were preceding the performance of Russian brother band (and also Word Records artist) Everfound. 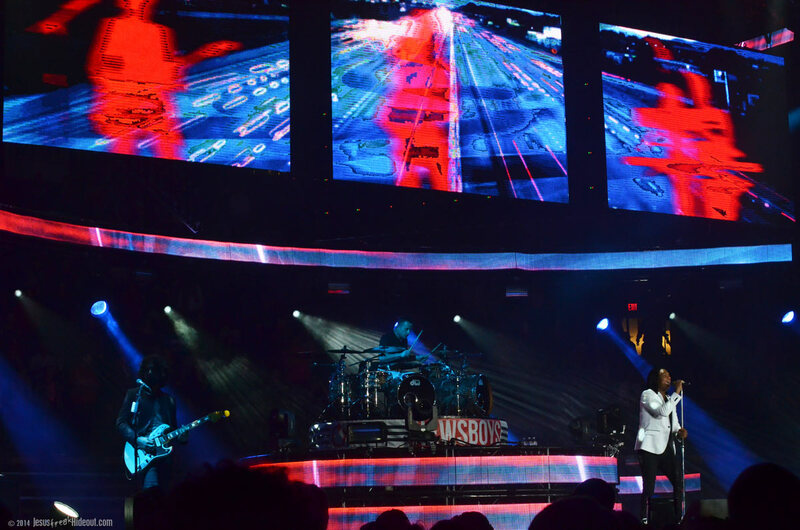 I first saw them at Rock The Universe in Orlando in 2012, so this was the first time I was seeing them since the release of their 2013 self-titled debut album. 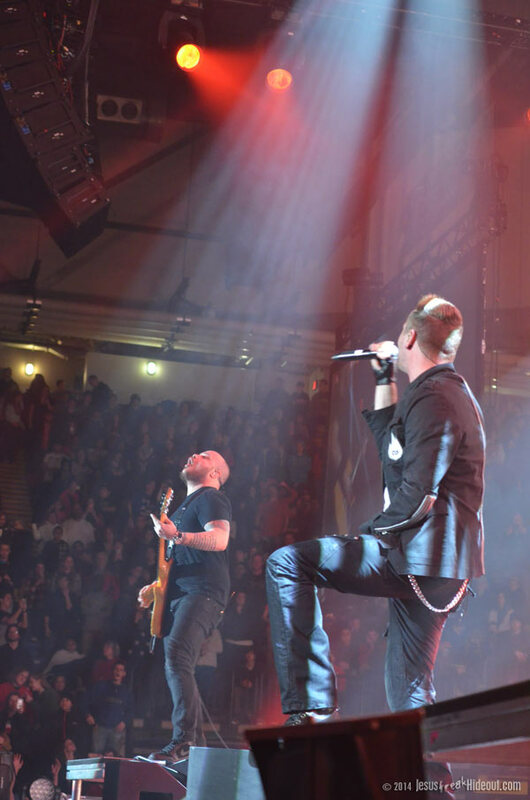 They put on an energetic show, singing anthemic cuts like "Hallelujah," "Never Beyond Repair" and the closer, "God Of The Impossible" (before which, vocalist Nikita Odnoralov snapped a photo of the audience for Facebook). 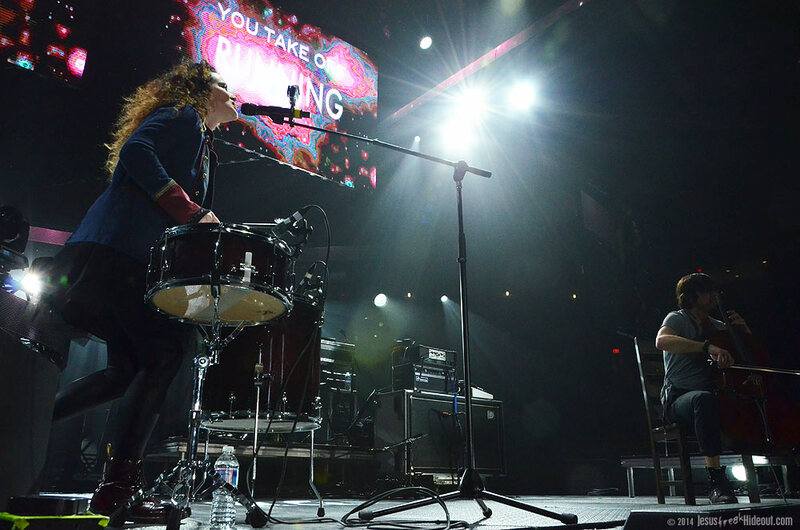 Their sound is a little too standard for the CCM soundscape to stand out much, but for a young band of siblings, they're already displaying promise. 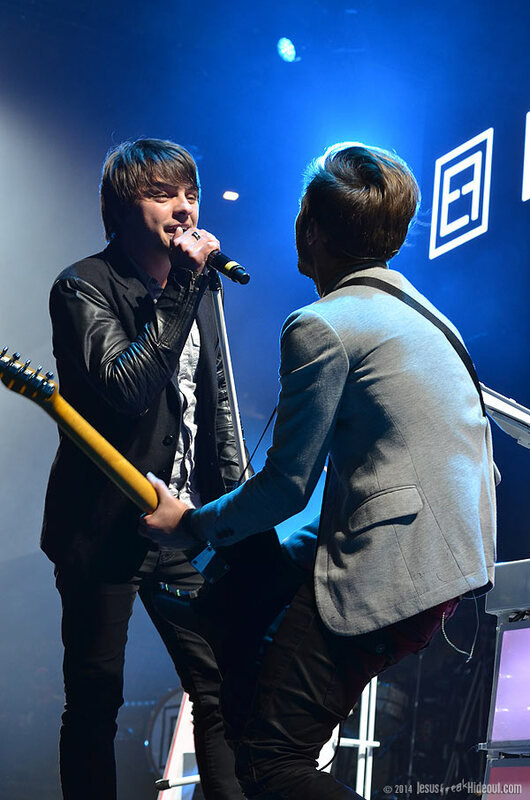 I think they're worth keeping an eye on even if they haven't quite found their own sound just yet. 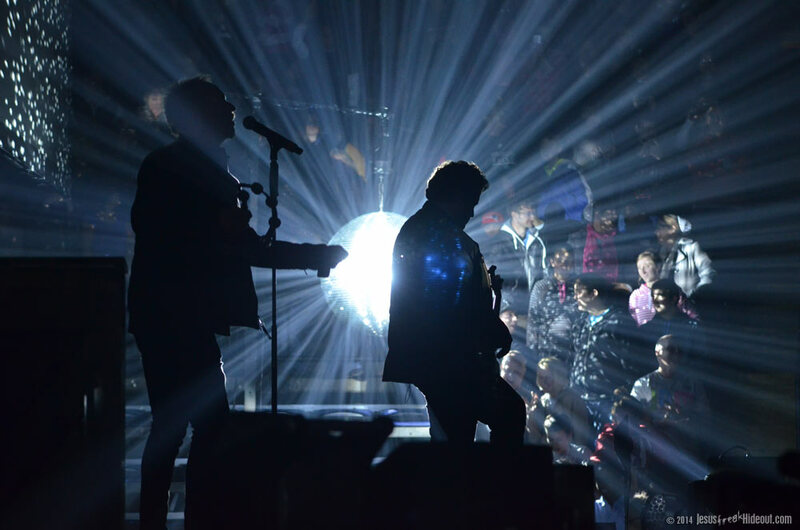 With their set's end came also the close of the Pre-Jam Show. 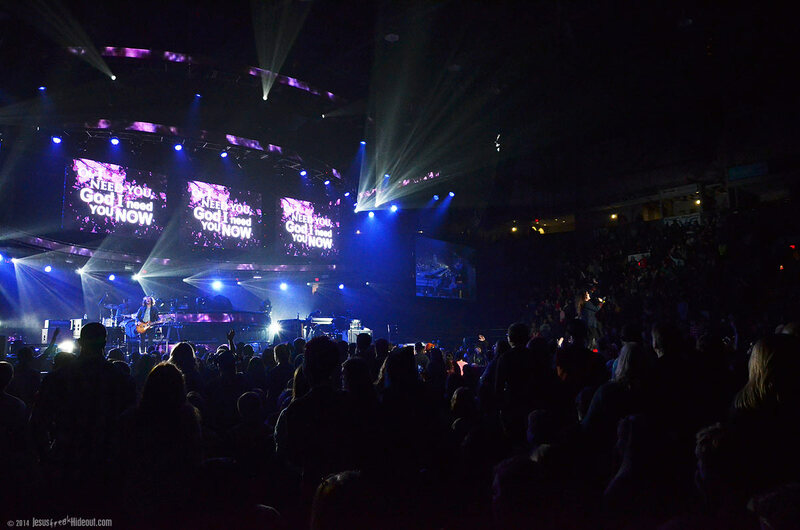 A set change ensued and announcements and videos filled up the 15 to 20 minutes left before the official 7pm start time of the Winter Jam event. 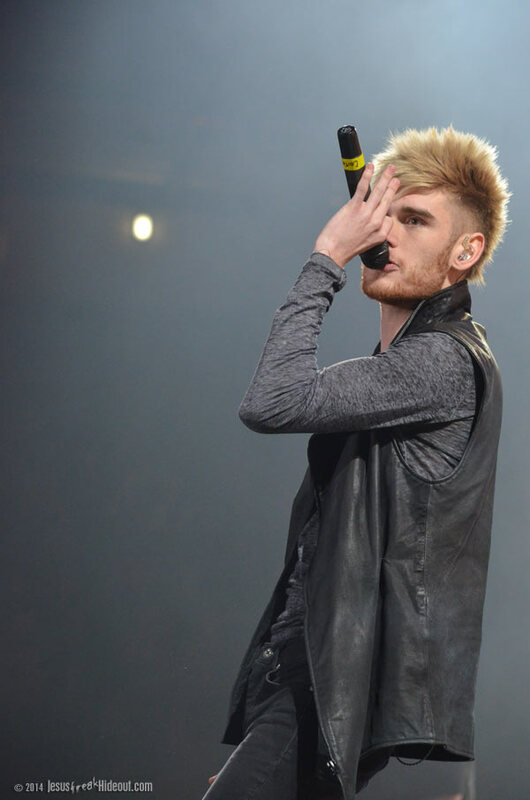 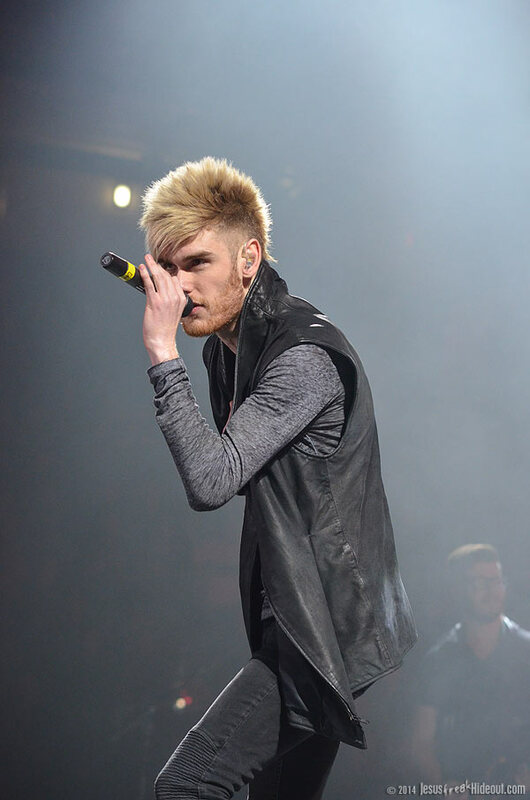 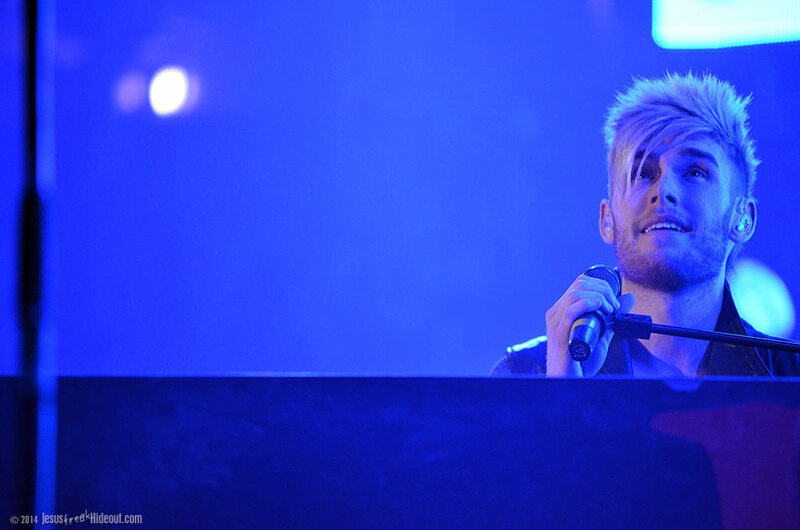 By 7, a countdown began on the video screens and the house lights went out to get ready for American Idol star Colton Dixon to begin his set. 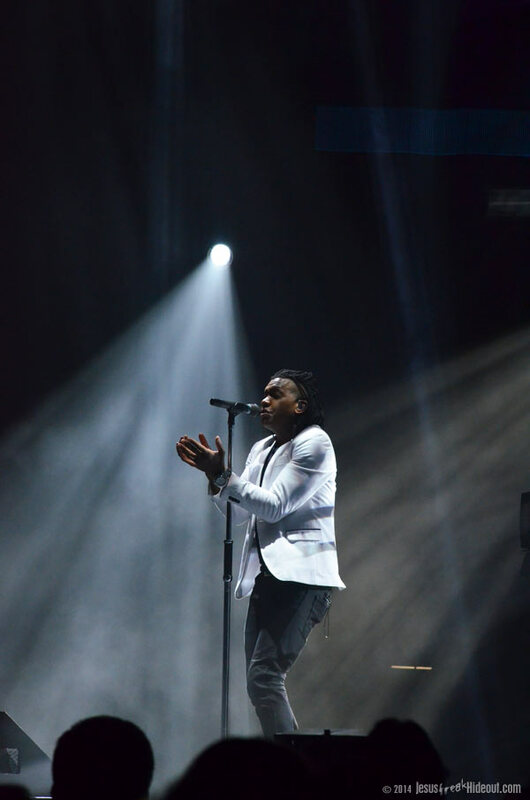 Most of his recent shows have leaned more on the softer side of his music, but this Winter Jam set was definitely more energetic and edgy. 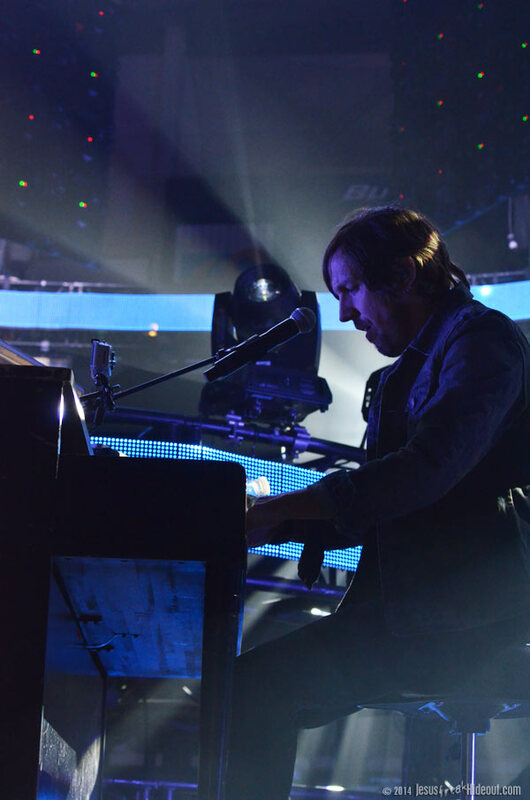 He opened with what I assume is a new song, "Our Time Is Now," and then sat behind his cross logo-branded piano for "Never Gone." 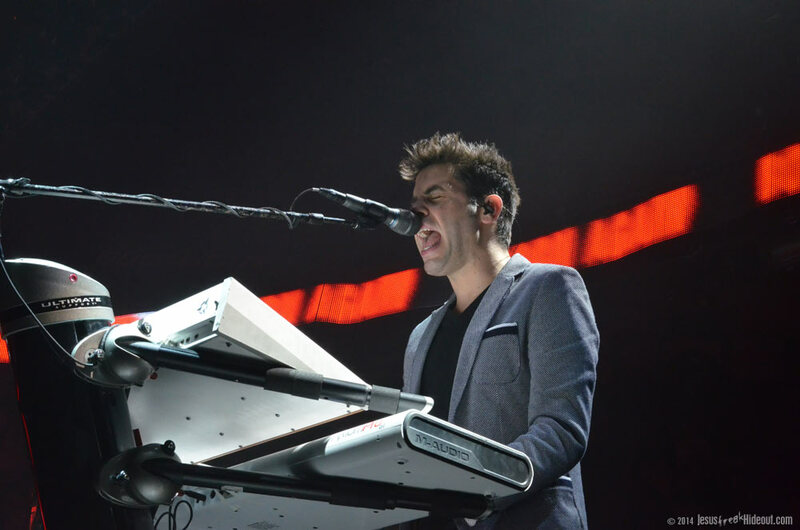 He encouraged some crowd participation for "You Are" before sitting behind the piano again for the rest of the song. 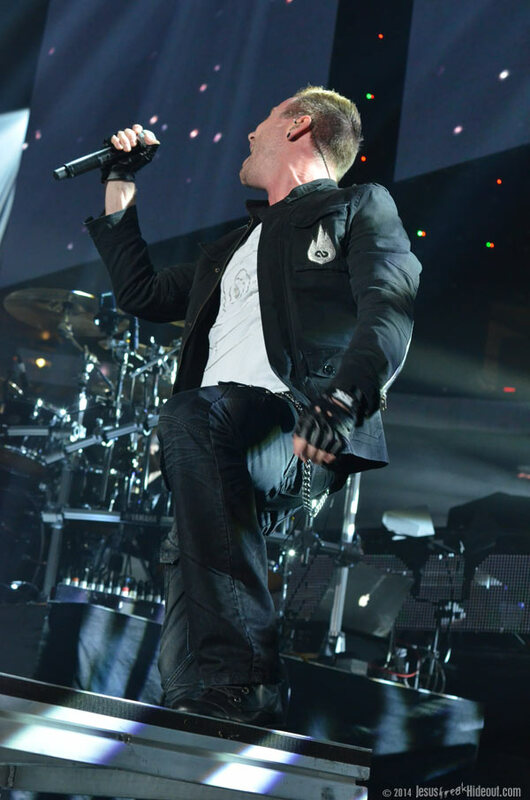 He then closed with the lively "In and Out of Time." 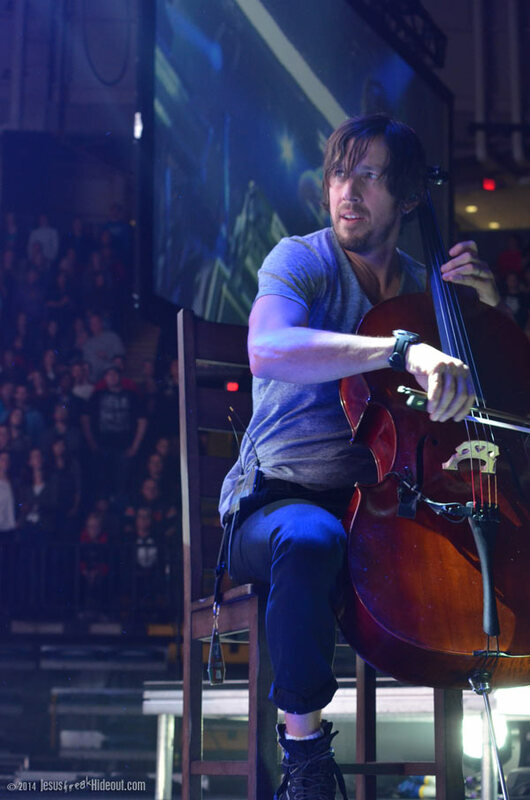 Newsong vocalist and cellist Matt Butler joined Plumb on stage to provide cello accompaniment for a couple of her songs, including the opener "One Drop." 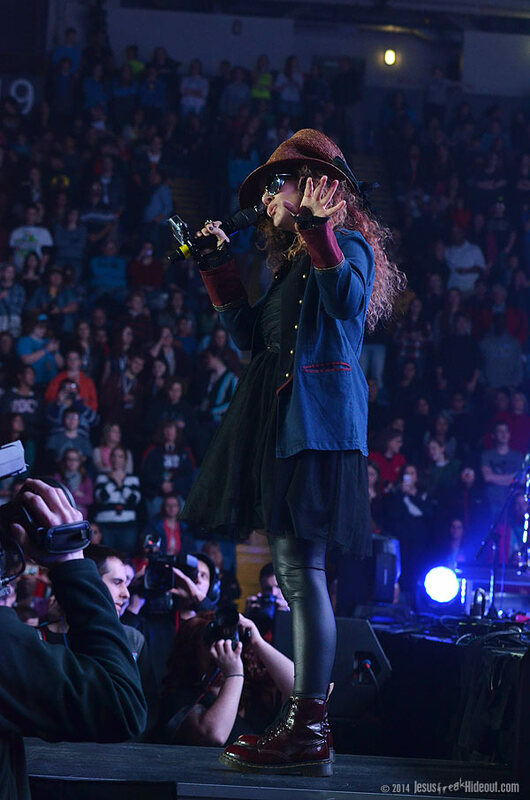 With Plumb positioned on the catwalk in sunglasses and a top hat, she began the song among the fans before returning to the stage. 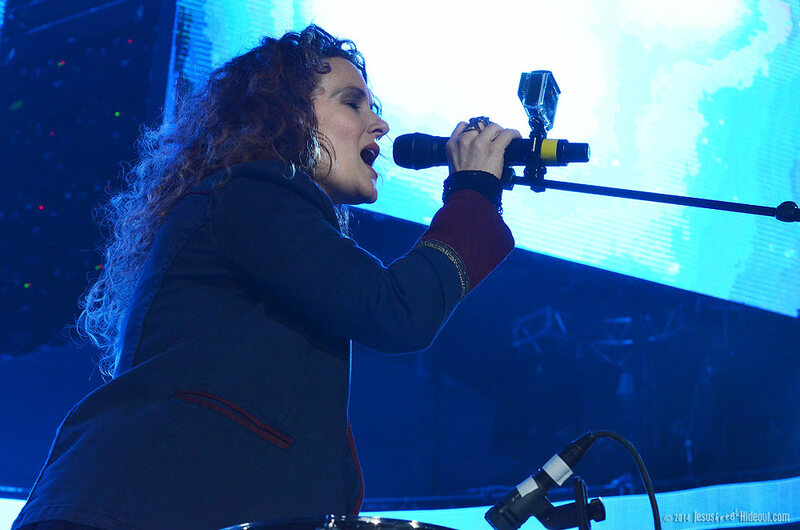 She actually did a great job of shortening several of the songs in her set to squeeze a total of six of them into the short set list. 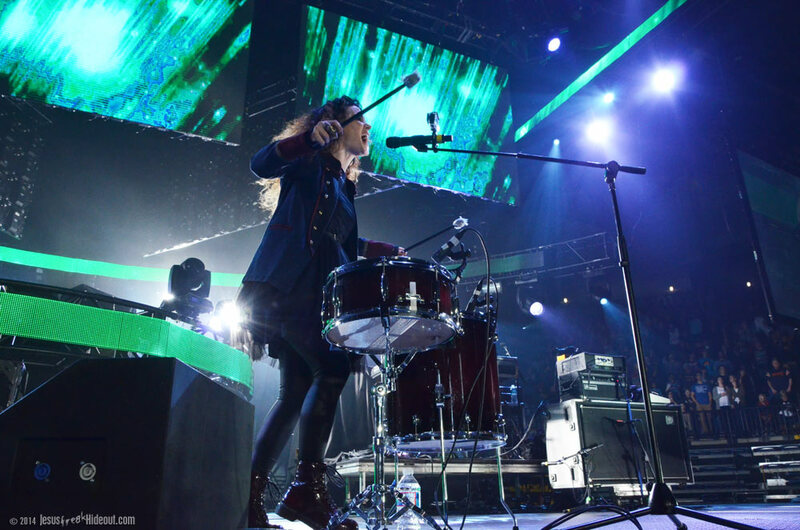 Fan favorite rocker "I Can't Do This" was next and then she turned to a pair of drums to sing the emotional ballad--which she said she wrote for her 7-year-old son, Solomon--"I Don't Deserve You." 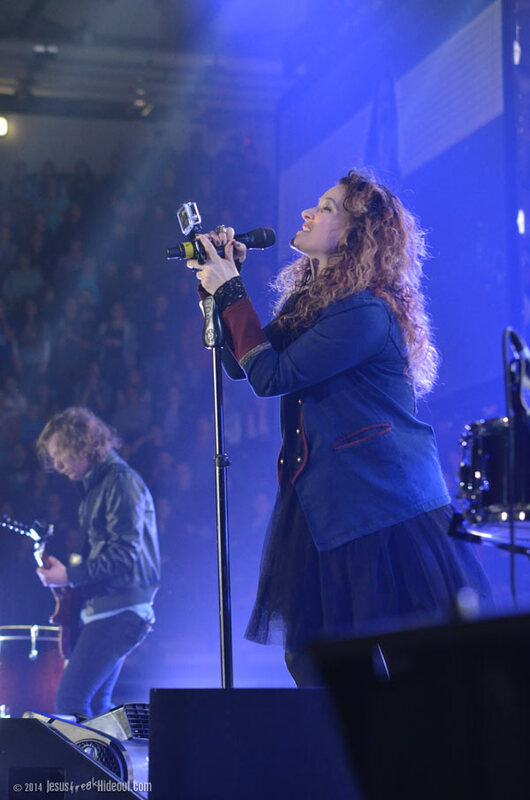 She then turned it up briefly for the rocker "Cage" and then slowed it down considerably for the beautiful ballad "In My Arms," from her lullaby album Blink. 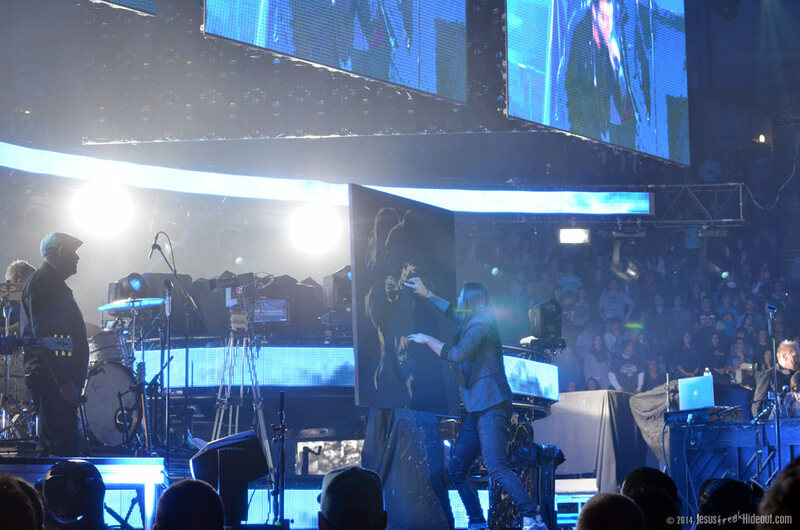 Finally, she opened up about how, two years ago, she and her husband were separated and on the road to divorce before God healed their relationship, making it stronger than ever. 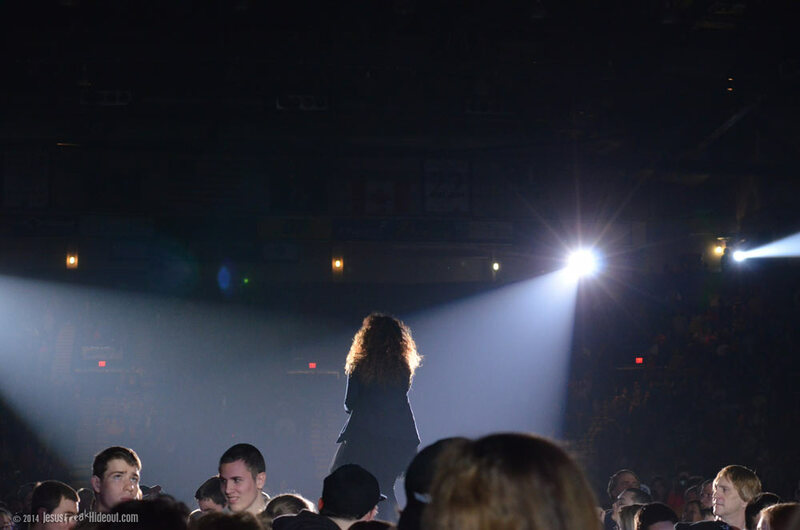 She used this as an appropriate intro to her radio hit "Need You Now (How Many Times)" and then left the stage. 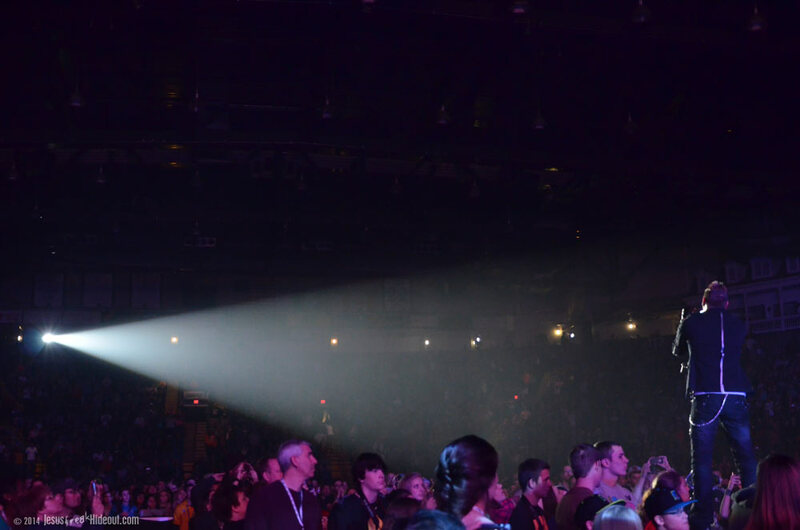 As the main stage became a flurry of stage crew members for a set change (and the spotlights remained off), the "B Stage" at the back of the arena illuminated for speaker Nick Hall. 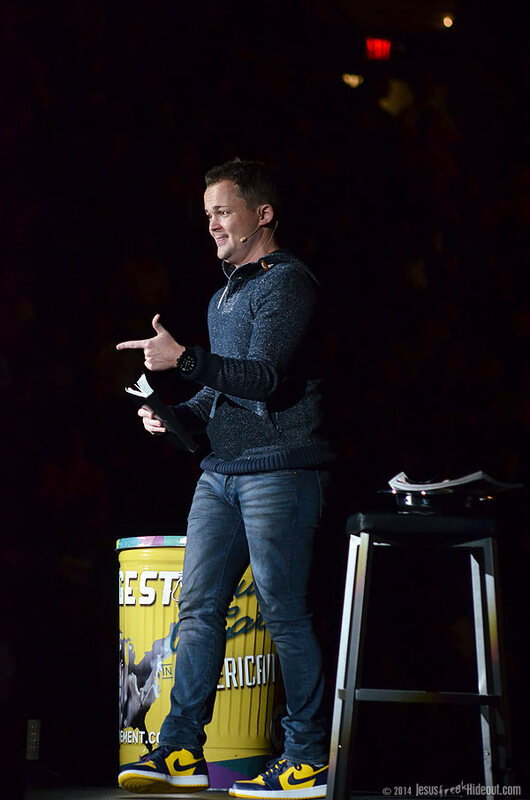 With a brightly painted yellow trash can next to him, he spoke on sin and the prodigal son, driving home the message that "sin can be fun, but it's not satisfying." 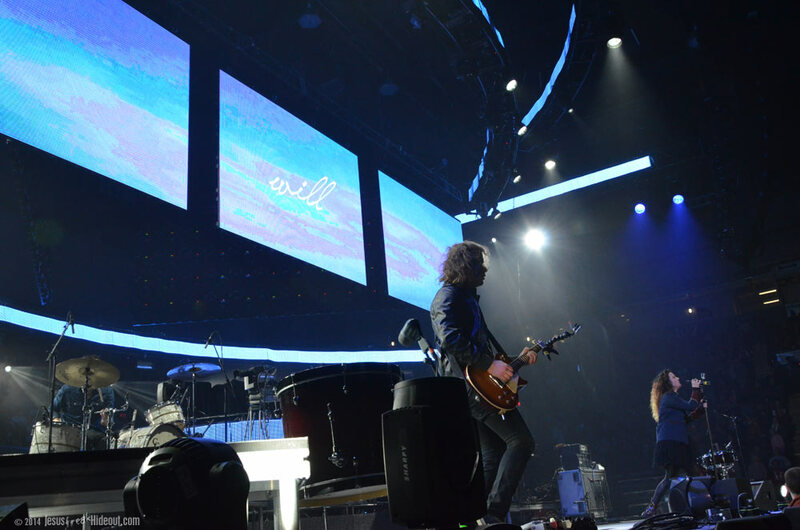 And with the prodigal son analogy, he encouraged the audience to forsake their sinful habits and "reset" their walk with Christ (or make first-time committments). 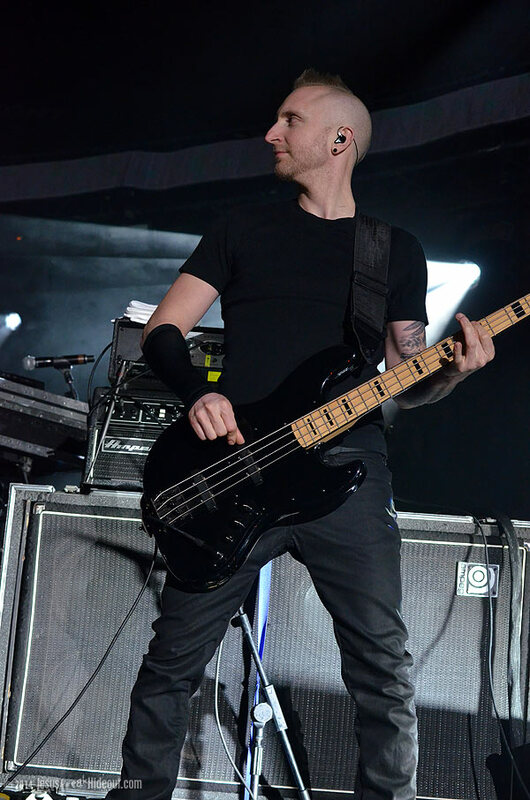 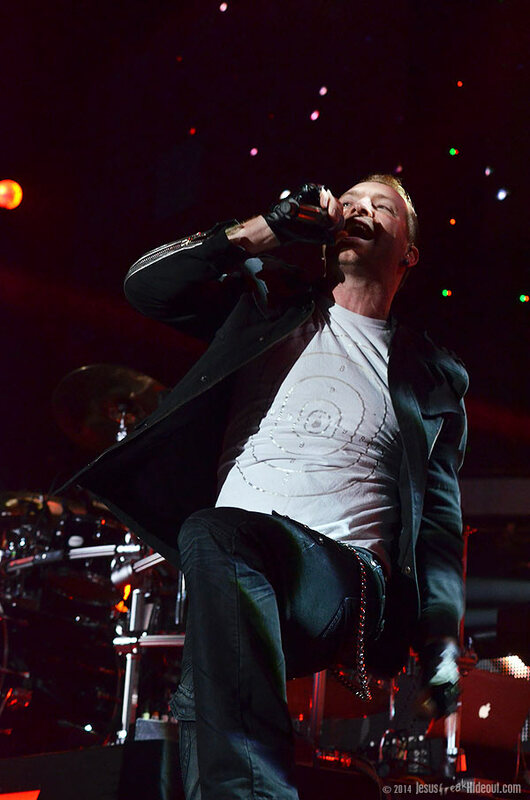 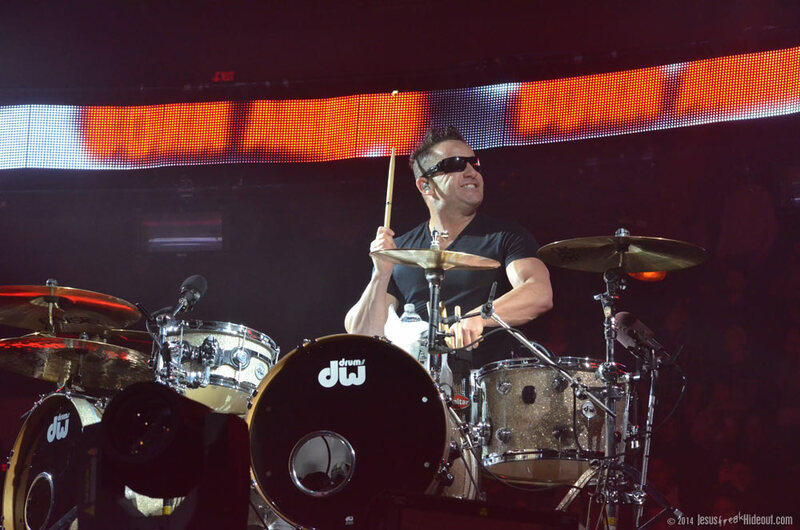 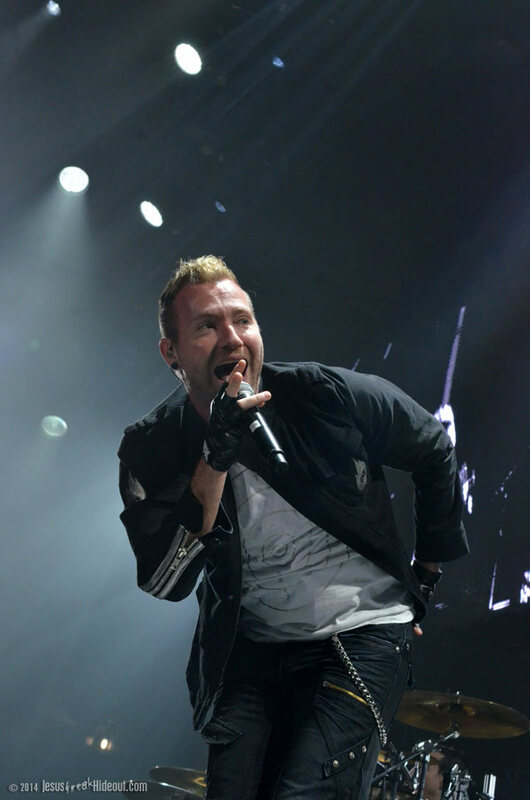 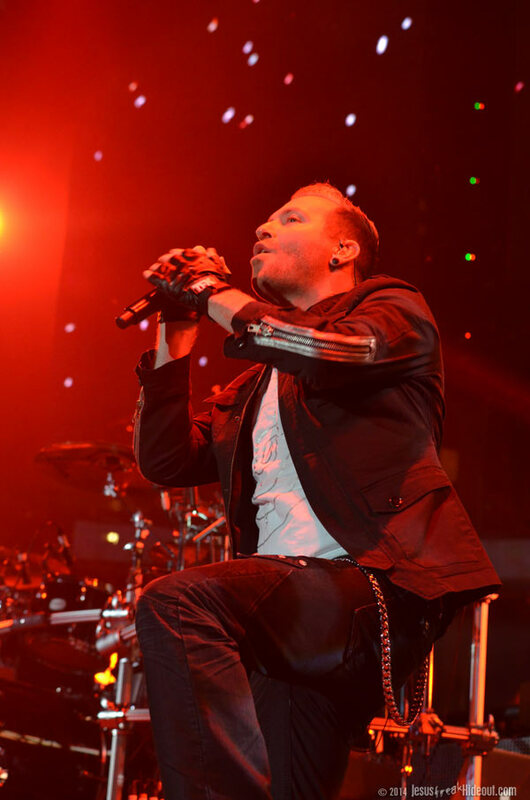 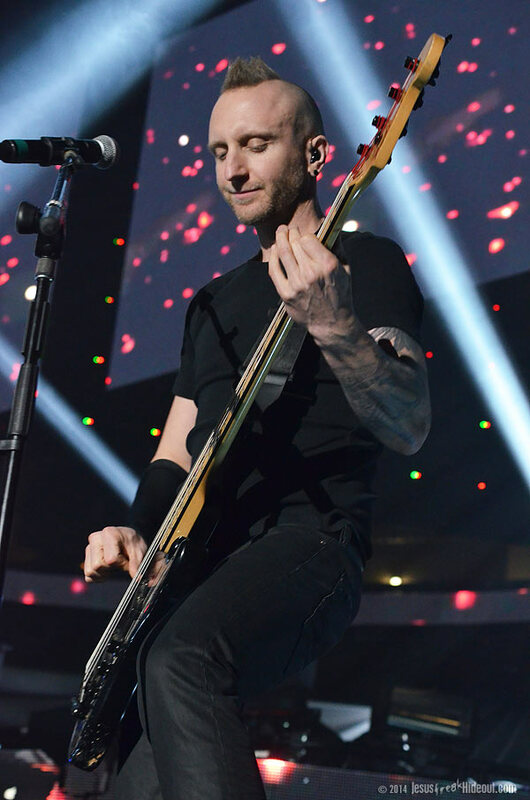 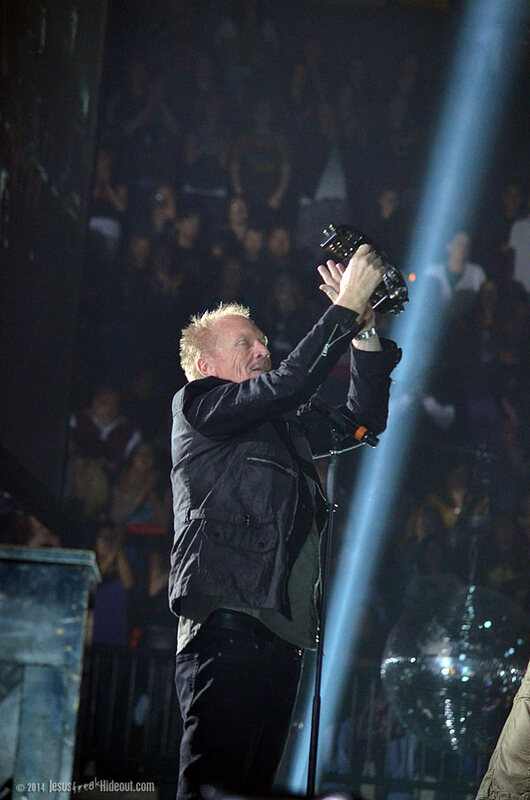 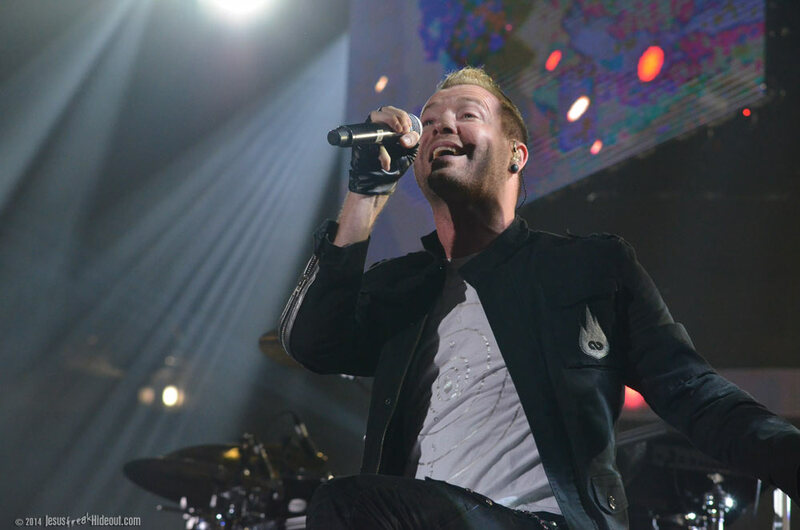 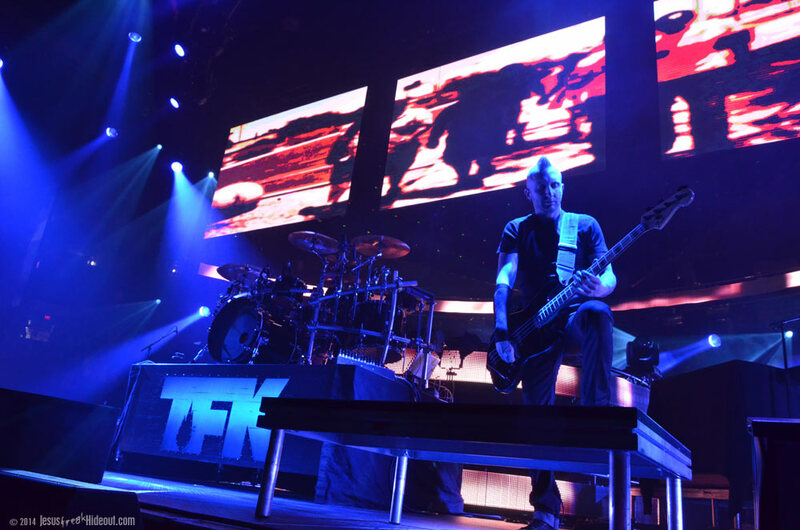 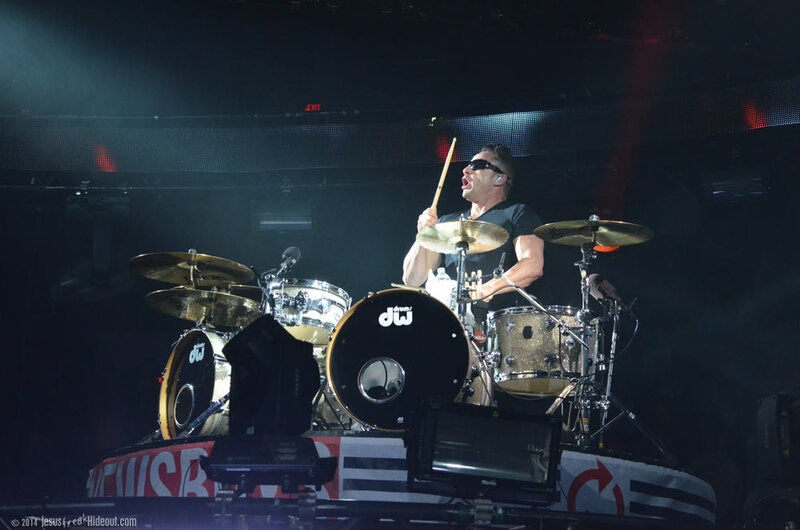 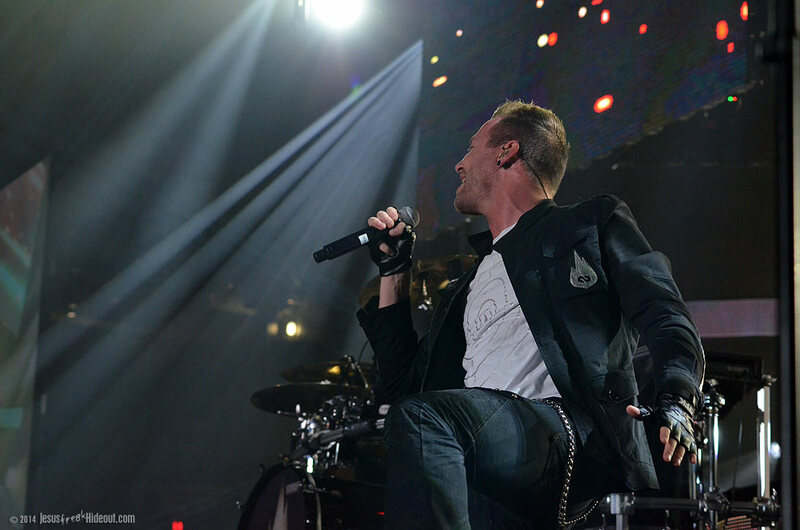 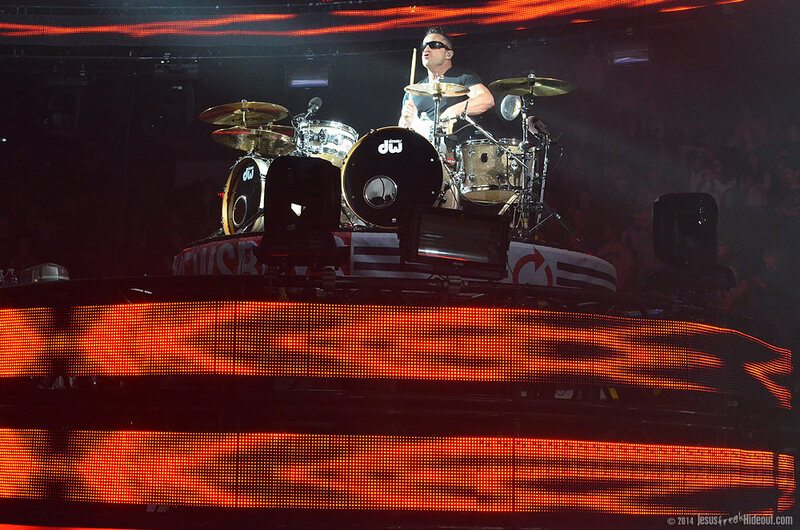 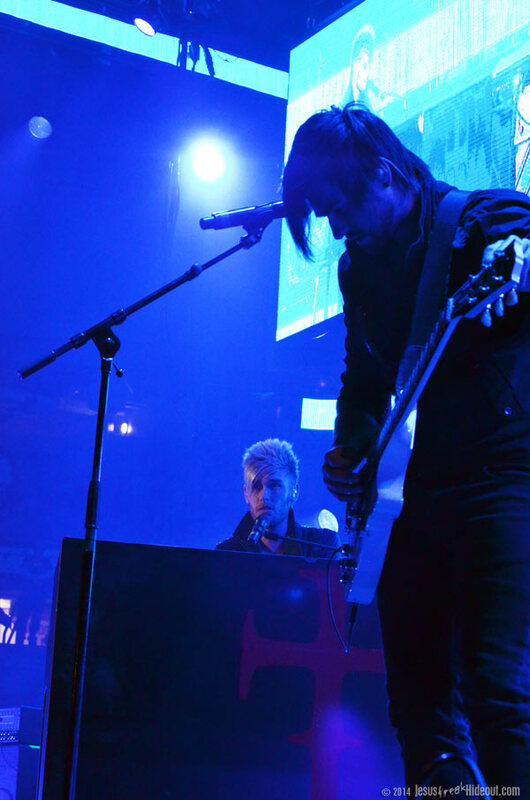 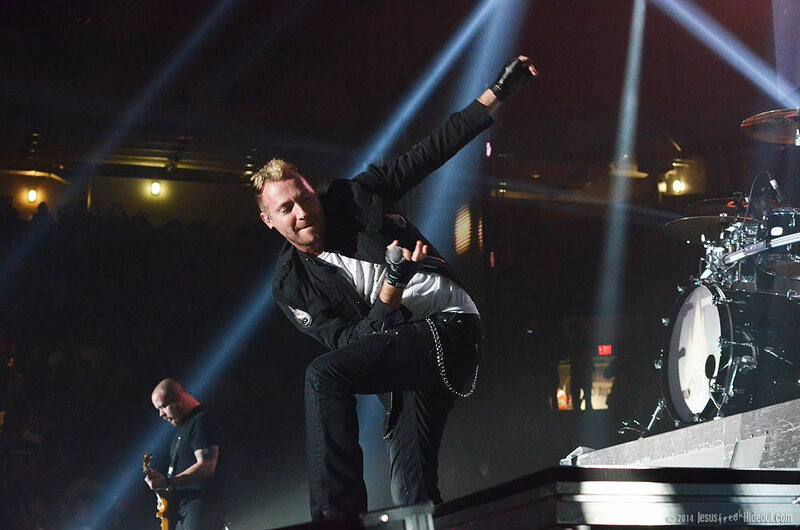 Soon after Hall finished his message and closed in prayer, Thousand Foot Krutch presented a rocking, albeit short, set, opening with "Let The Sparks Fly" as the foursome rocked pretty hard on the Winter Jam stage. 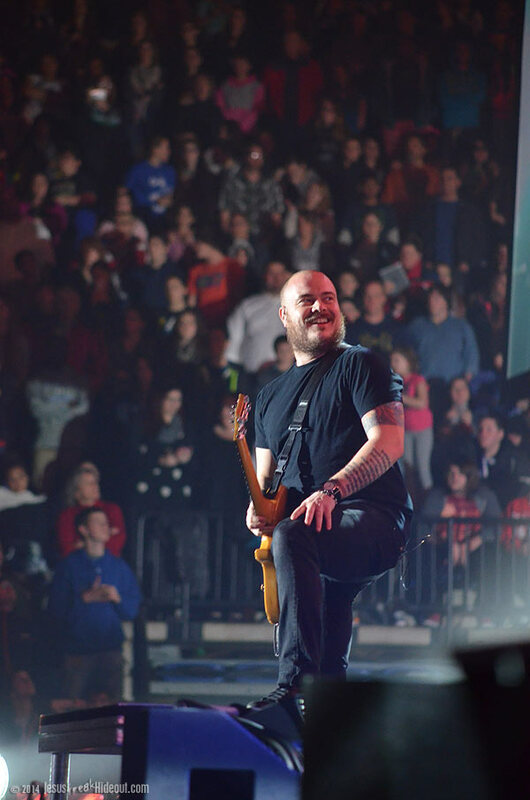 "Rawkfist" was next and then front man Trevor McNevan took a moment from the catwalk to encourage the audience that, despite what they've come to know, "worship isn't a genre... worship is a lifestyle," and encouraged the audience to make worship their lifestyle in the new year. 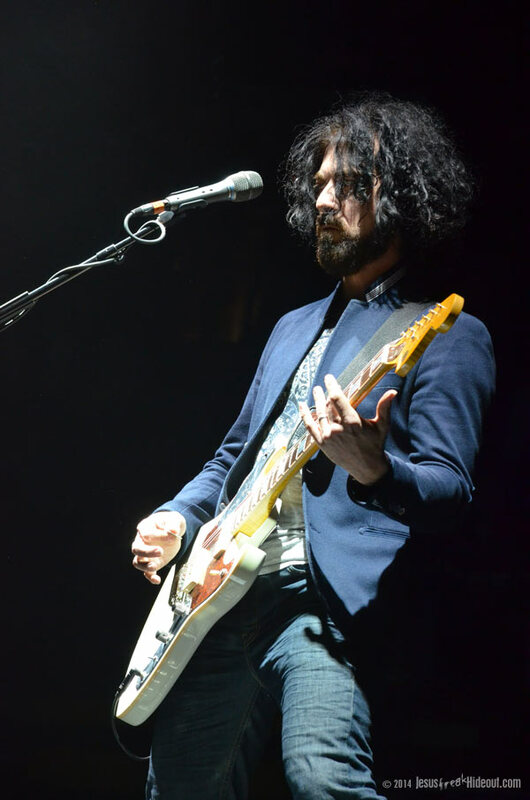 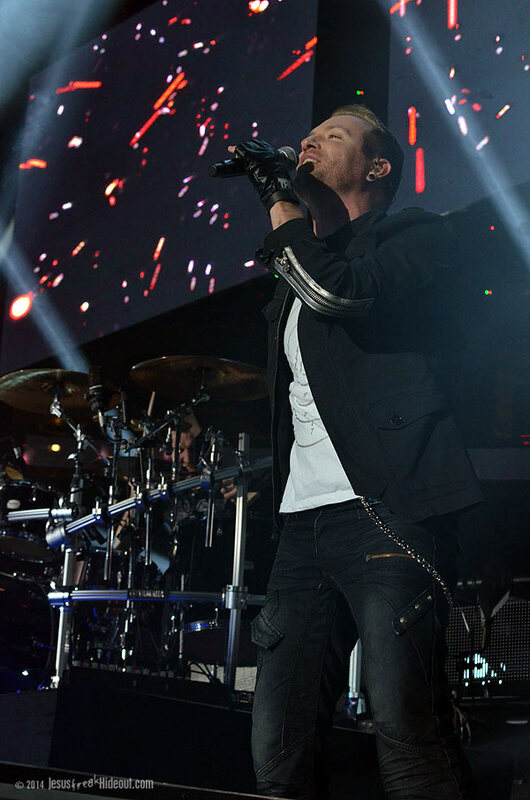 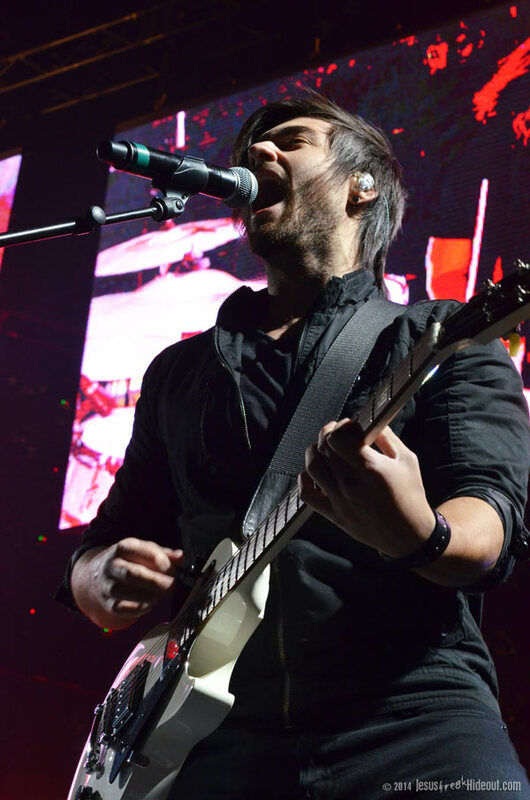 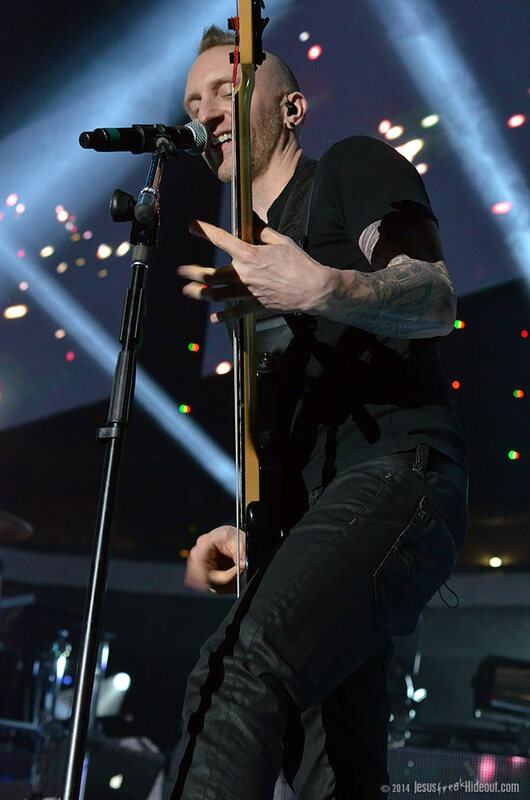 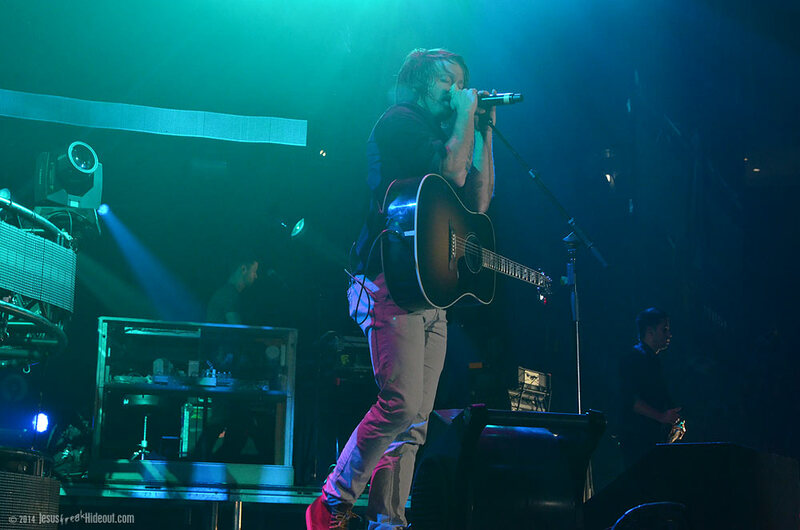 He followed it with the softer anthem "Be Somebody" before closing with the infectious rocker, "Light Up The Sky." 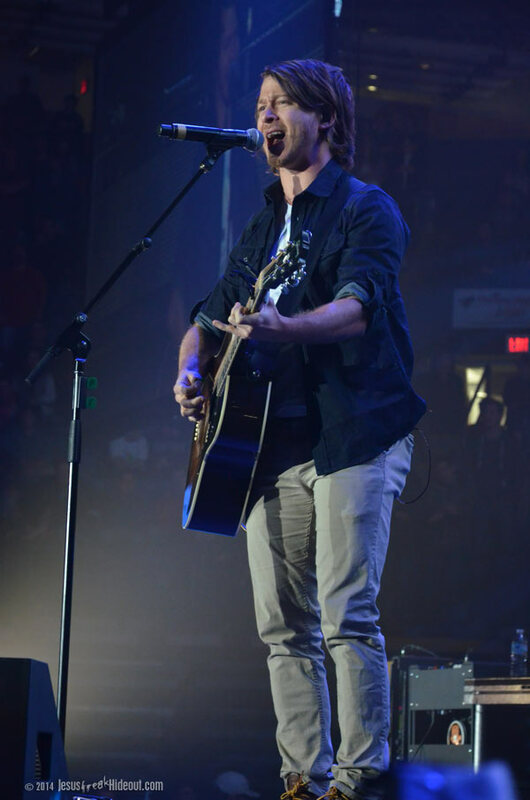 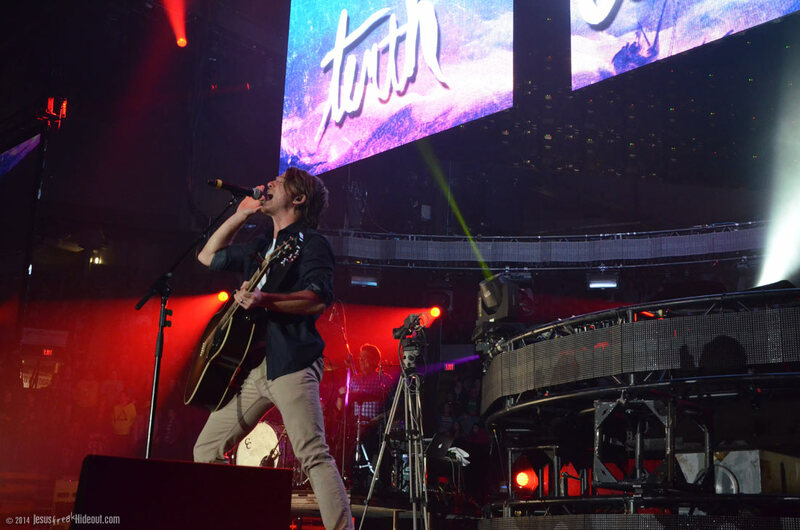 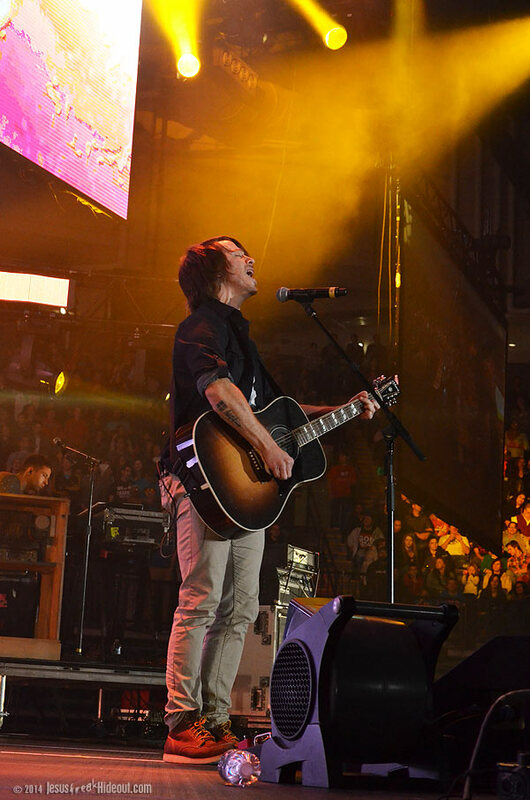 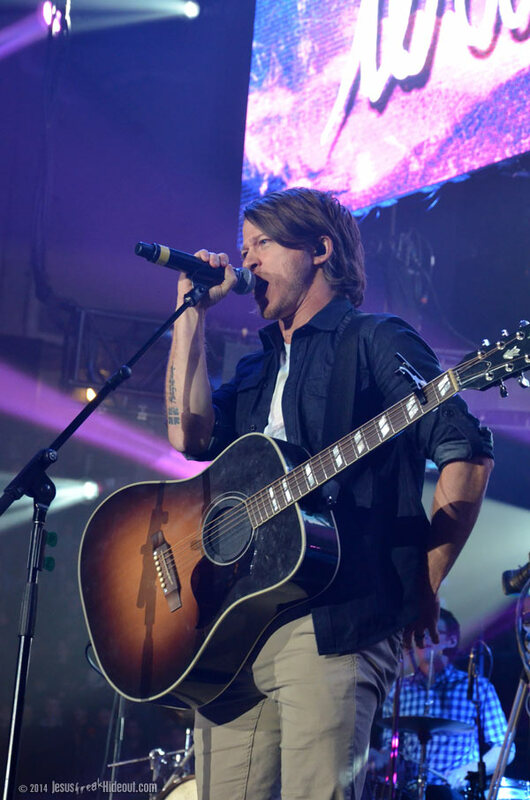 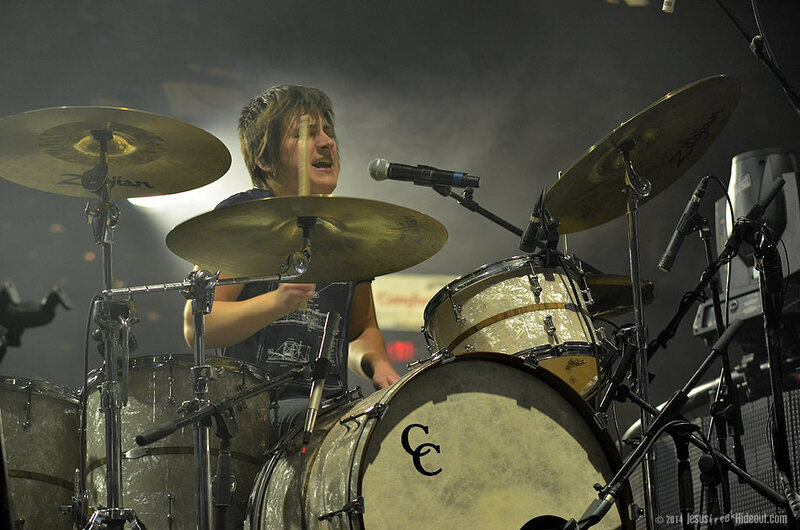 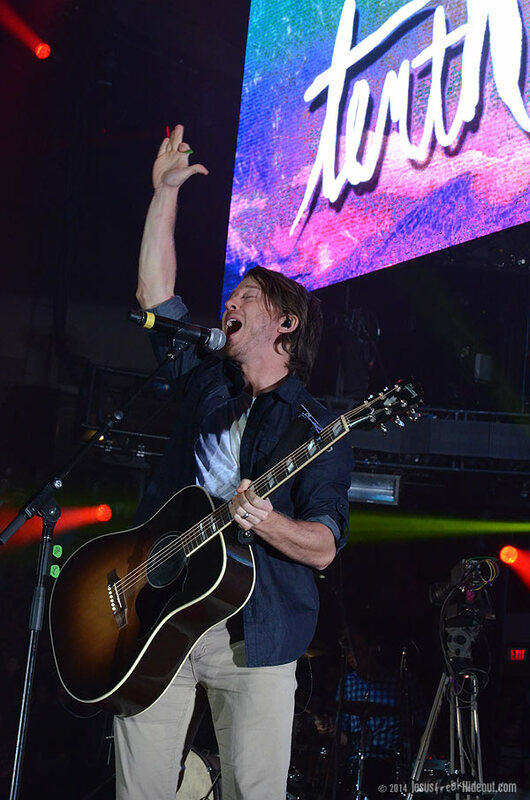 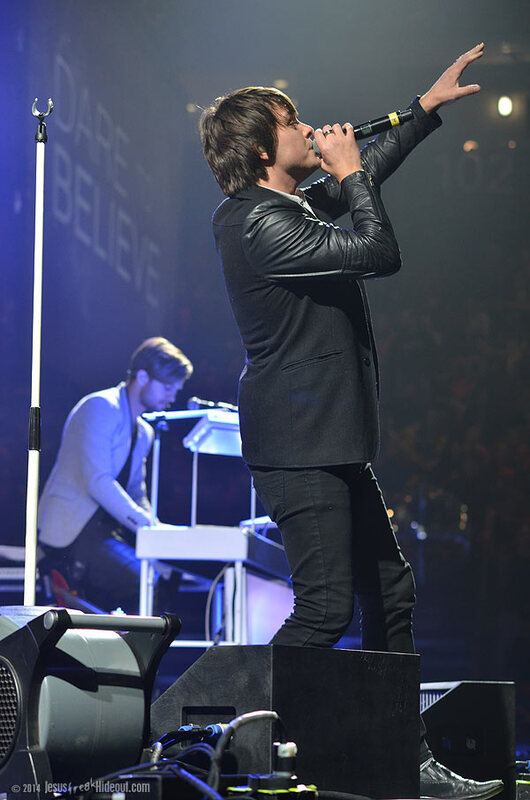 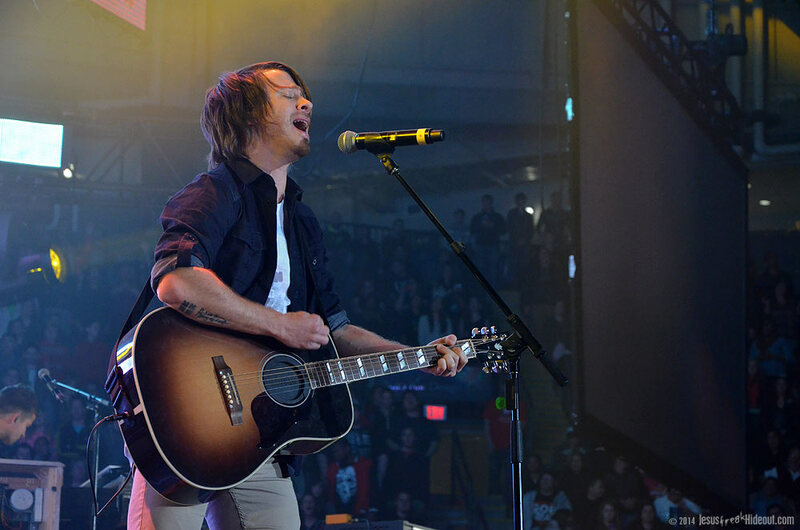 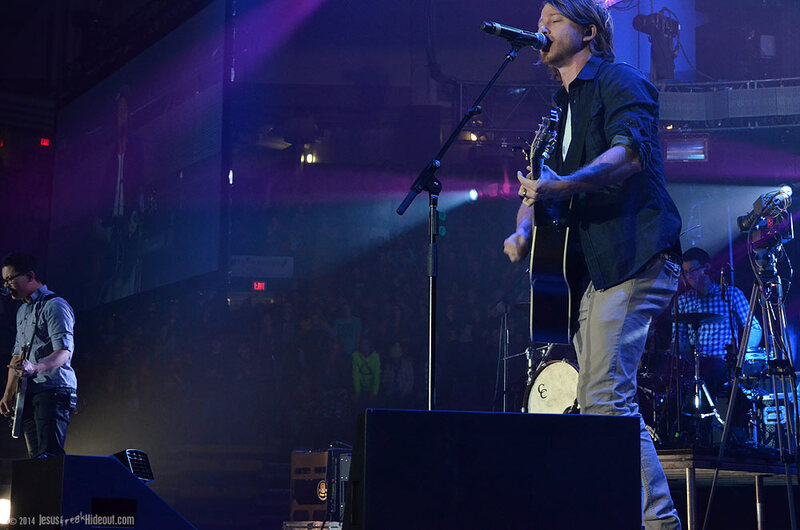 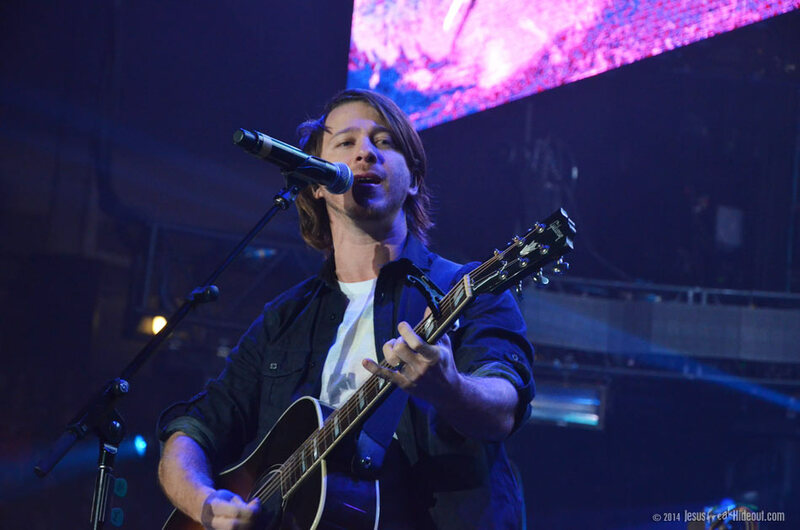 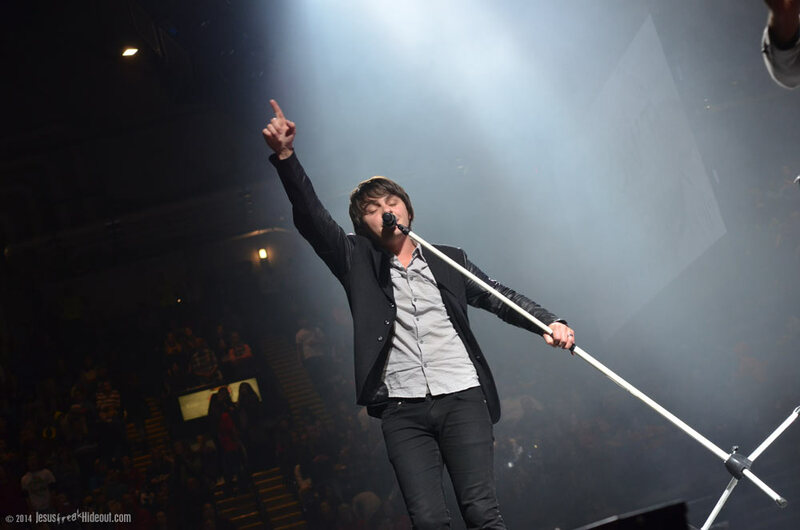 Provident pop act Tenth Avenue North soon assumed the position of center stage with their brand of AC/pop rock. 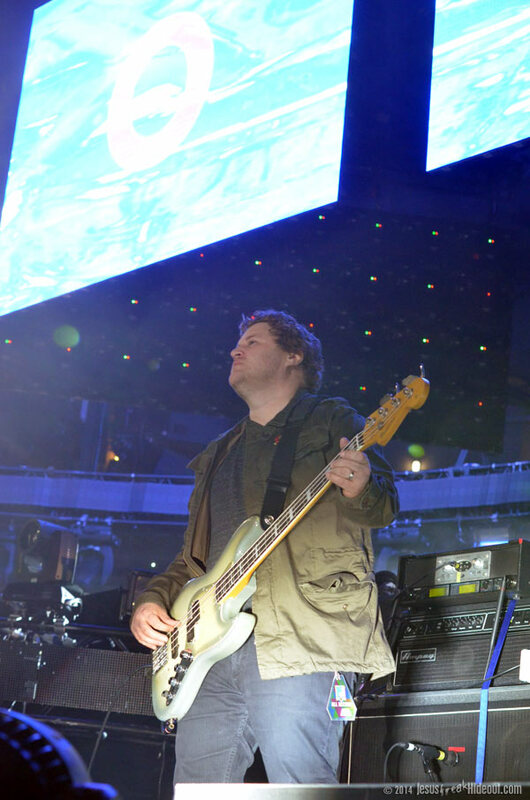 With the opener, "Losing," the guys offered a pretty energetic performance, with guitarist/vocalist Mike Donehey offering one of the more passionate performances I've seen from him yet. 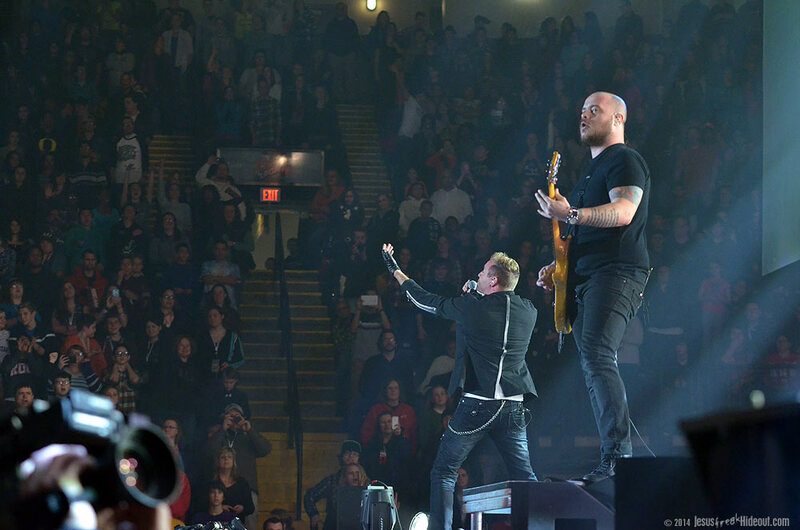 "Strong Enough To Save" from The Light Meets The Dark was next, and then the band performed the title track from their latest record, The Struggle. 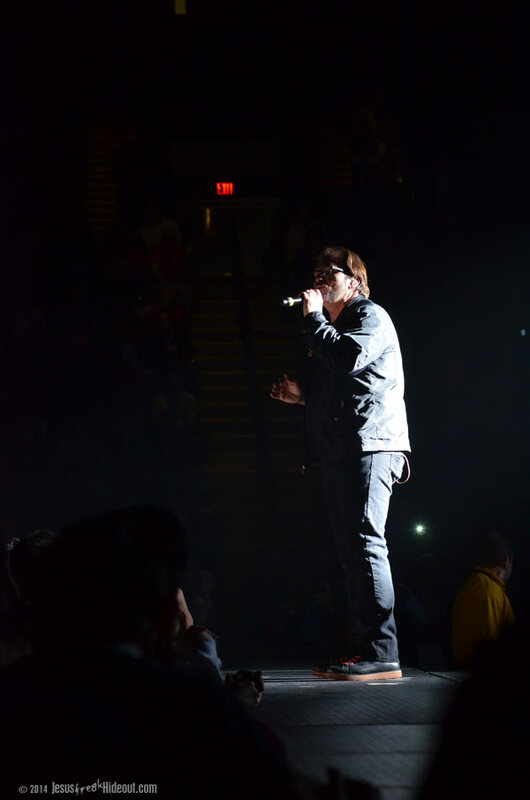 "Worn" was next, and then I took the opportunity to walk around the vending area. 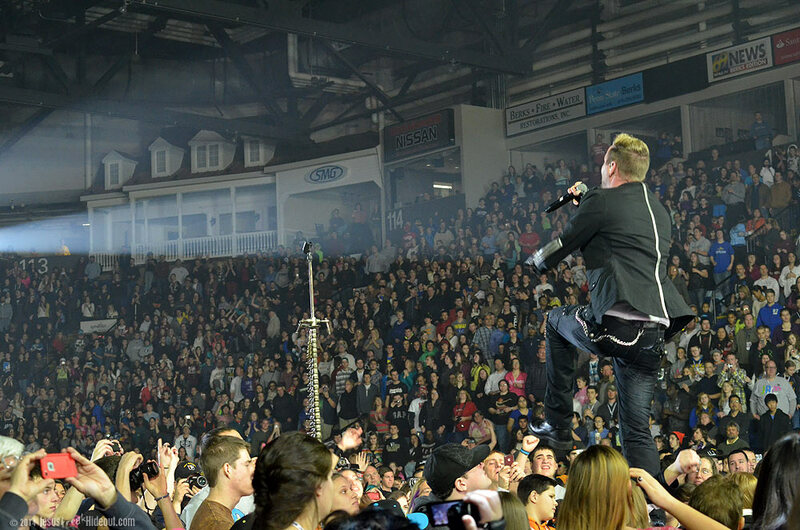 At the Santander Arena, there were lots of food vendors that are part of the arena itself and then merch tables for every artist on the tour were spread out around the entire insider perimeter of the arena. 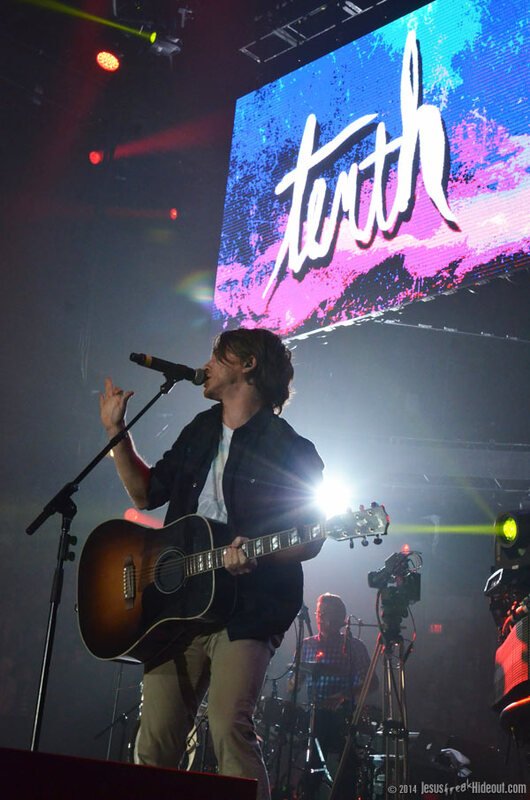 Before their set was over, Donehey continued to take a page out of the book of Jon Foreman (of which he's a big fan of himself) and ventured into the audience to sing along with them and interact with them. 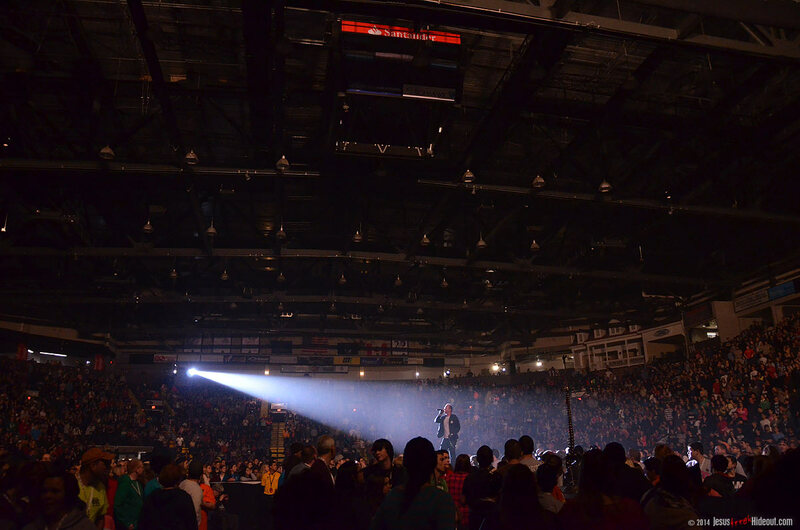 More announcements and an intermission then followed, giving people a chance to visit the vendors or restrooms. 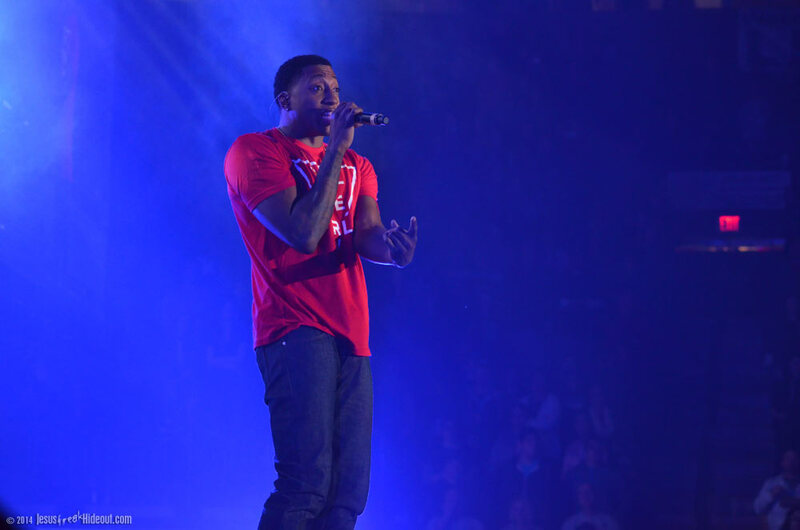 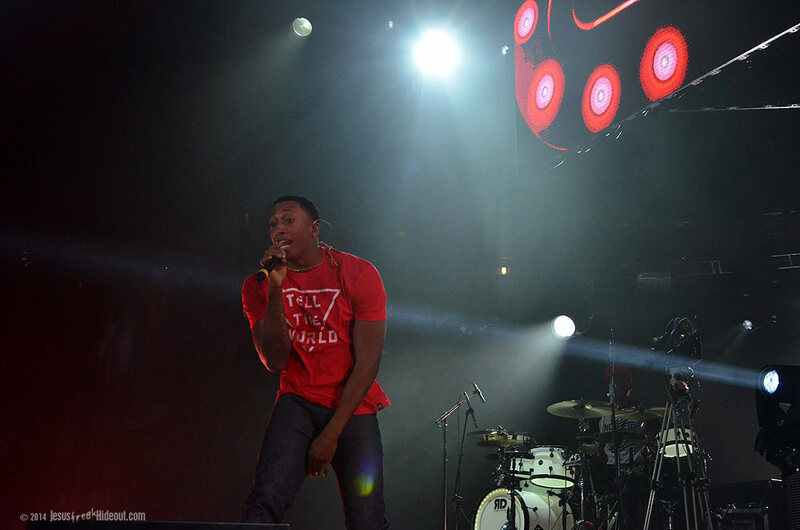 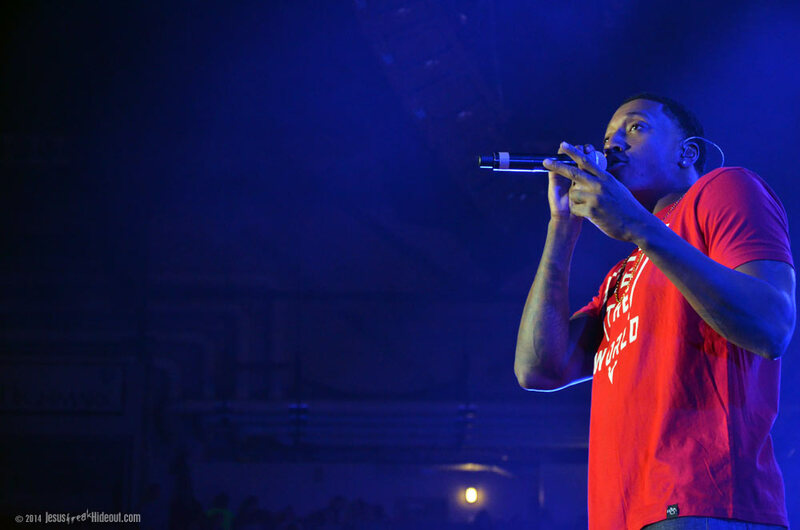 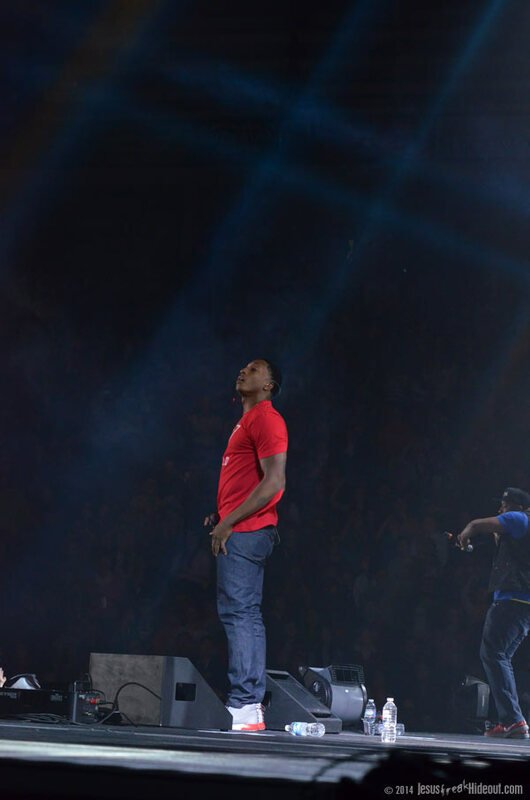 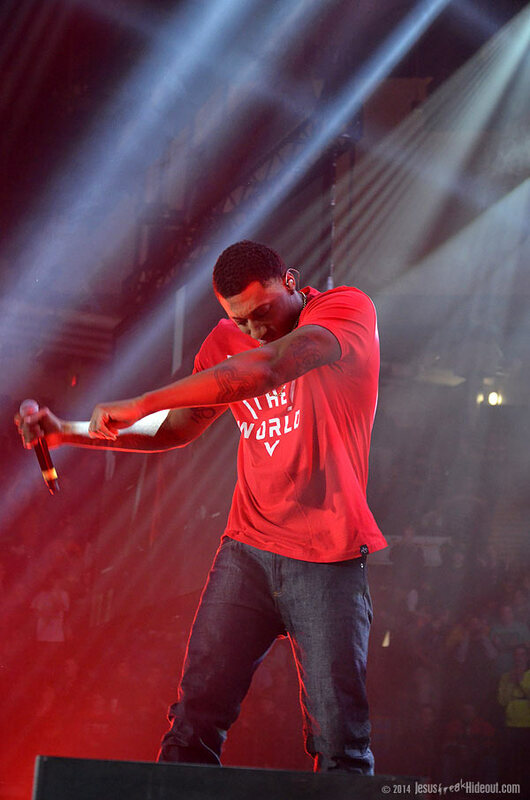 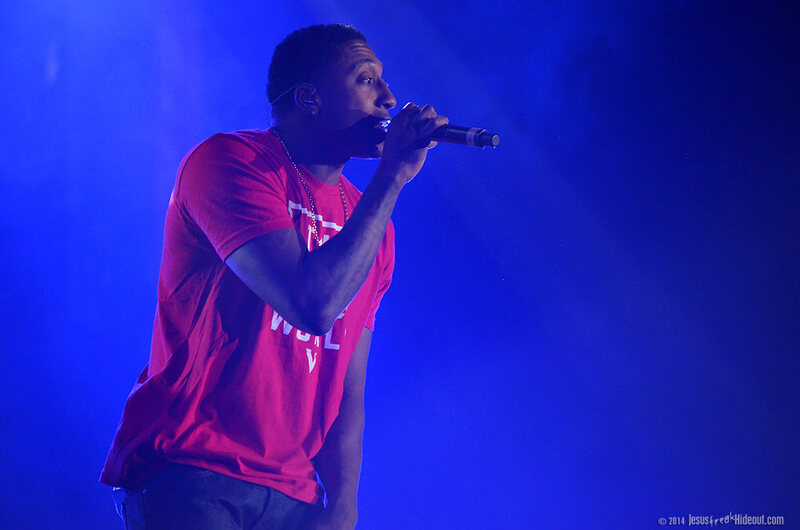 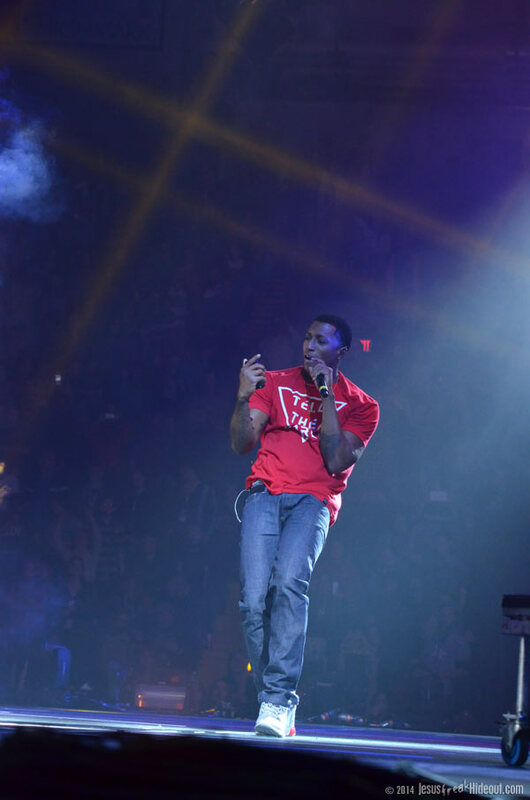 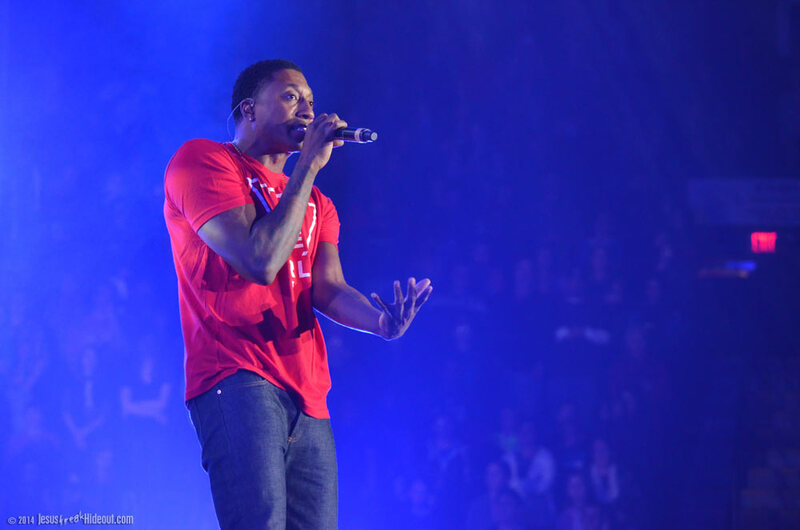 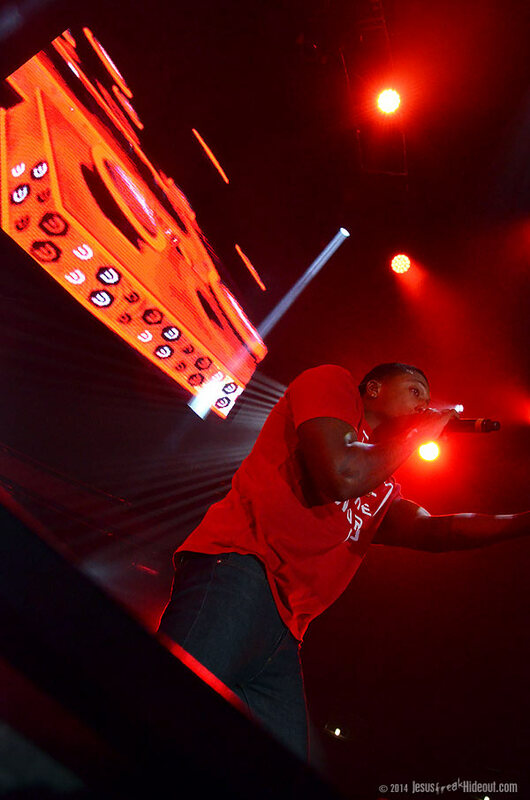 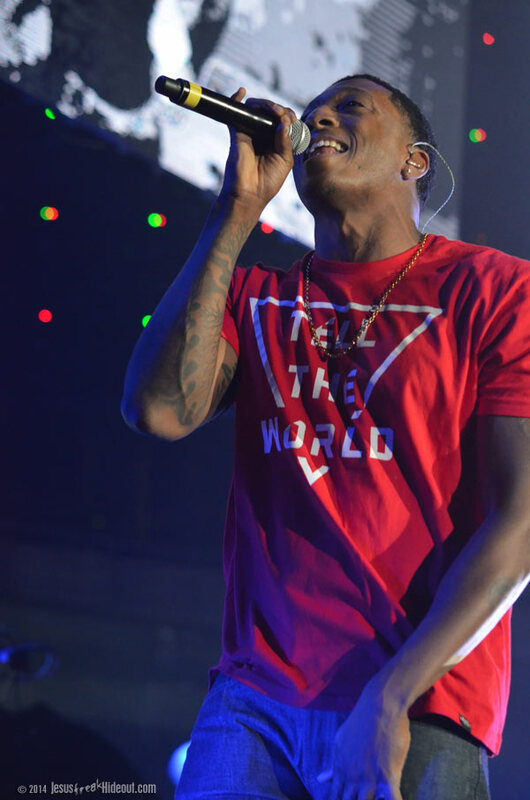 Lecrae hit the stage with brute force, with an entourage to support him. 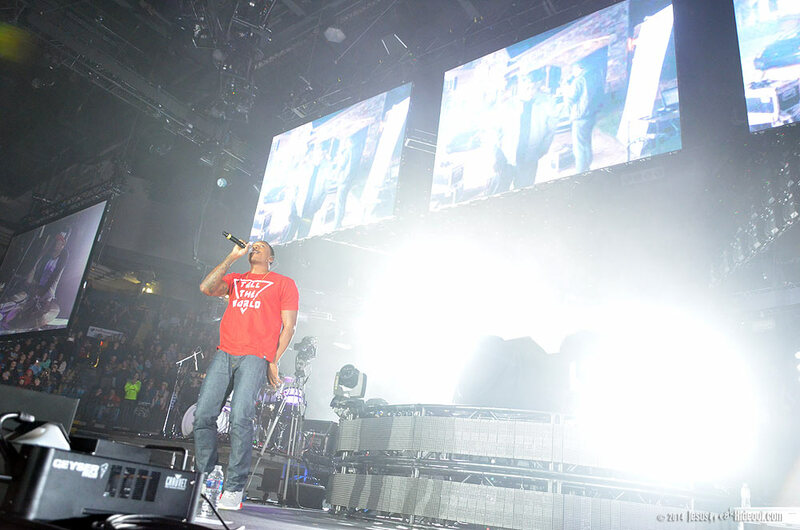 His straight-up hip hop/rap show is still fairly new to see as a main attraction on a major tour, but the audience was hugely into his heartfelt and engaging performance. 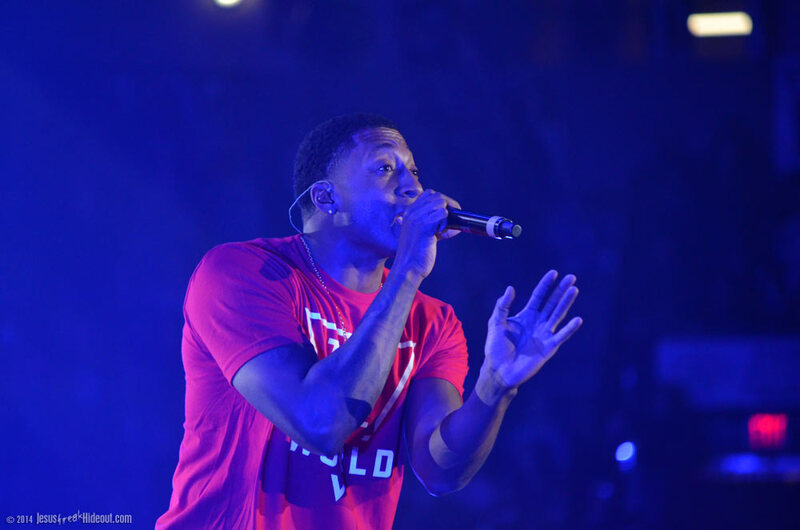 He prefaced his song "Fakin'" by expressing how much he hates Satan and then opened up about his sinful past and how ashamed he is of it. 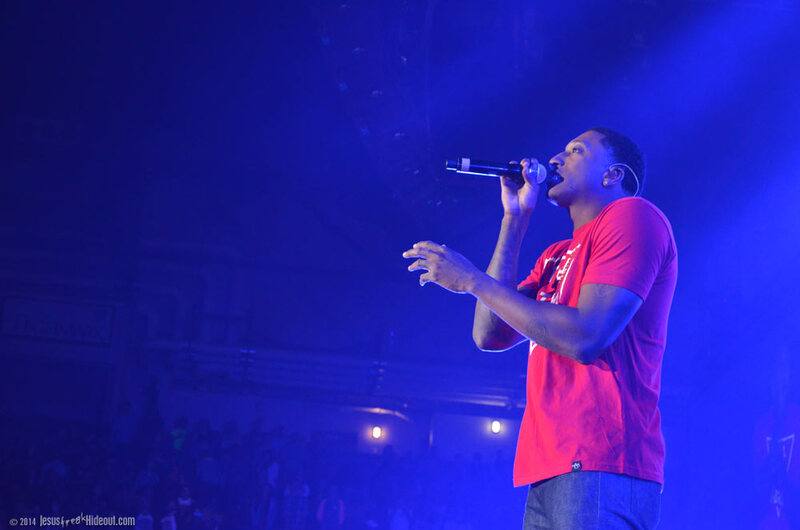 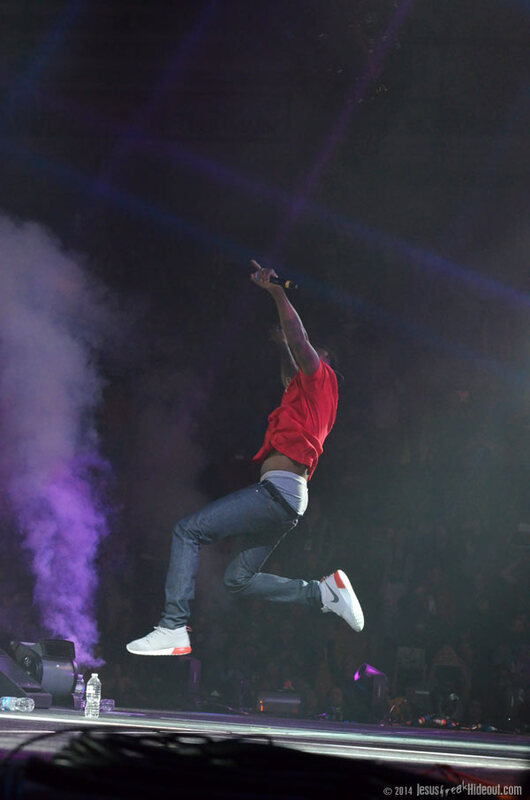 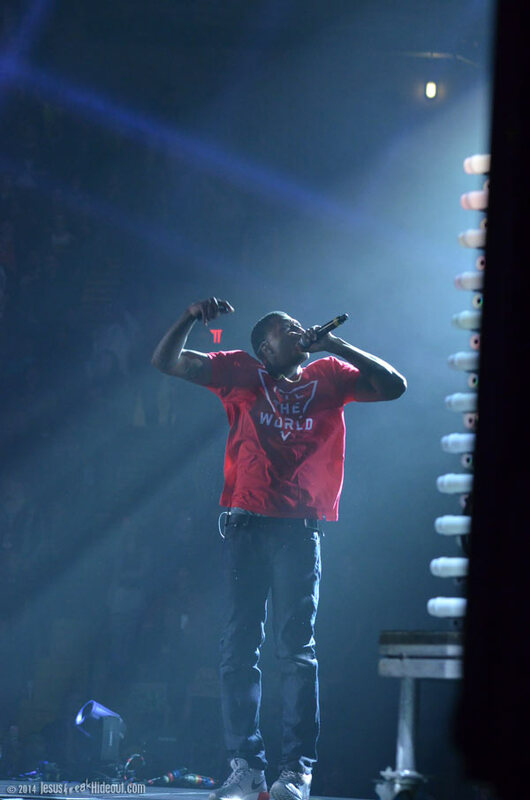 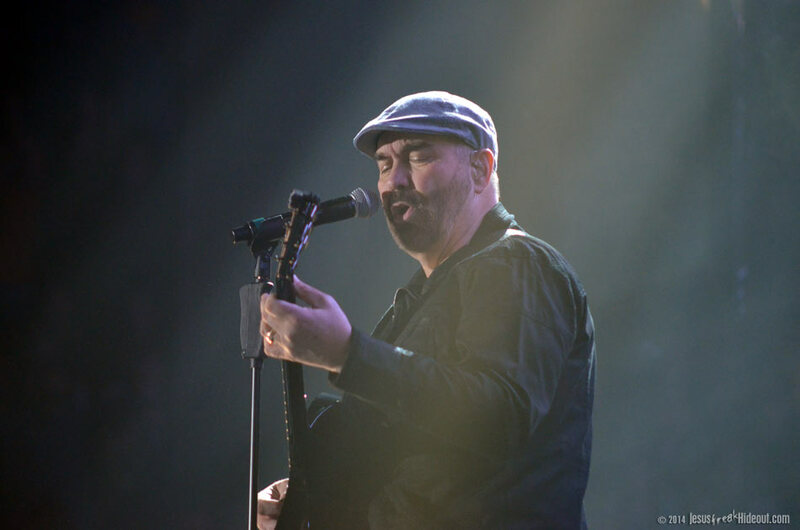 He encouraged the audience to not see him as anything other than a flawed man redeemed by God's grace, and continued to share his testimony as he performed "No Regrets." 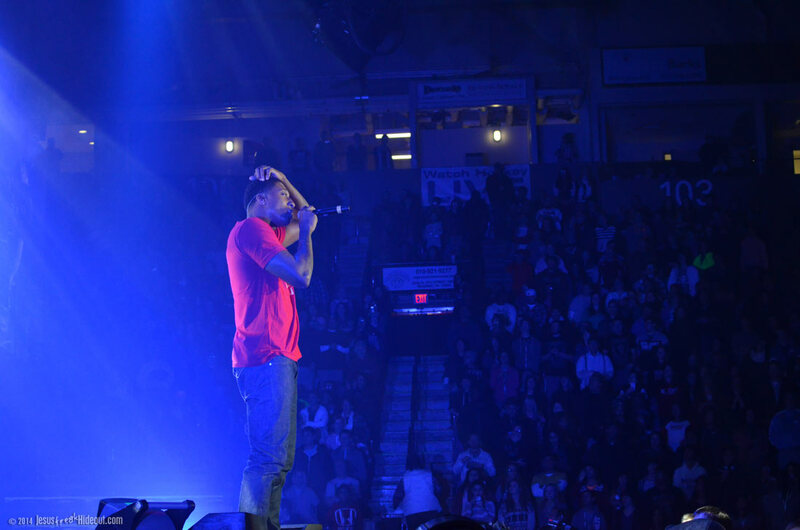 "Background" was next, and then his music video for "Tell The World" played on the screens behind him as he performed that song. 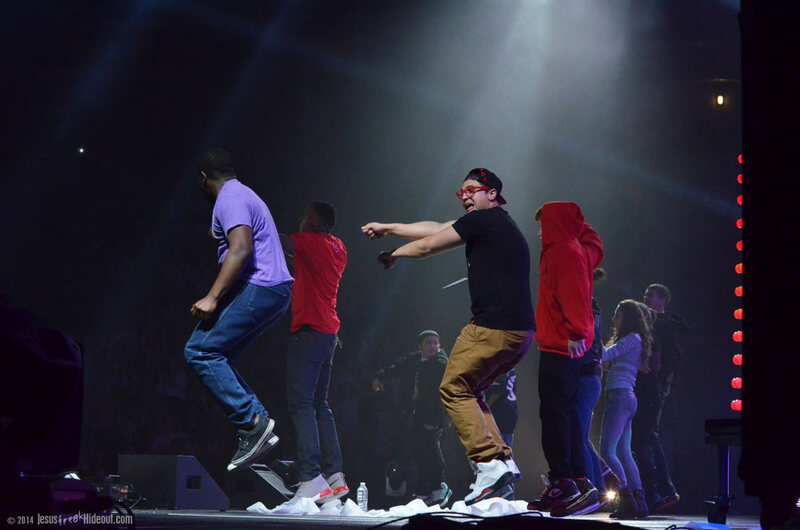 "I Know" followed, and then Andy Mineo's "Uno Uno Seis" served as his set finale as toilet paper littered the stage and fans joined the rapper to jump and dance around with him. 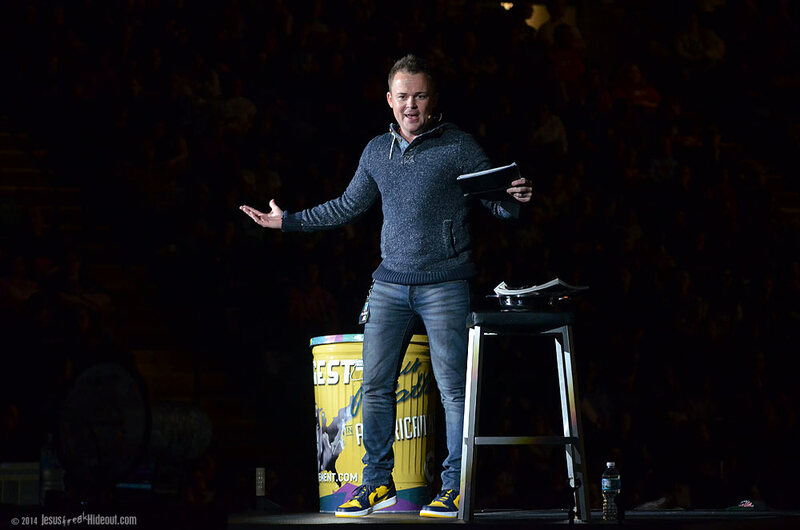 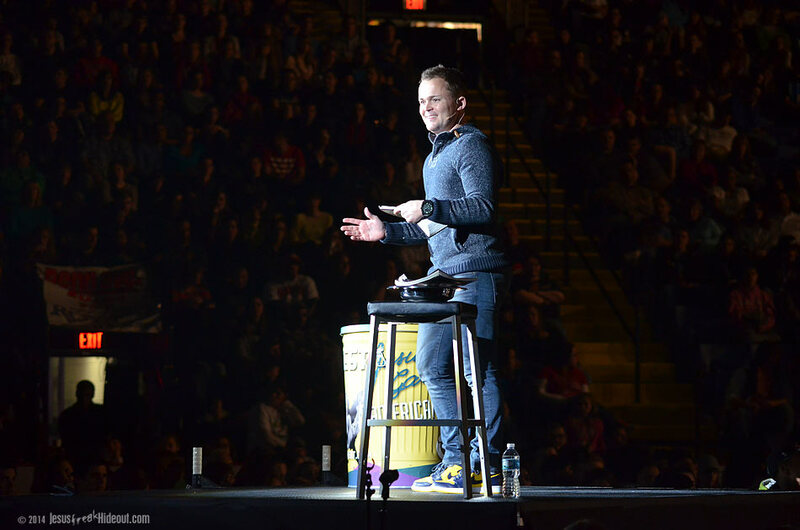 Newsong's Russ Lee emerged to present a message about giving and prosperity in giving and asked for a love offering for Winter Jam. 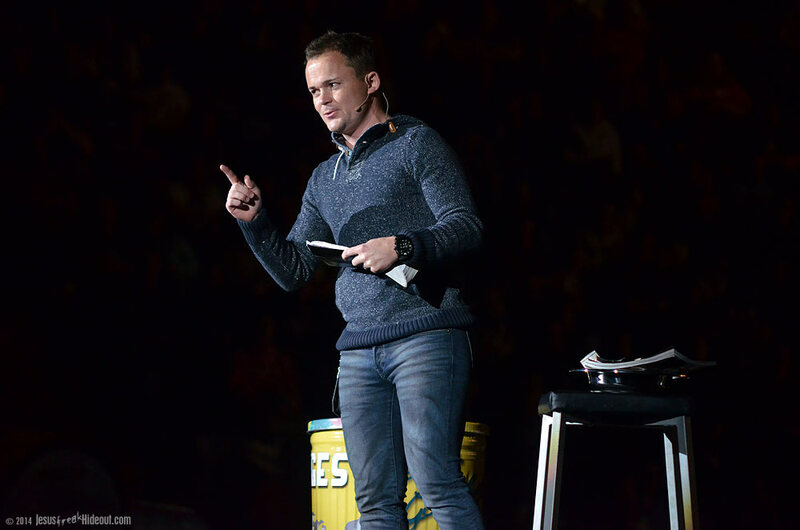 They then passed buckets around the auditorium for people to give whatever else they could to help defray tour costs. 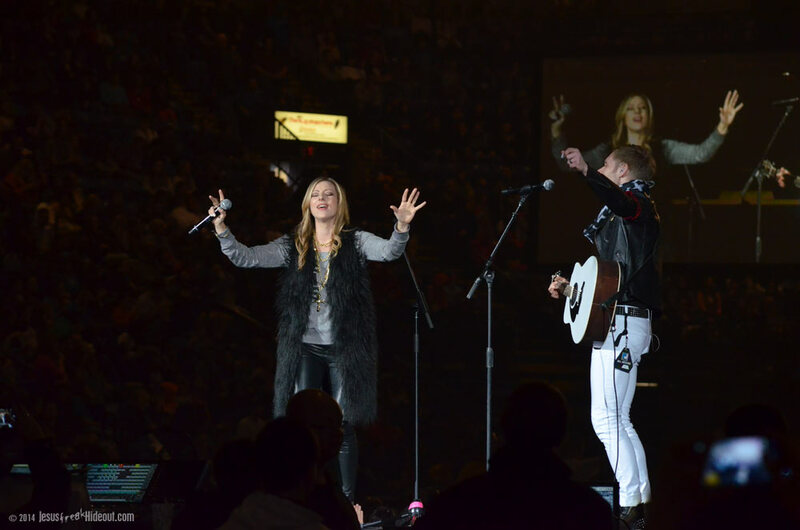 Love & The Outcome then took the B Stage to perform an acoustic rendition of Chris Tomlin's "How Great Is Our God" before Nick Hall came back out to share a little bit more. 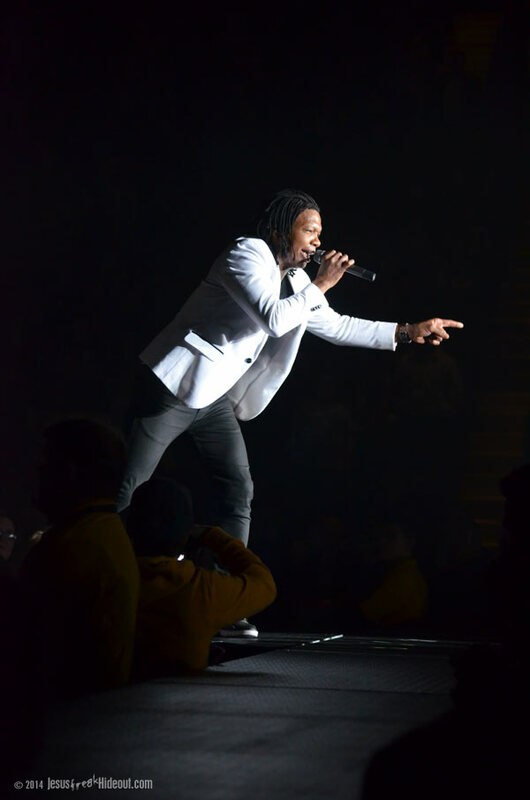 Then, as the night heated up for its final act, an electronic voice announced every couple seconds (for about a minute) how much time it would be before Newsboys were to perform. 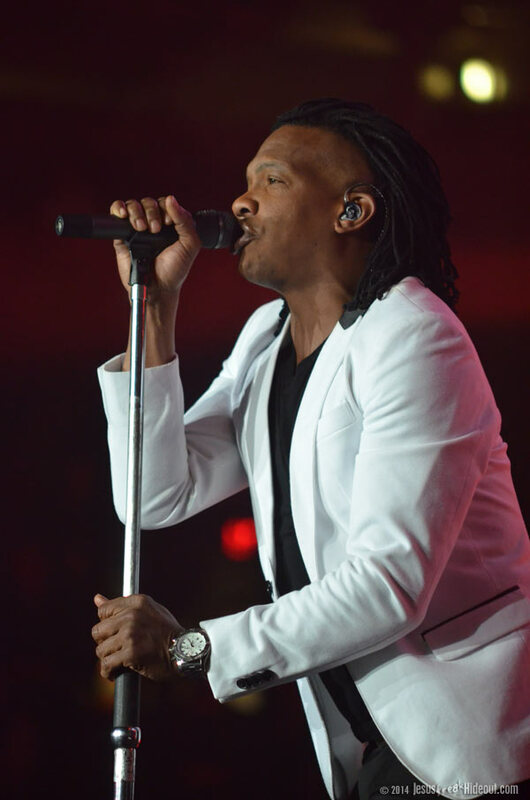 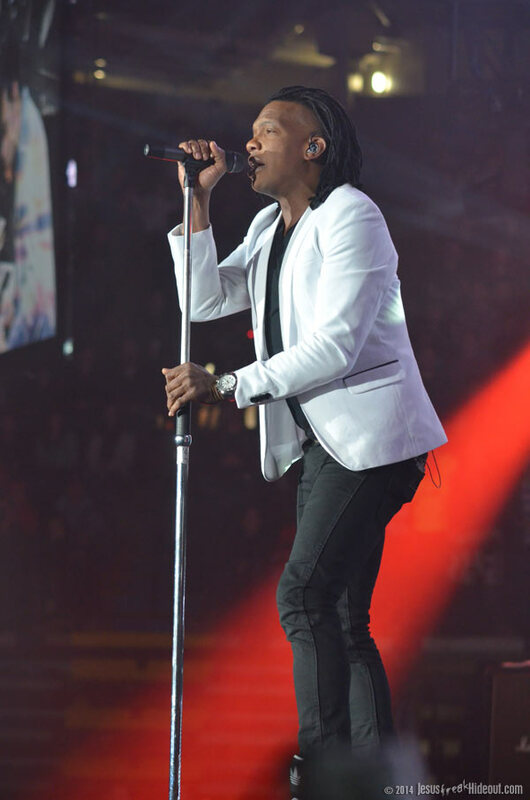 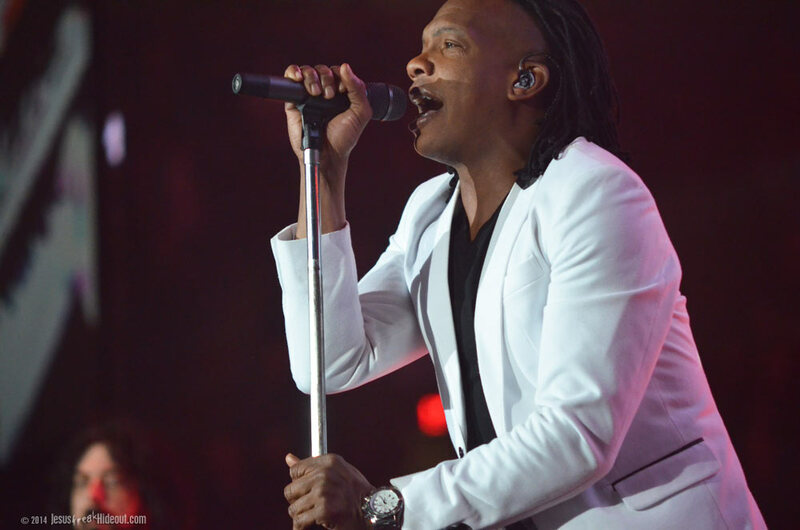 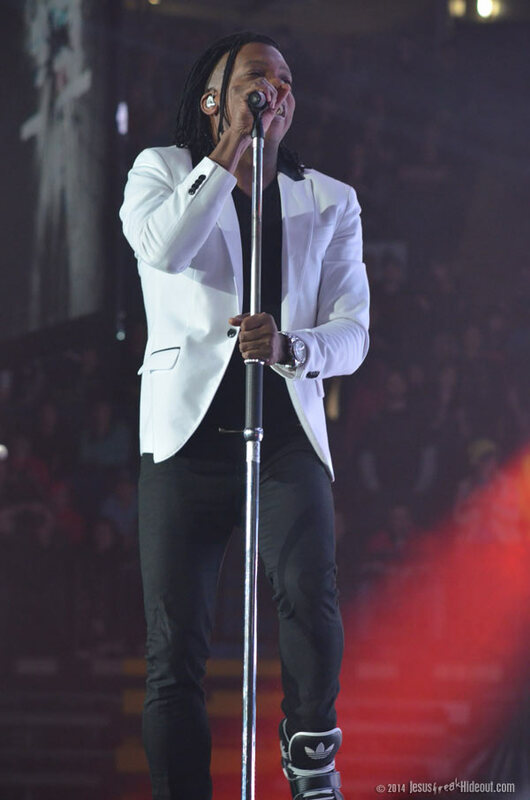 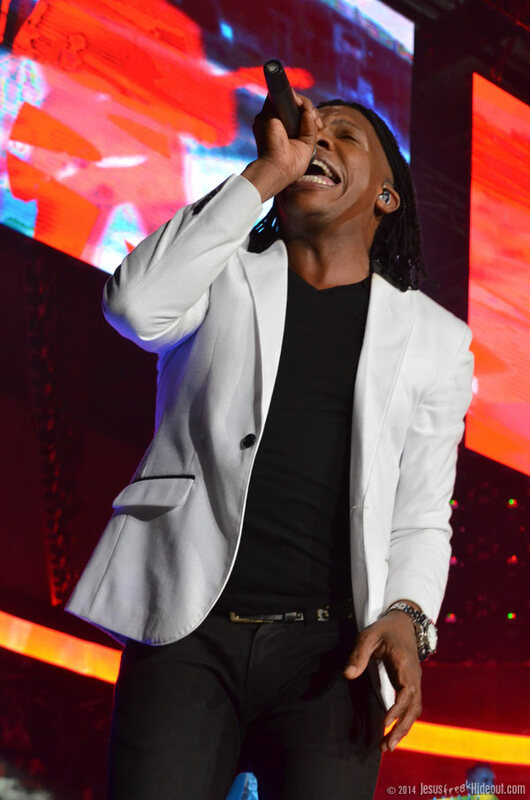 With a voice saying it has begun, Michael Tait and the Newsboys opened their set with "Born Again," the title track from Tait's inaugural album with the band. 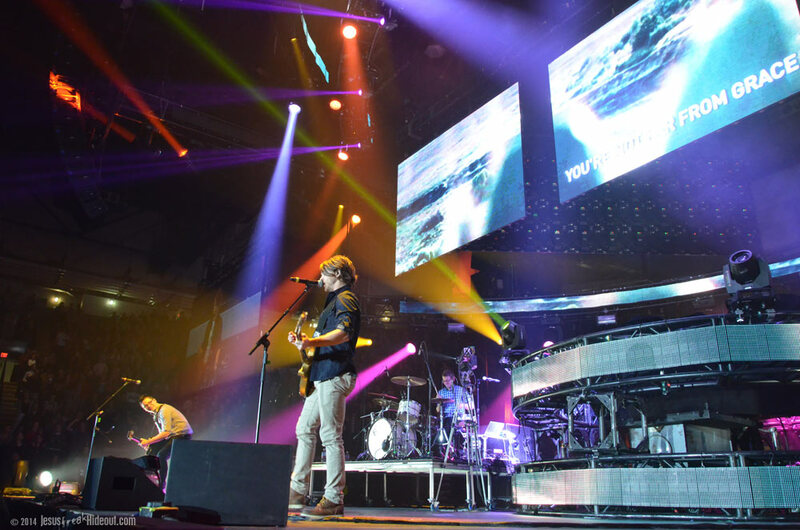 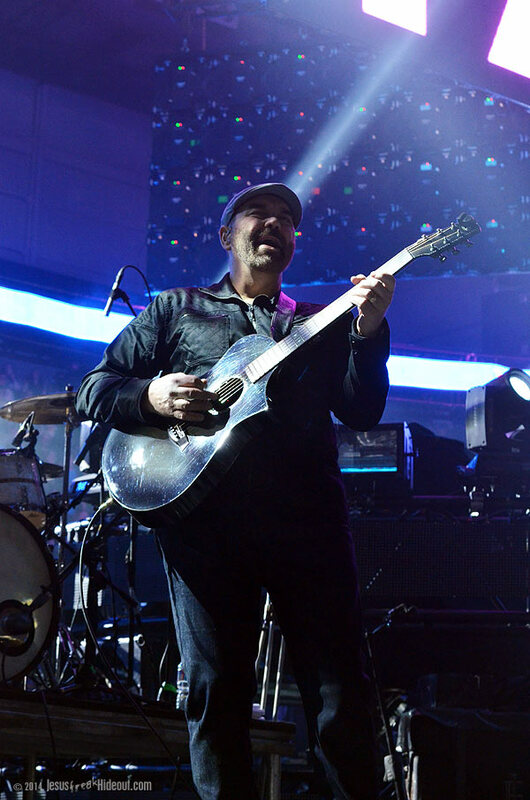 They then offered the catchy anthemic title track from new album Restart and then performed two more new songs, "Fishers of Men" and the dubstep-tinged "That's How You Change The World." 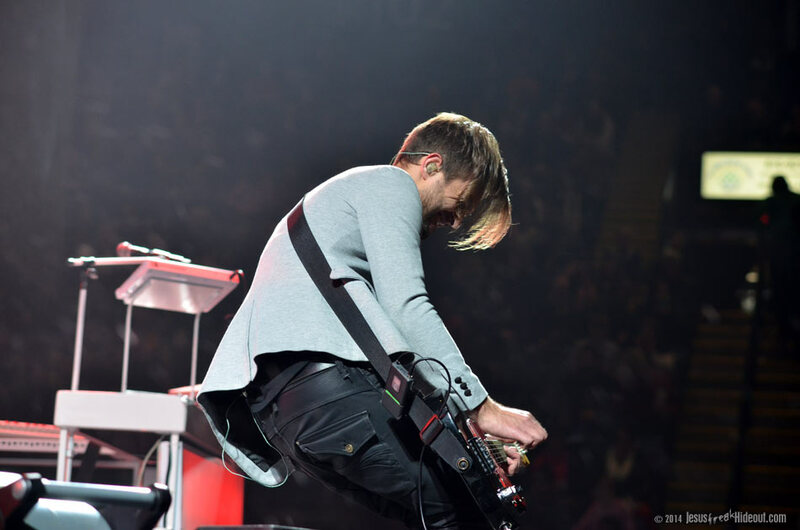 While on the T-shaped catwalk, Michael talked about how easy it is to get comfortable and not want to leave our beds in the morning, but that we need to get out and live our lives with abandon, which served as an intro into Restart's first single, "Live With Abandon." 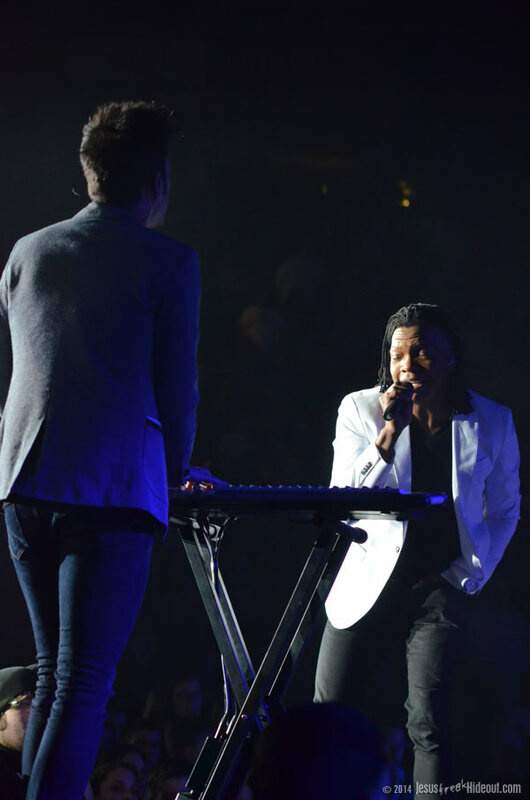 Classic Newsboys worship original "He Reigns" was next, and then Jeff Frankenstein grabbed his piano and walked out to the end of the catwalk as Michael began to share about how his mother passed away in September (just two days after the release of Restart). 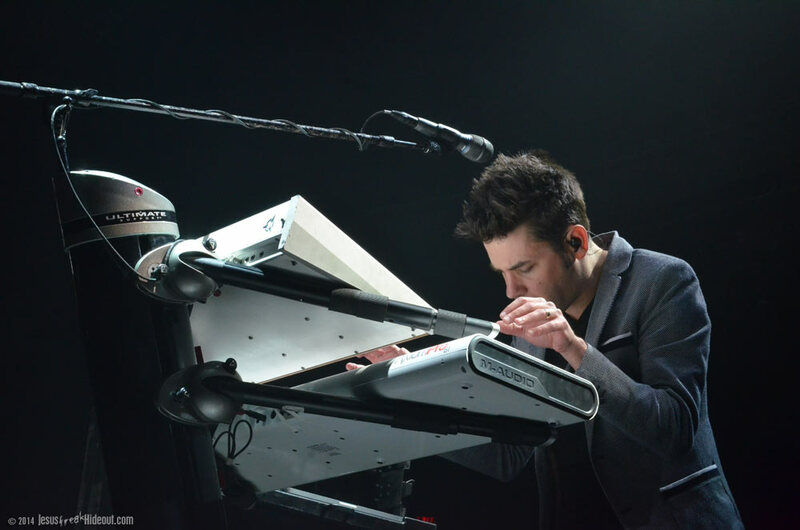 He talked affectionately about growing up in his mom's care and then performed the piano ballad "That Home" with Frankenstein. 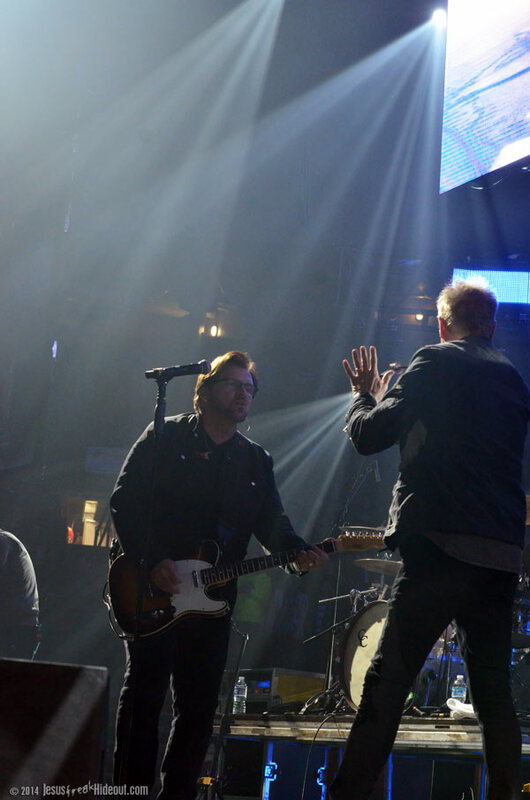 After they returned to the stage, Tait encouraged the audience to love and hug and appreciate their moms, and then launched into their cover of the worship anthem "We Believe" (which sounded great live, although it still reminds me a lot, lyrically, of a simplified version of Rich Mullins' "Creed"), and then they performed "Something Beautiful" from GO. 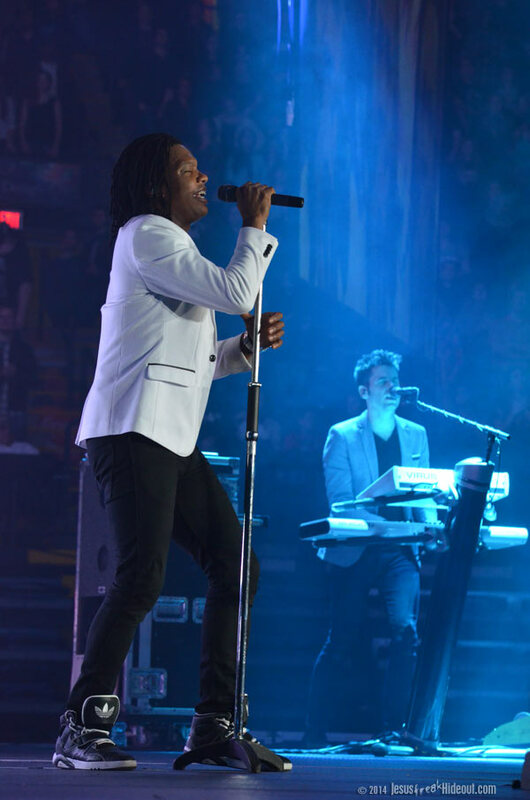 With Newsboys having three albums now with Tait at the helm, it seems a little strange that they still play older material from when Peter Furler was the vocalist. 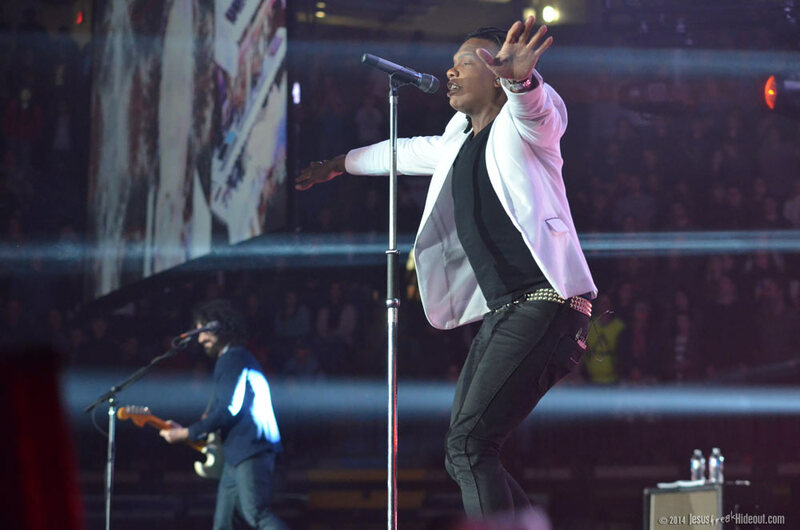 But, perhaps even more curiously, Newsboys are still playing DC Talk's "Jesus Freak" in their set as well. 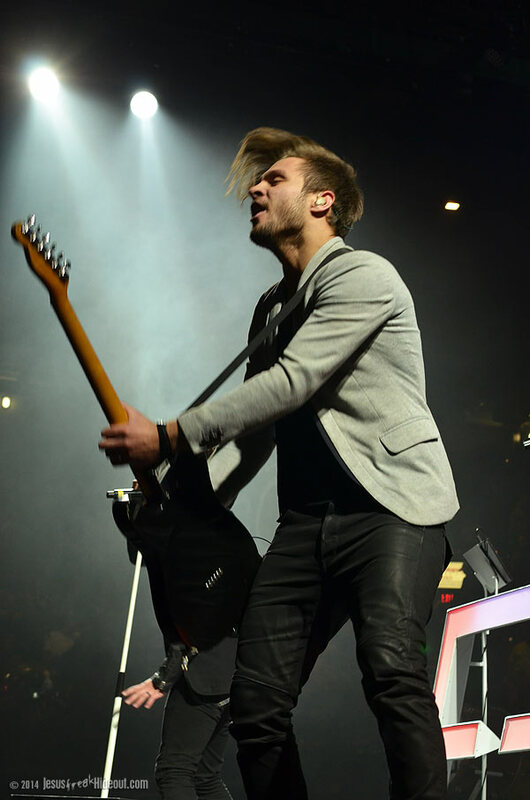 Tait prefaced the popular song by saying that Restart is an album he's as proud of as 1995's Jesus Freak and then the guys launched into it. 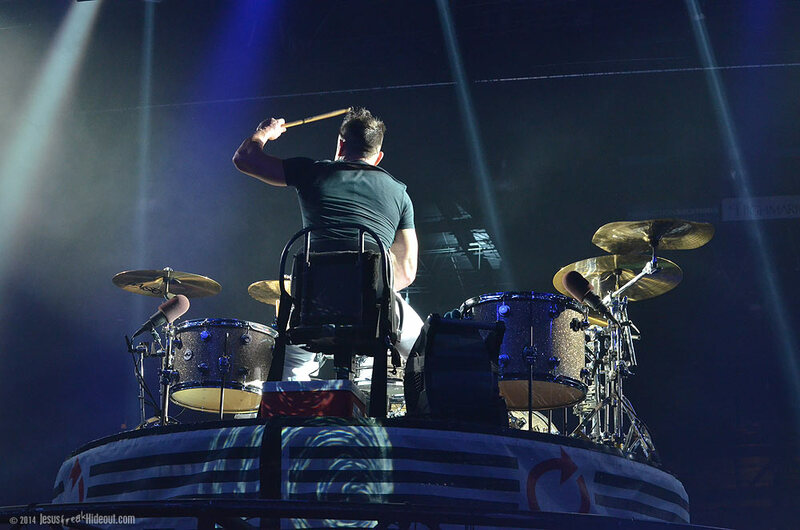 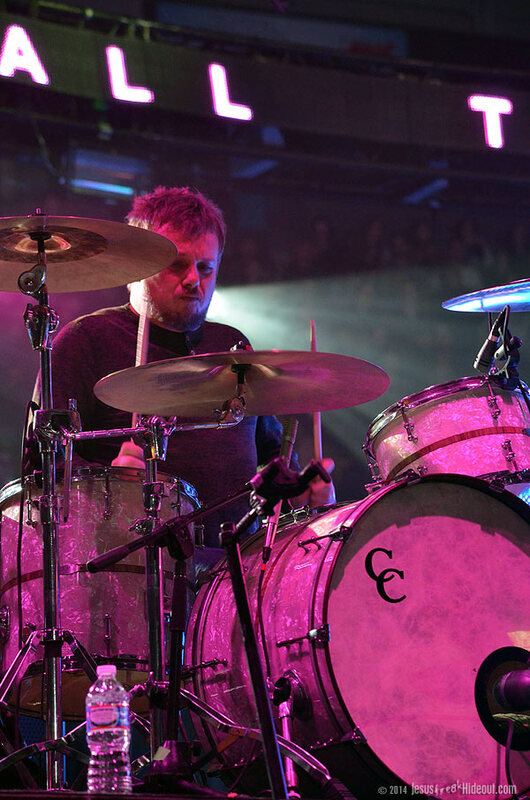 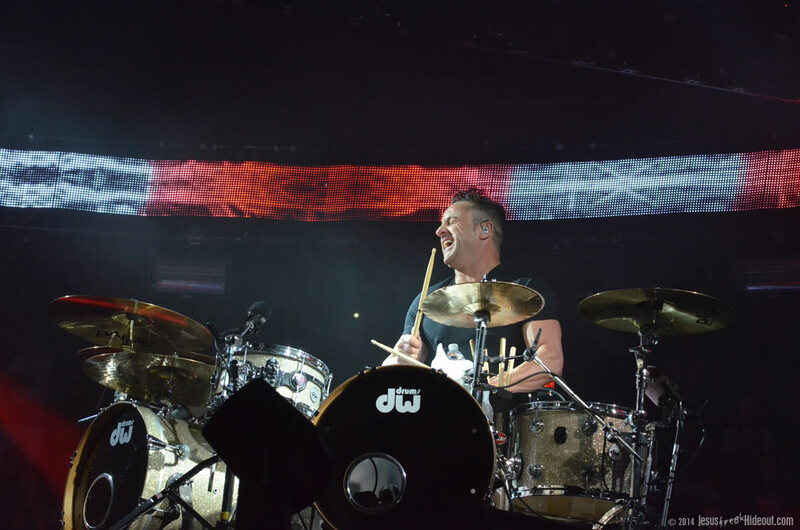 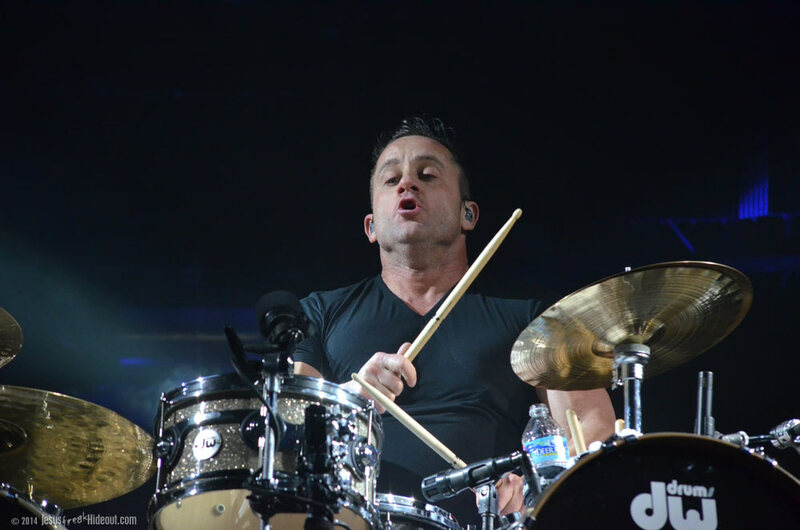 Midway through the song, Duncan Phillips's drum set rose into the air slowly and then tilted forward and began spinning (with his head almost being taken off by one of the stage screens dangling just a bit too close to the top of the drums) and then descended back to the stage floor for the end of the song. 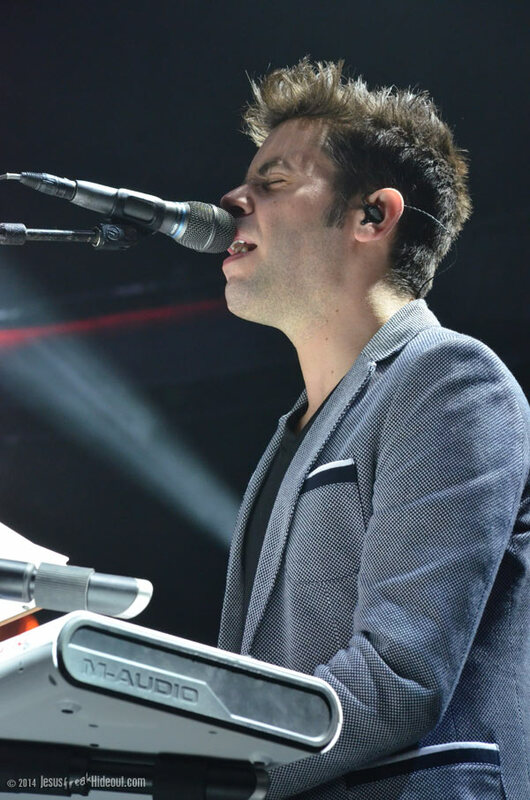 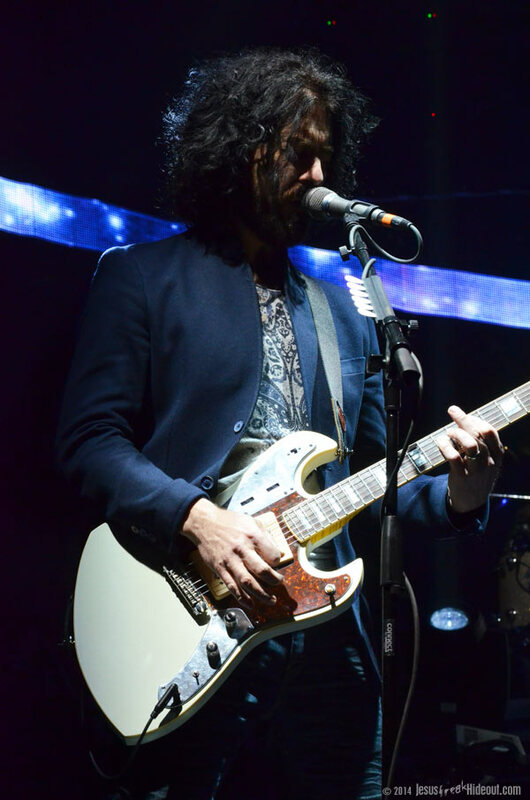 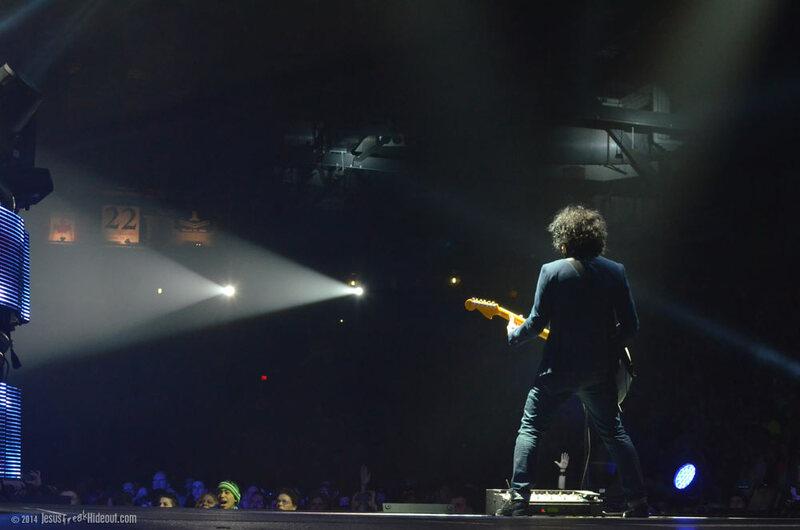 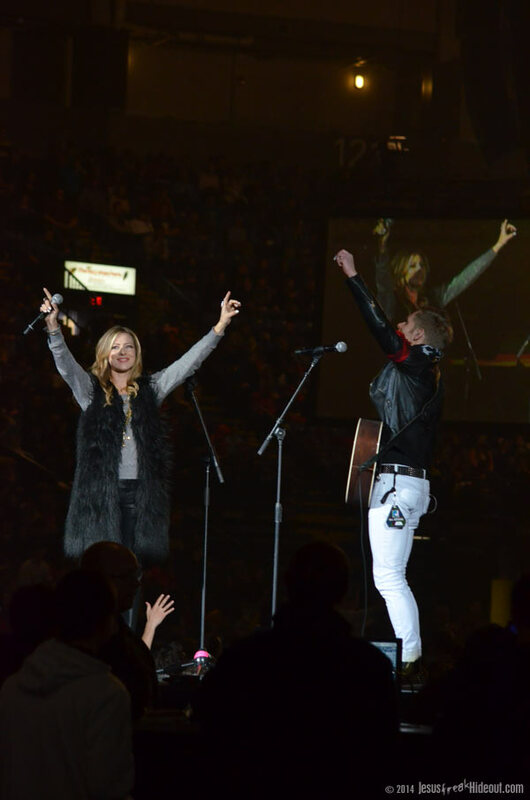 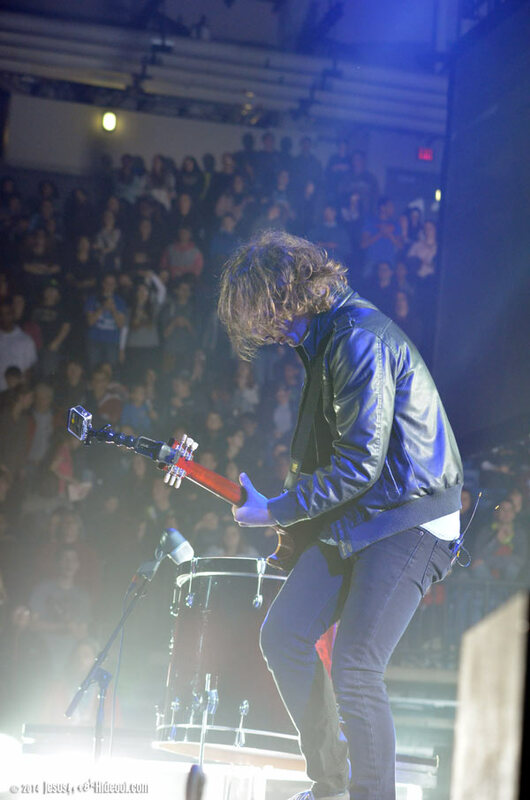 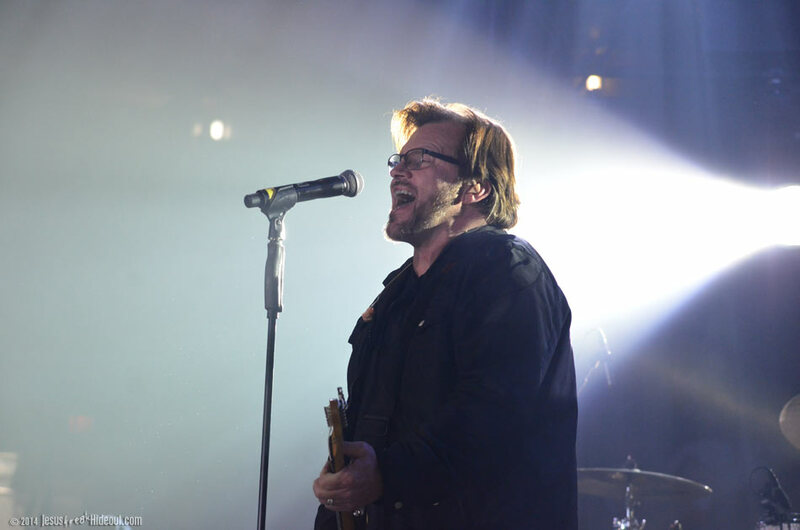 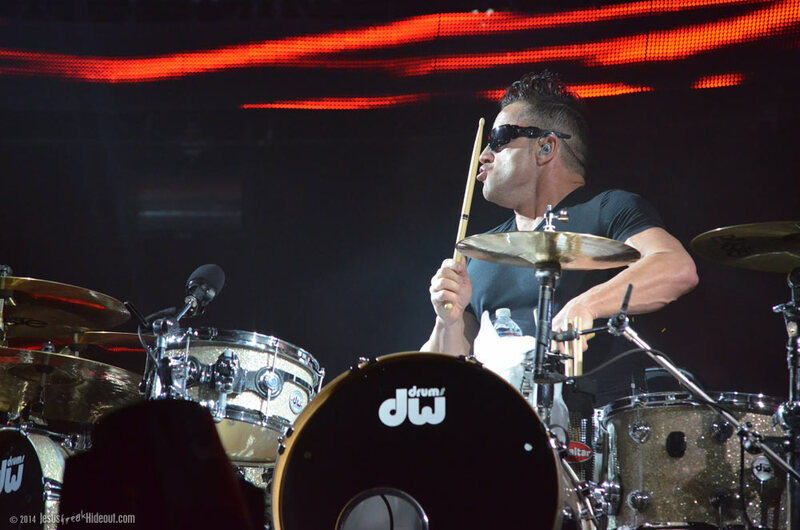 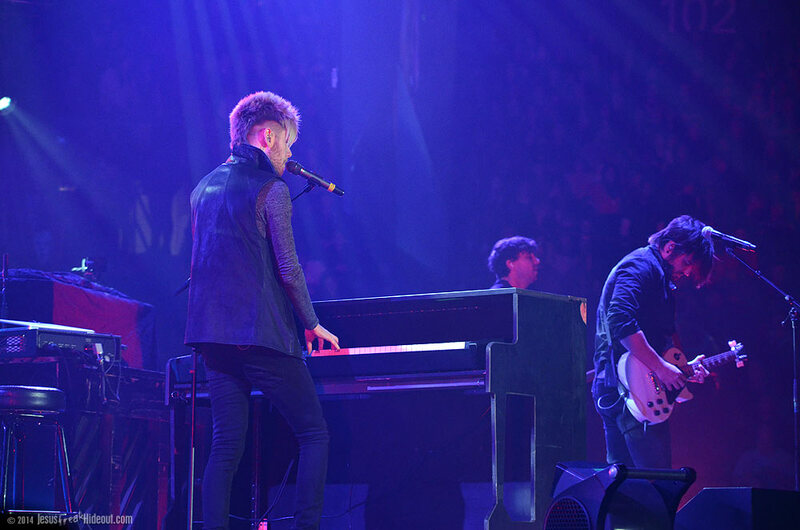 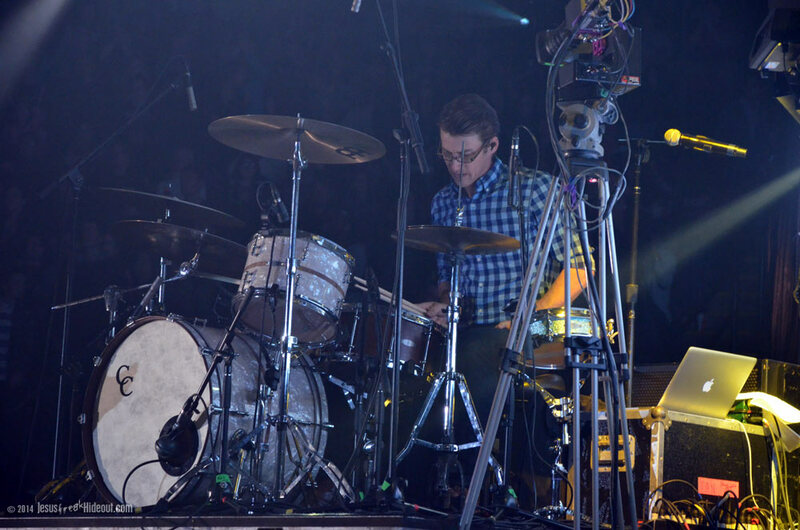 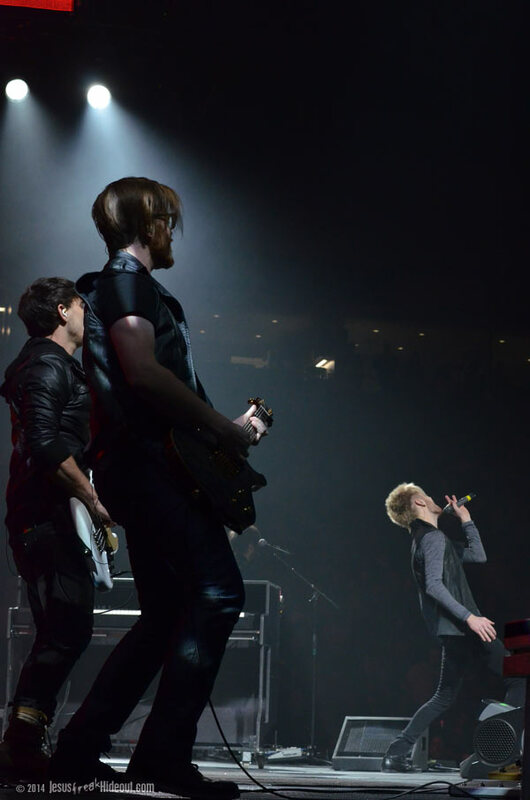 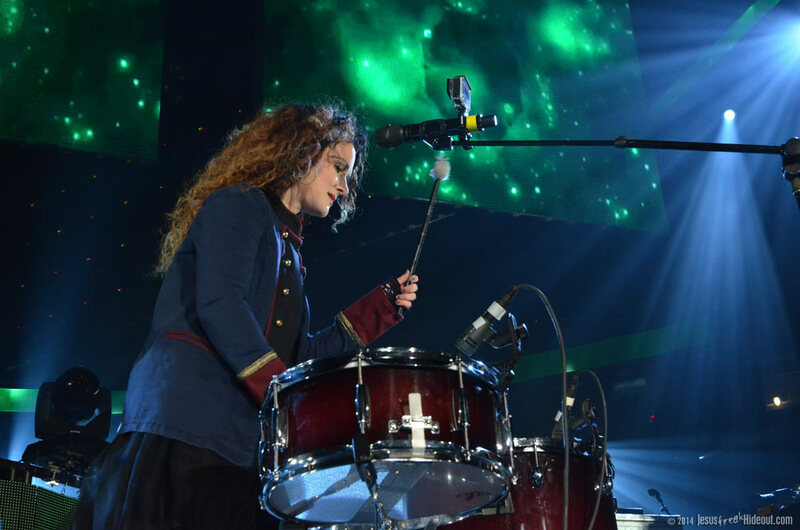 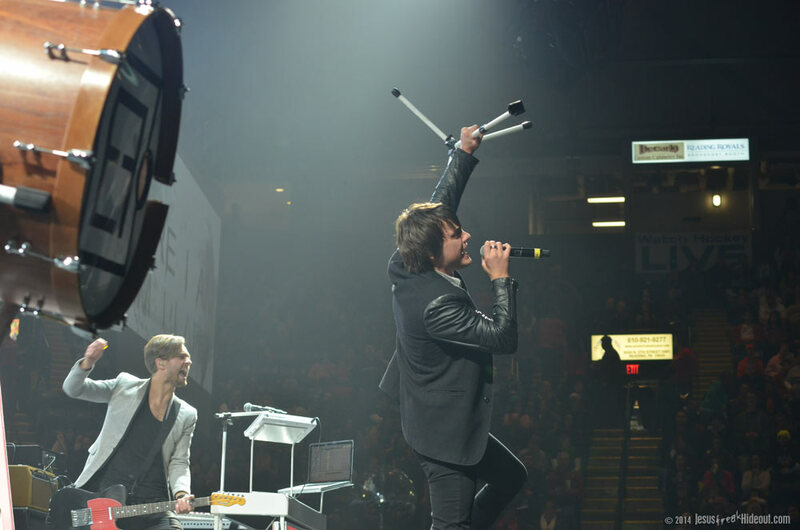 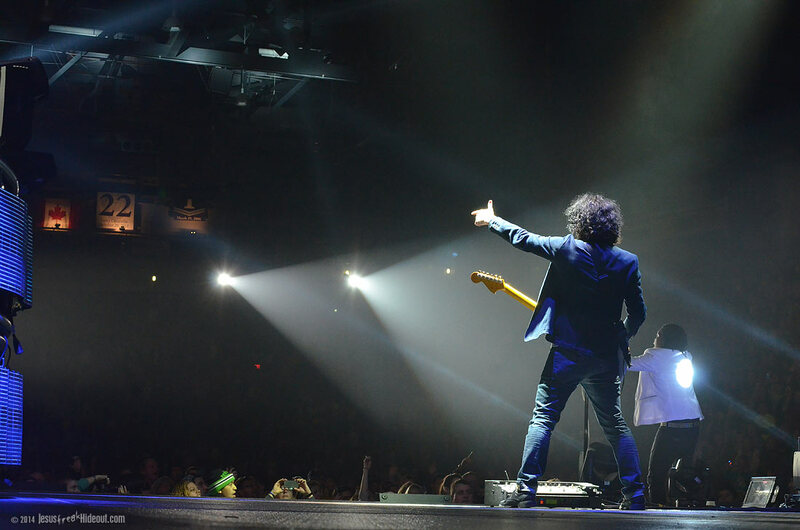 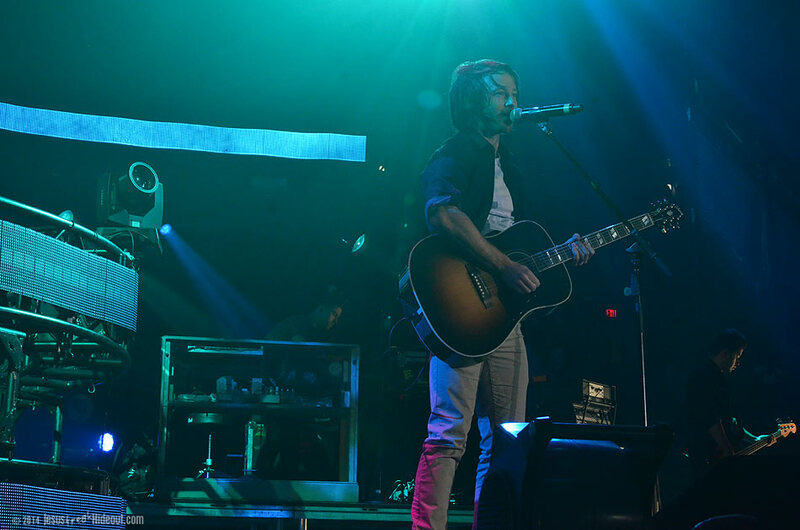 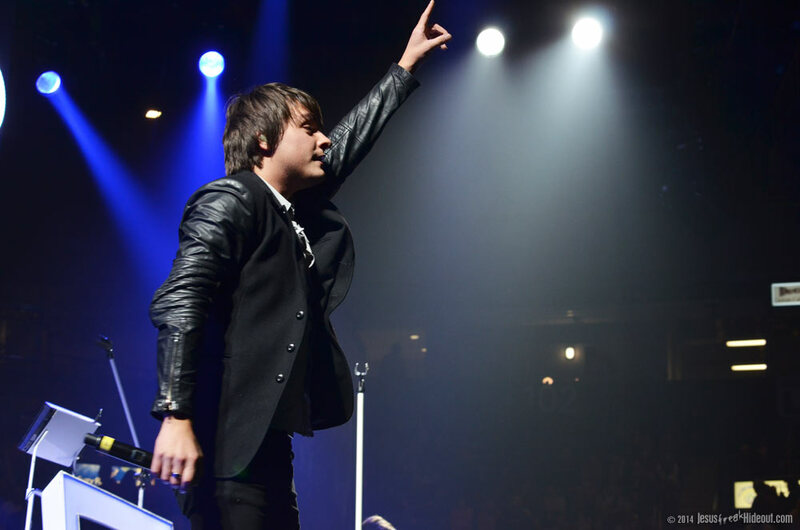 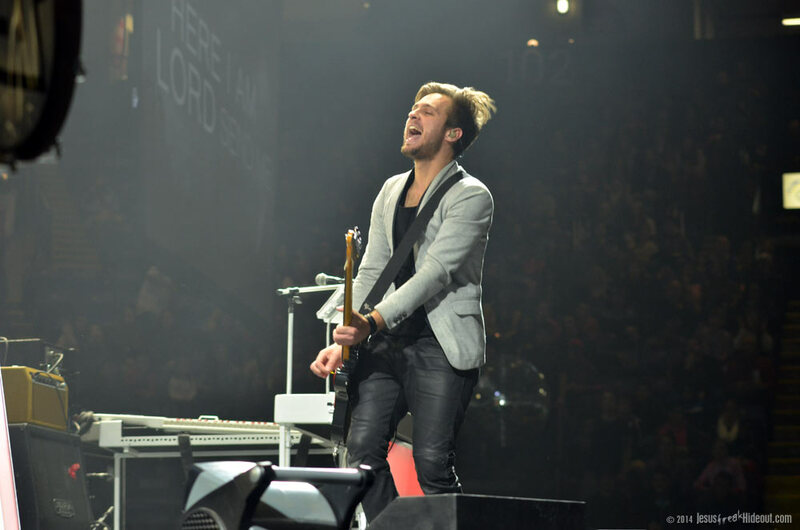 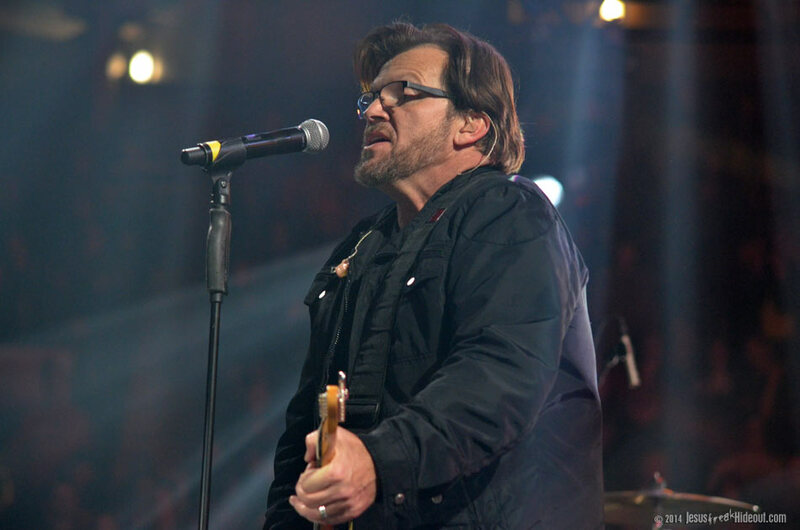 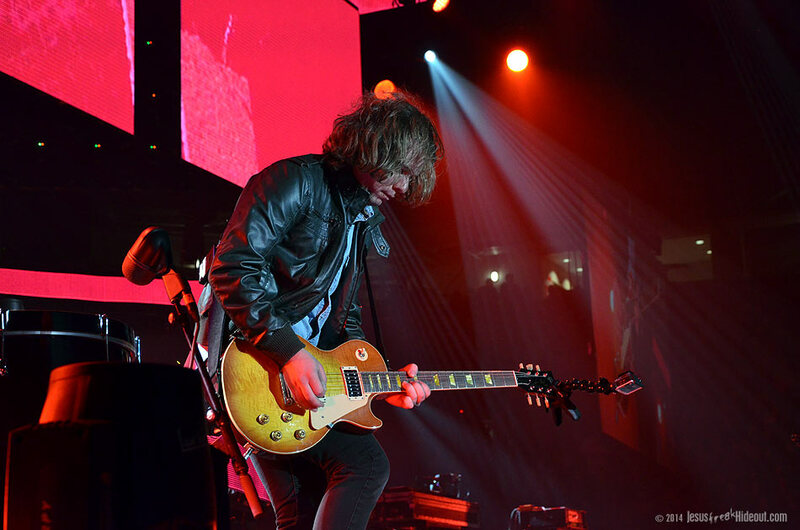 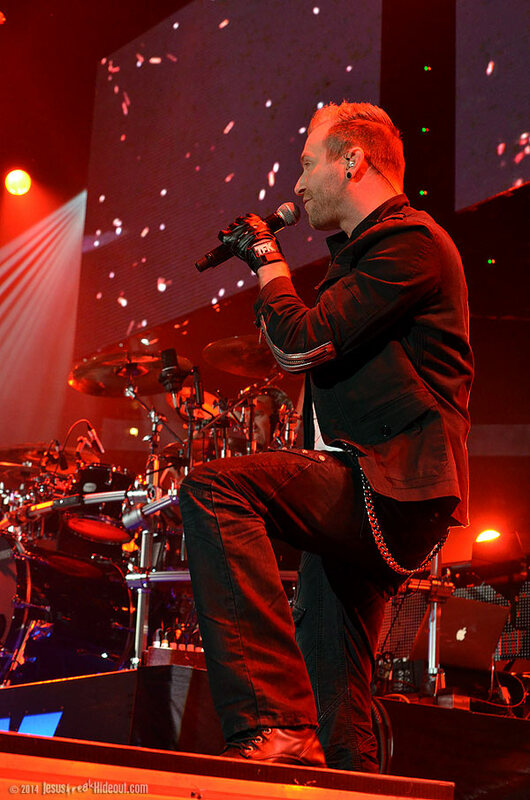 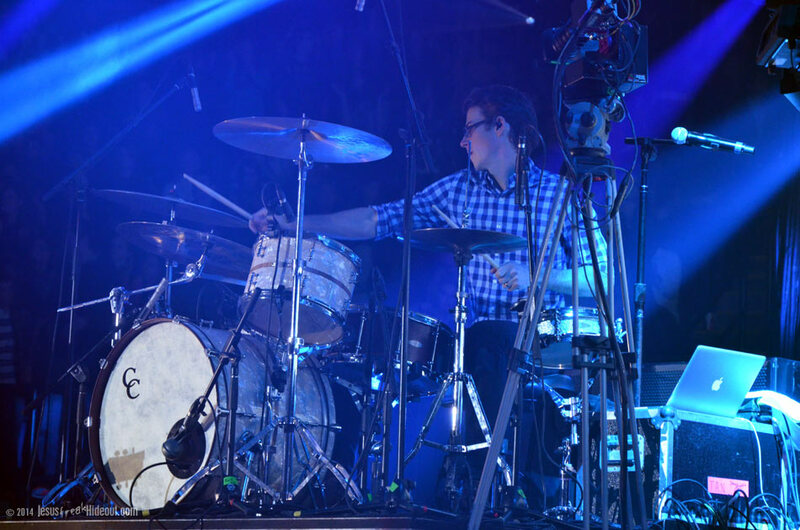 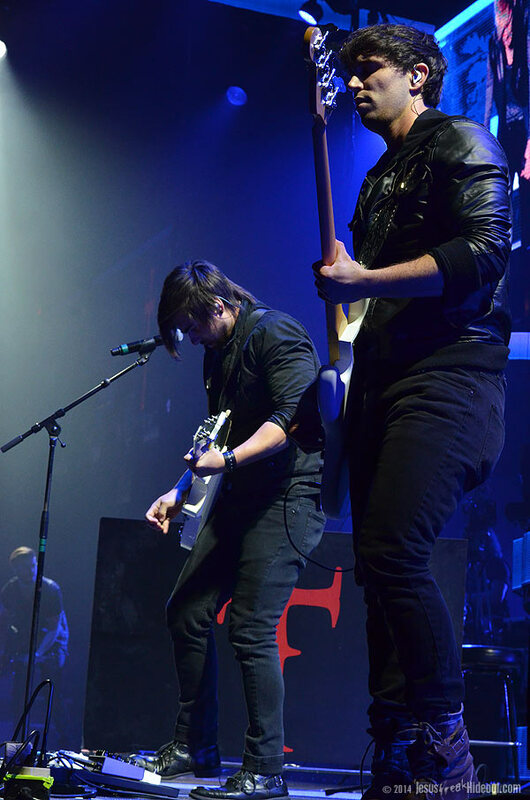 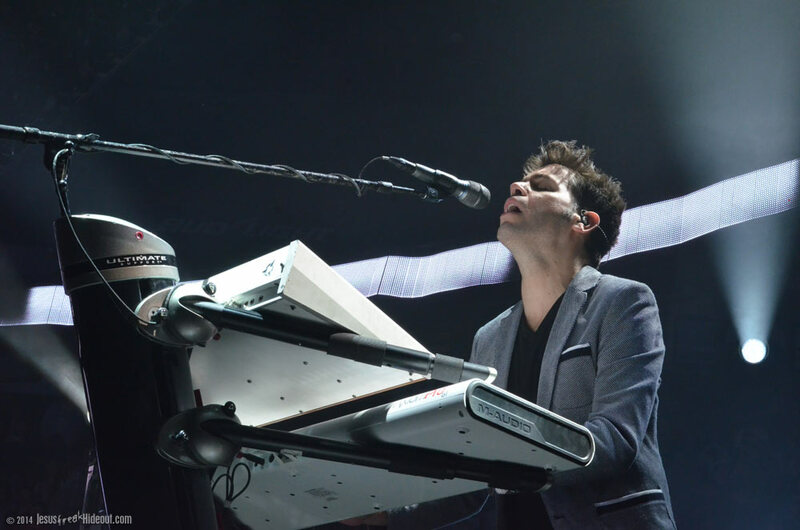 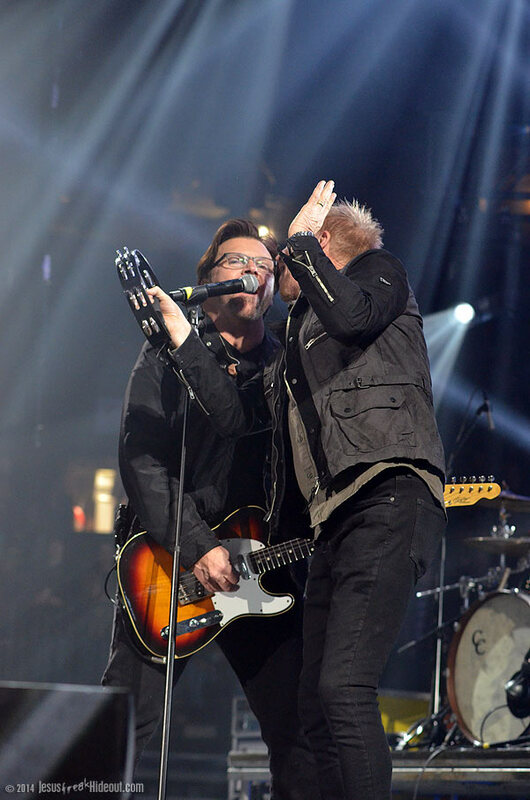 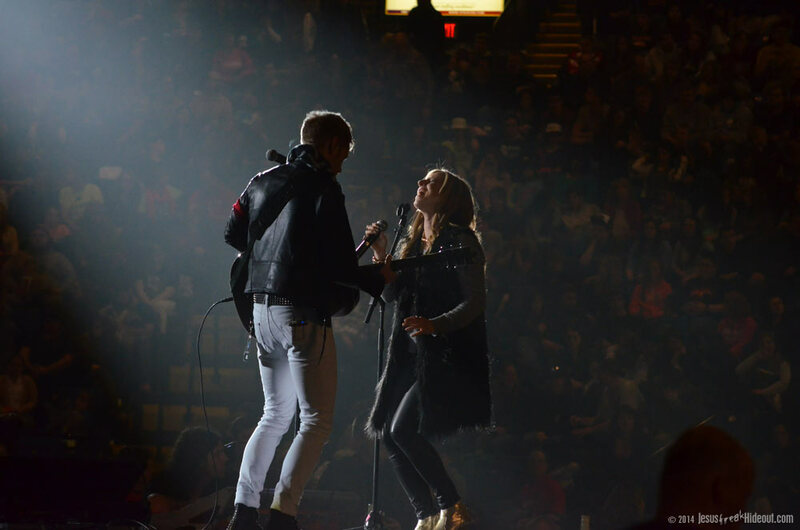 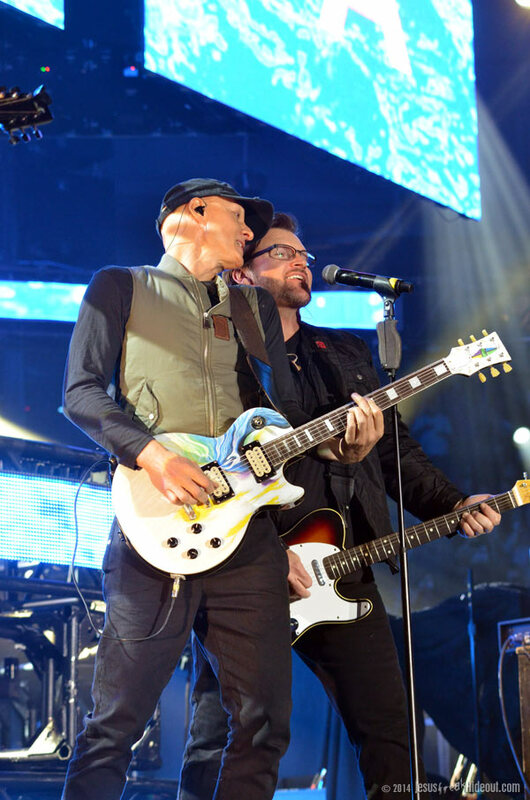 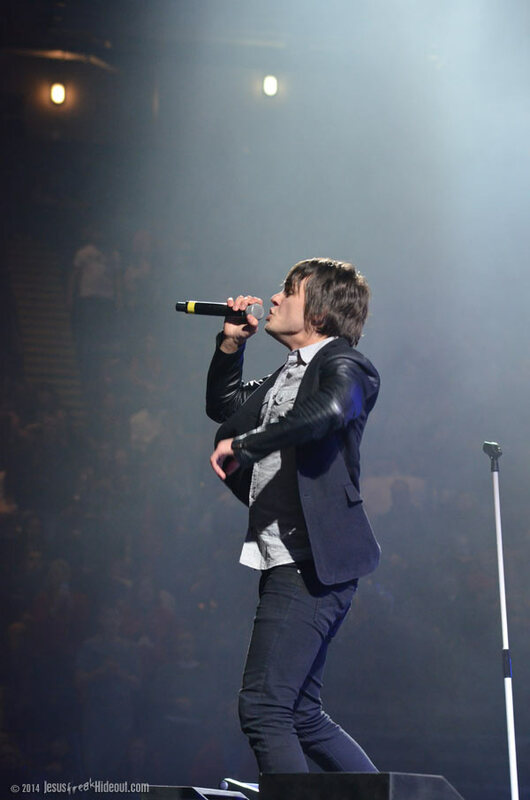 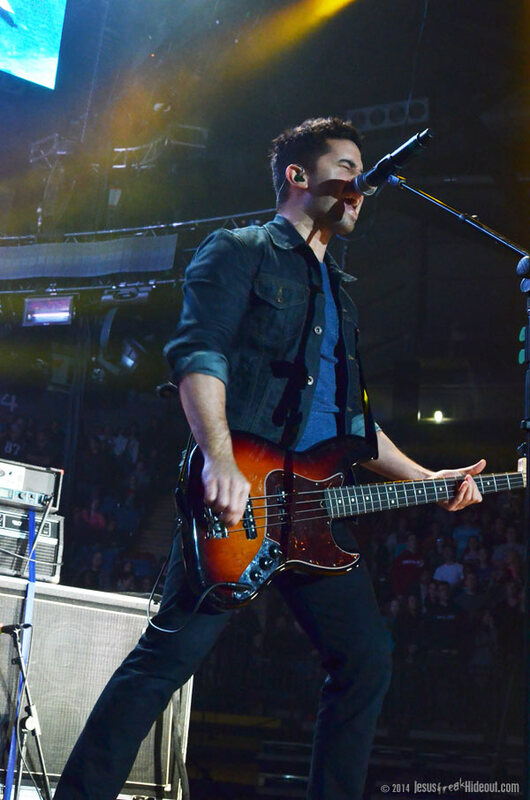 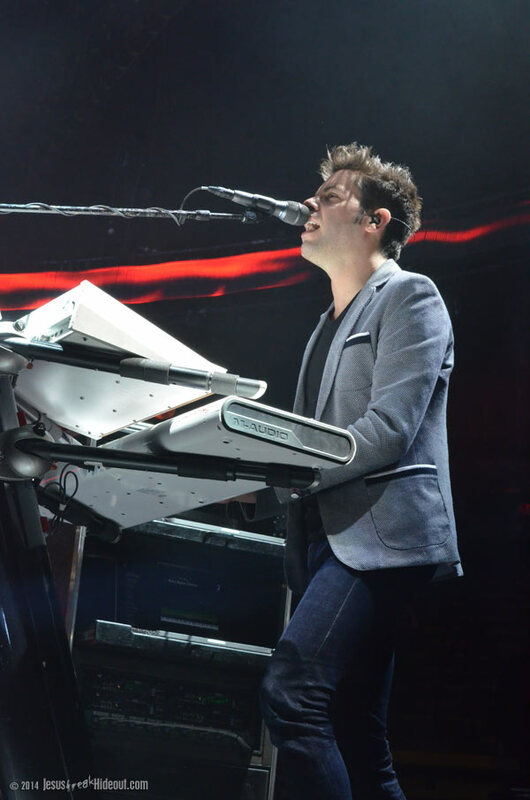 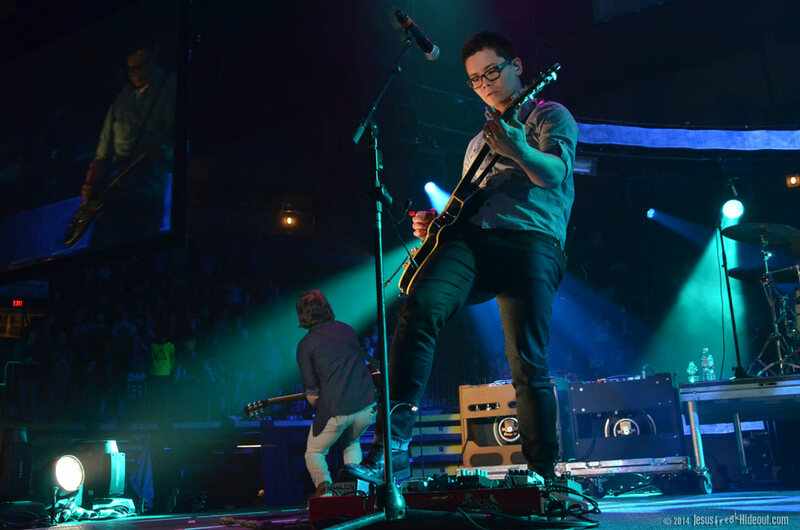 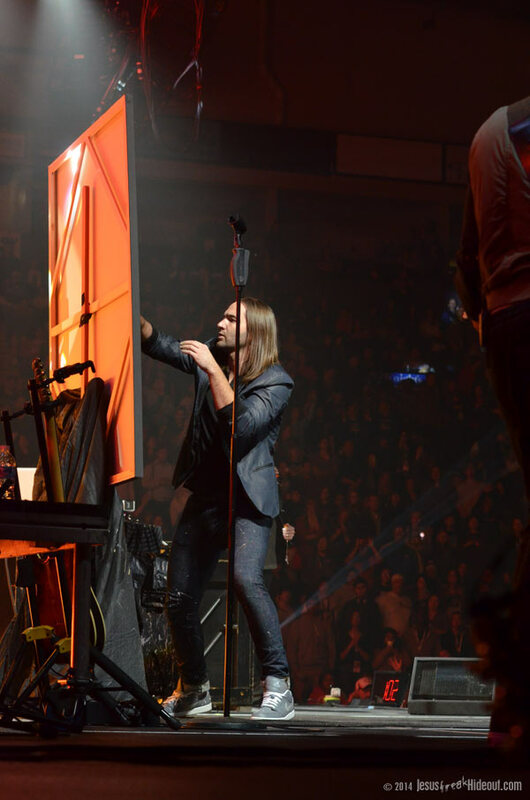 To close their set, Tait plugged their appearance in the upcoming motion picture God's Not Dead, which is named after the song that Newsboys covered and made popular, and then performed the worship anthem. 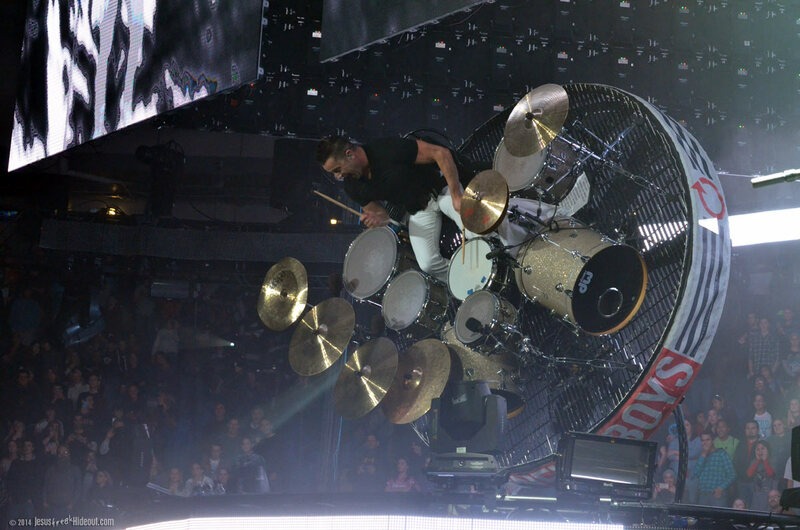 And for this closer, Michael hopped into the bucket of a crane that slowly took him around the bleacher seats where he was able to high-five and shake hands with some excited fans. 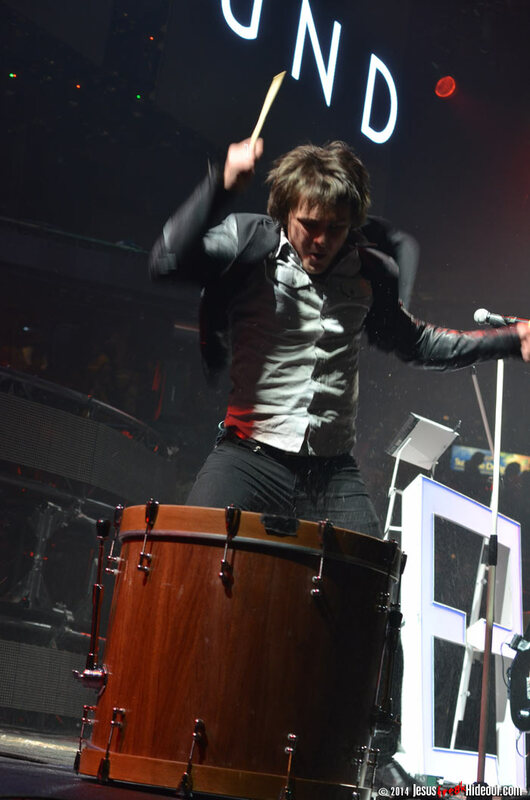 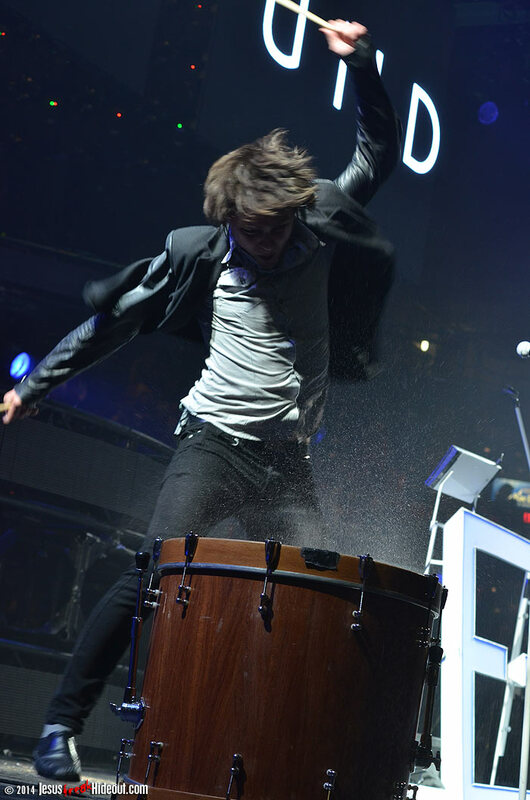 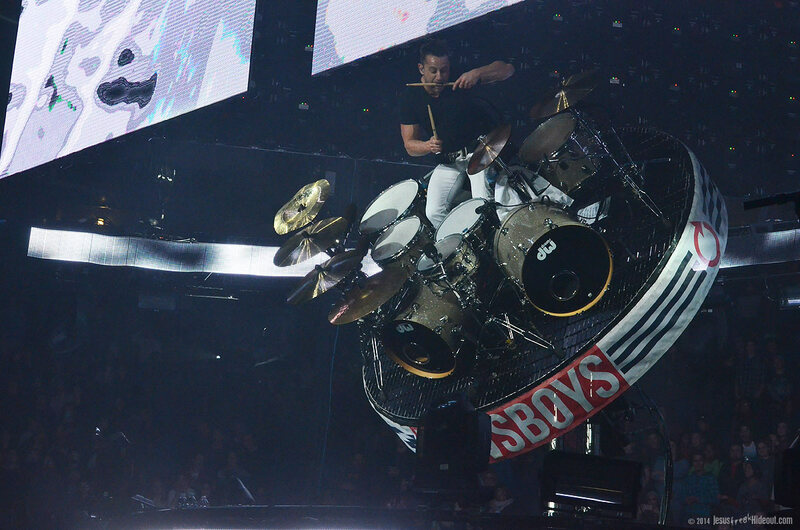 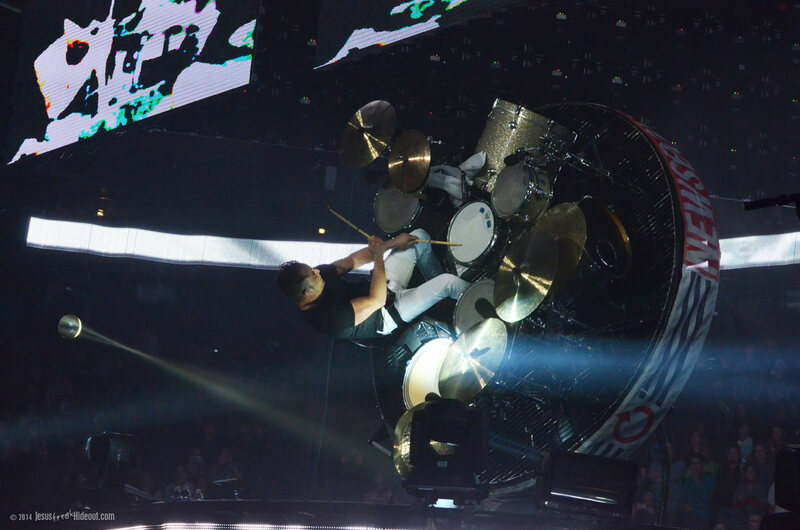 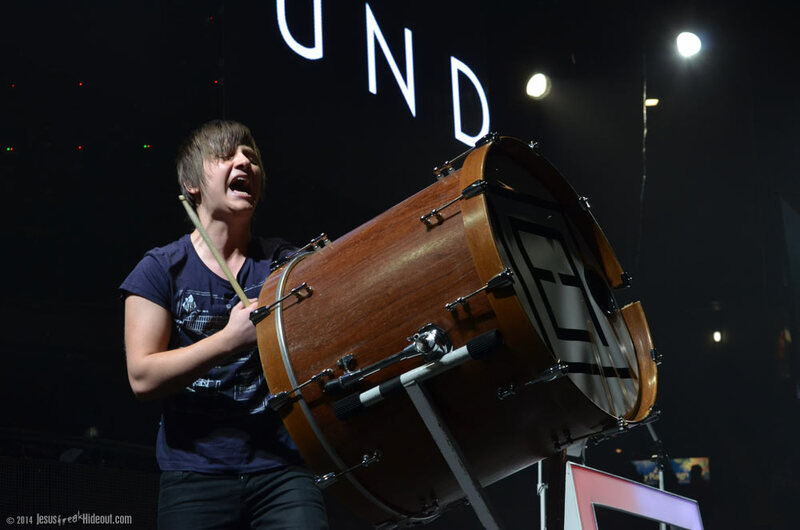 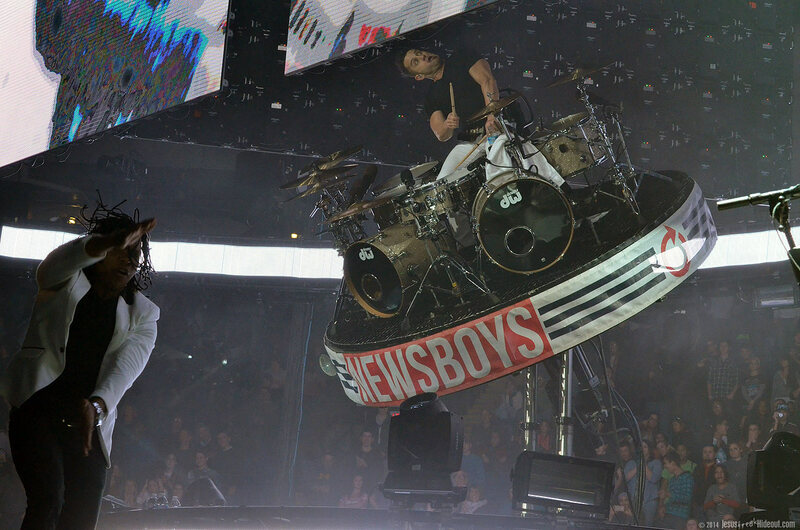 Newsboys are known for big shows and spectacle, and this made for an appropriate finish for their set. 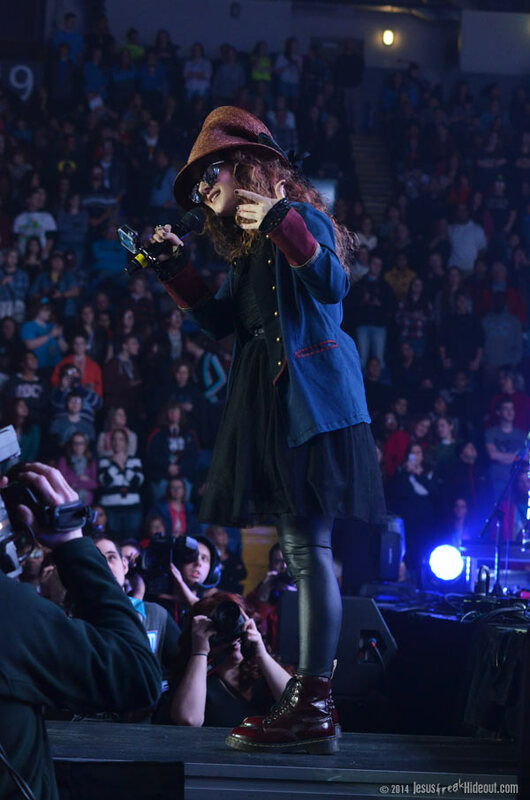 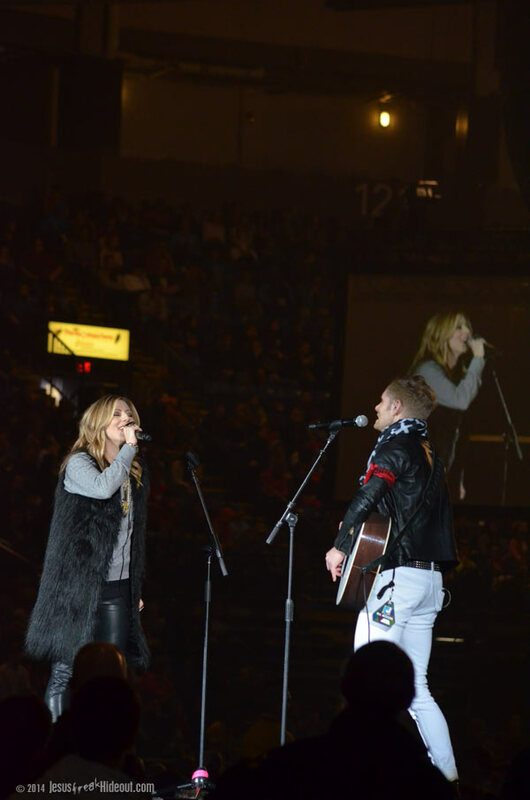 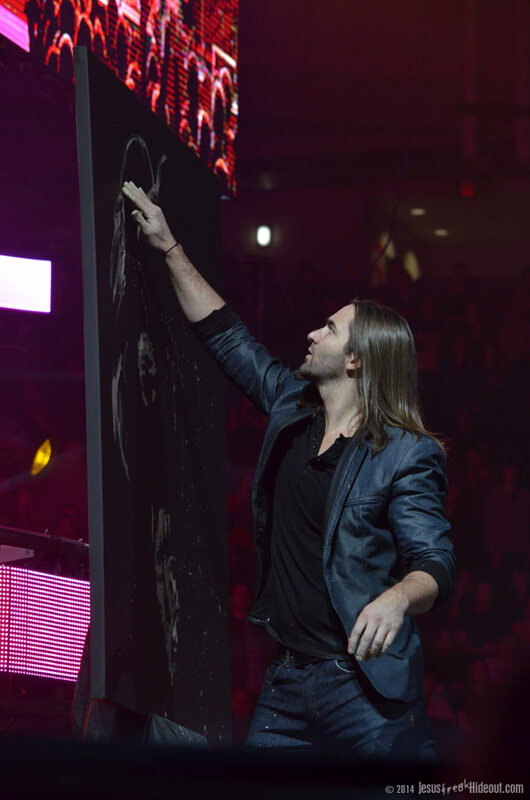 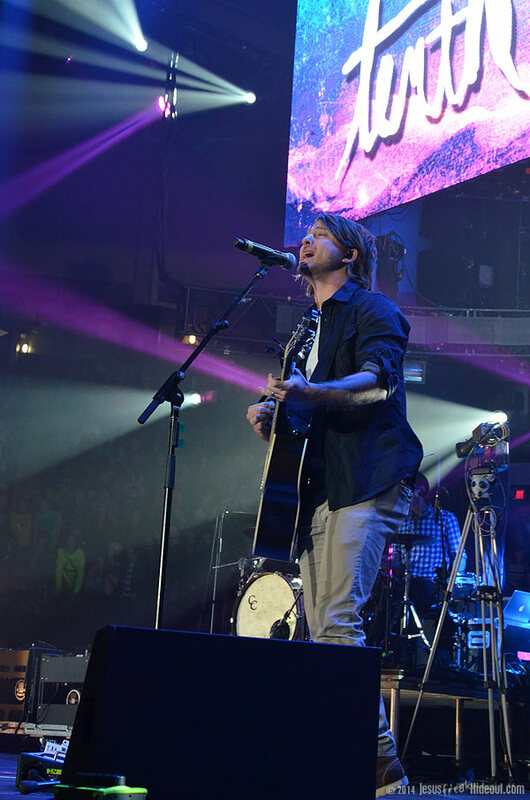 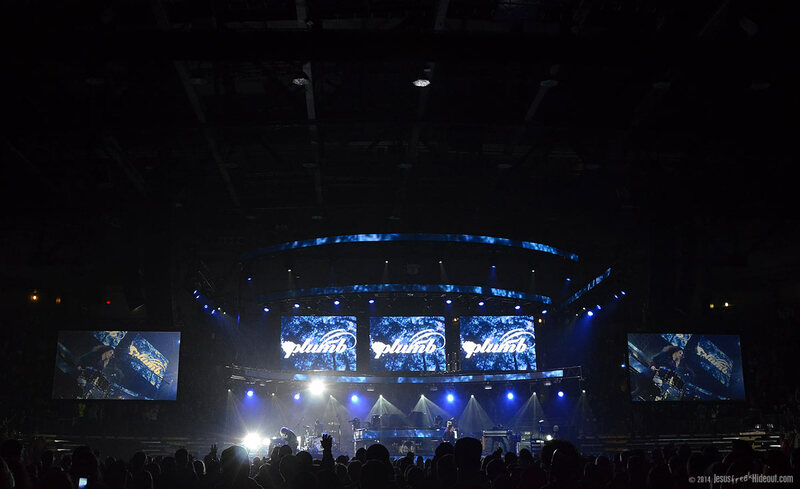 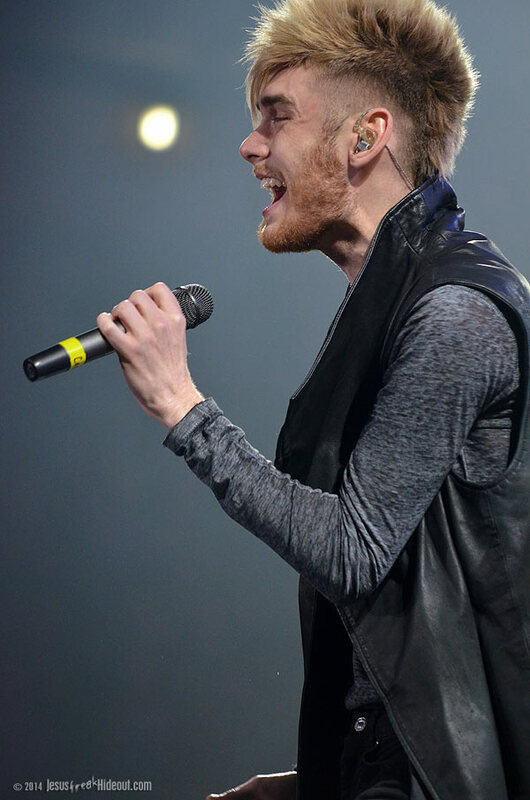 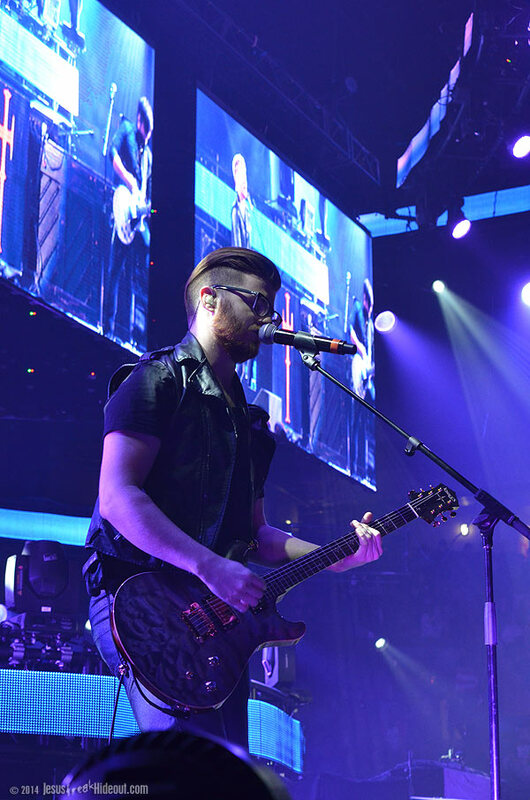 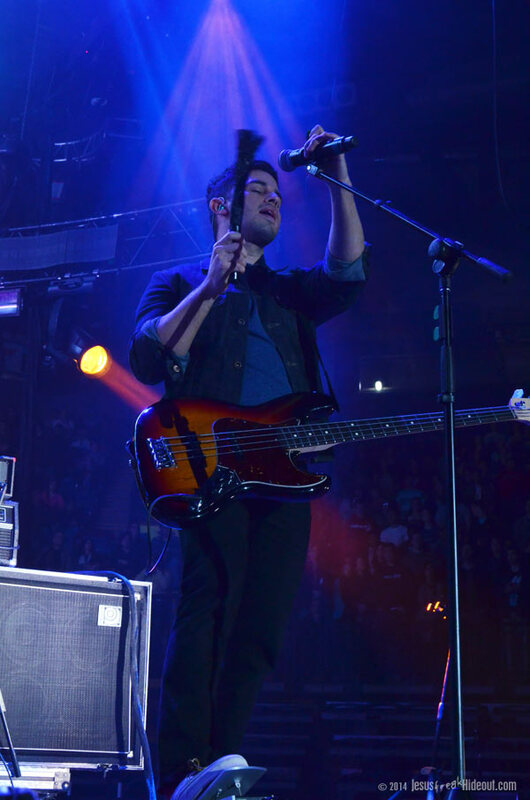 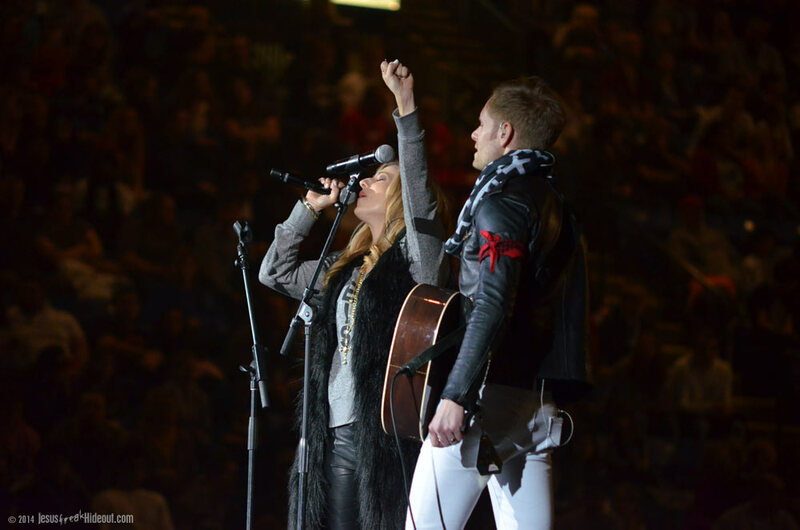 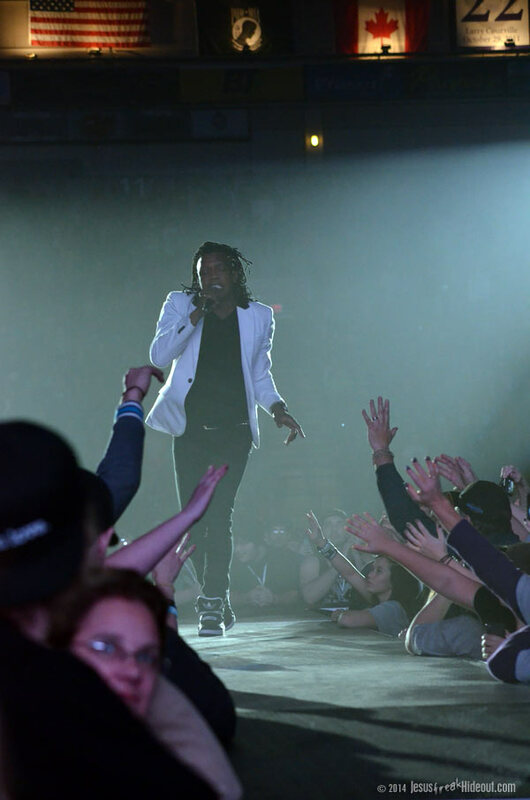 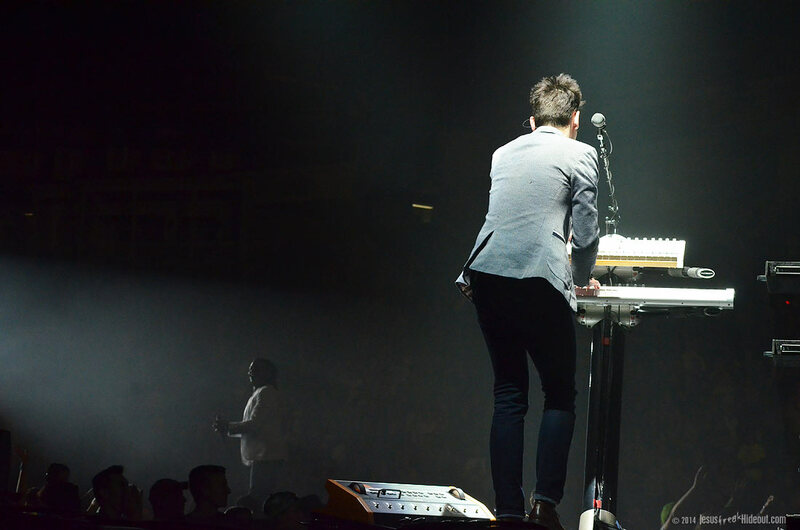 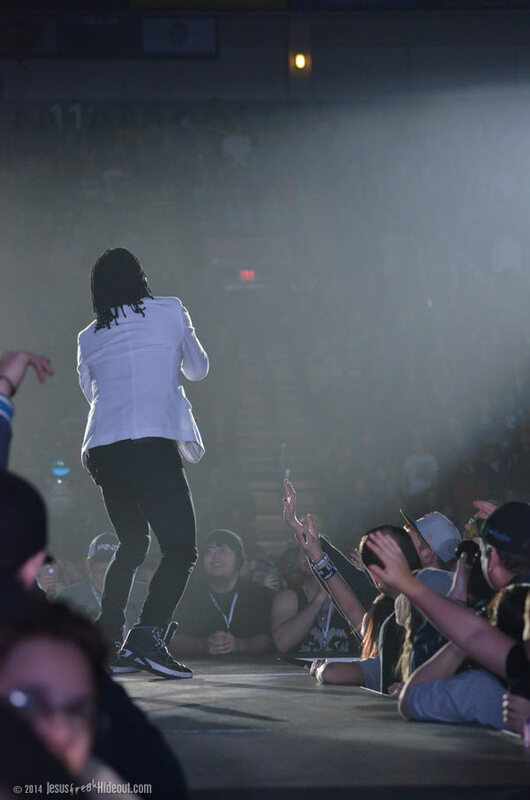 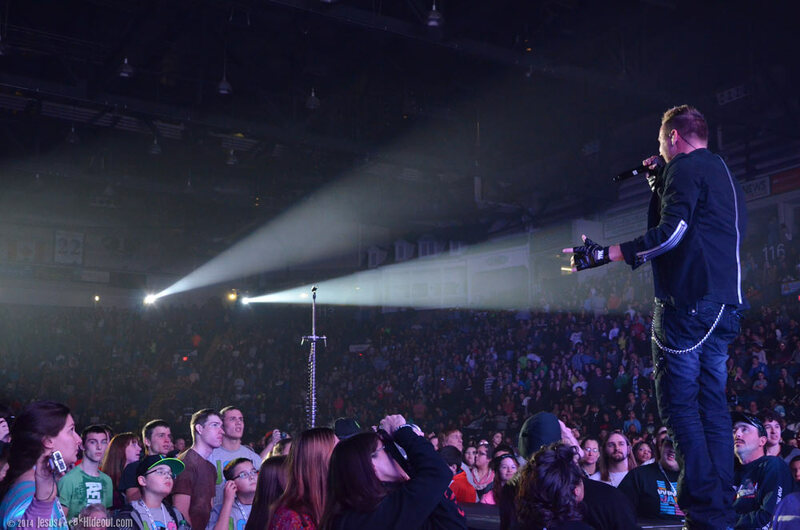 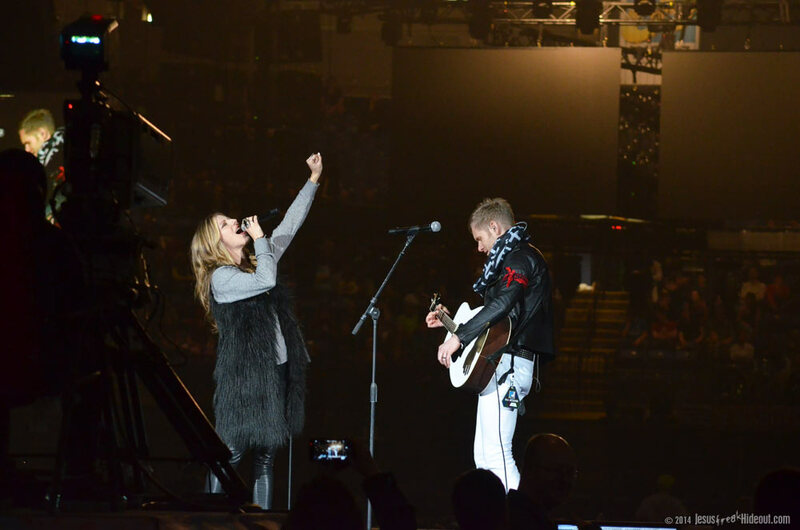 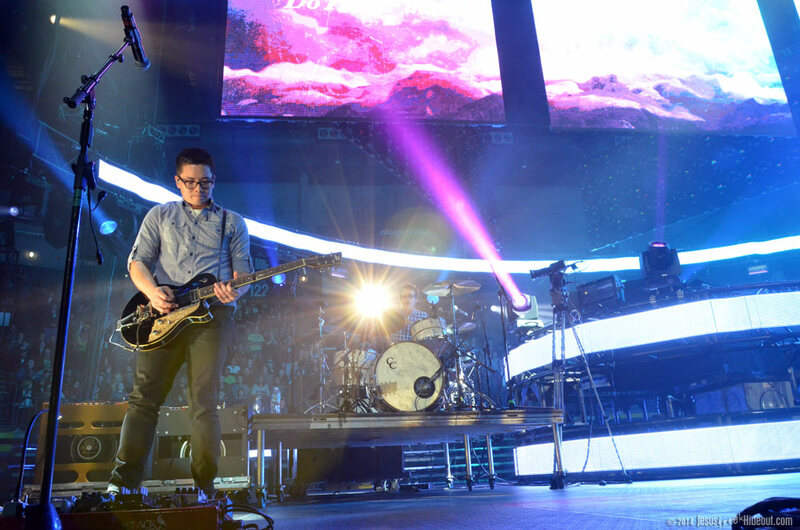 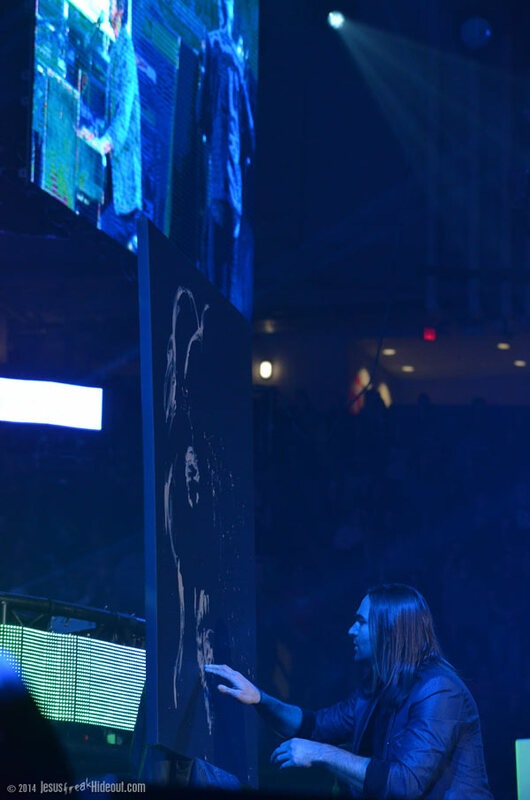 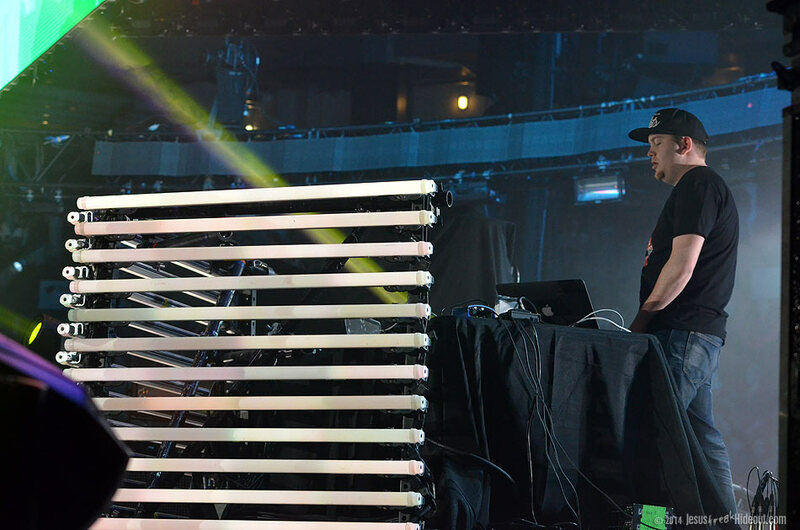 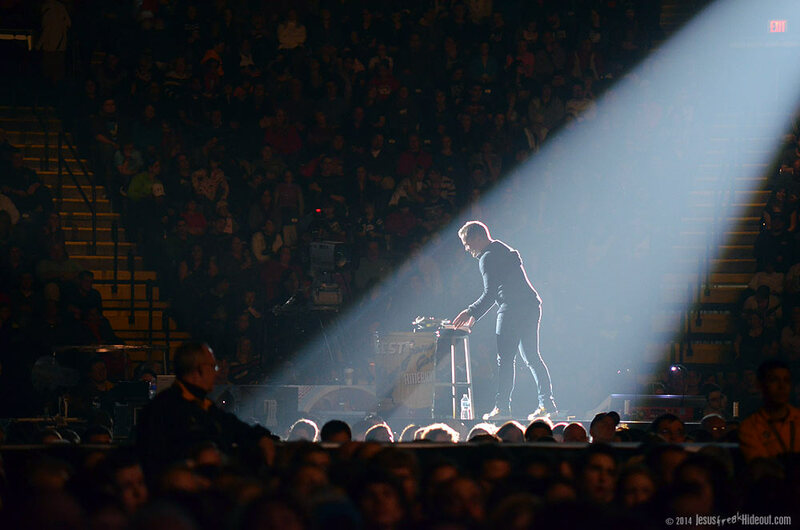 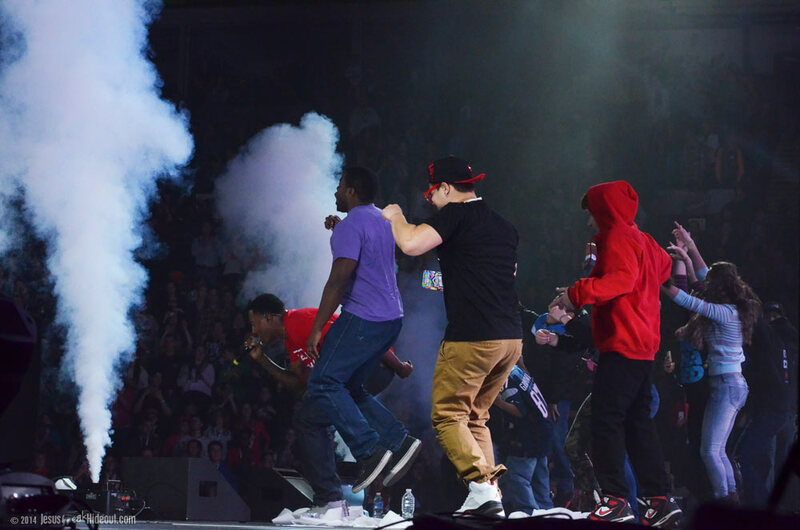 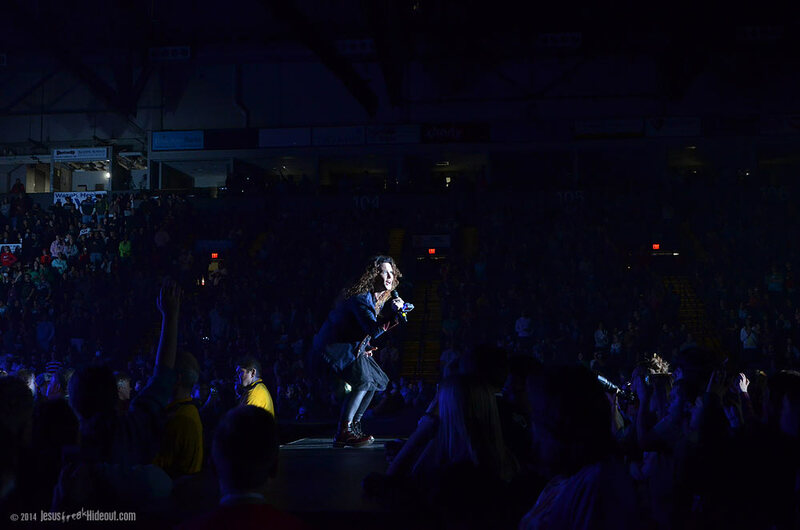 With a closing prayer, Winter Jam 2014 had concluded in Reading, PA. 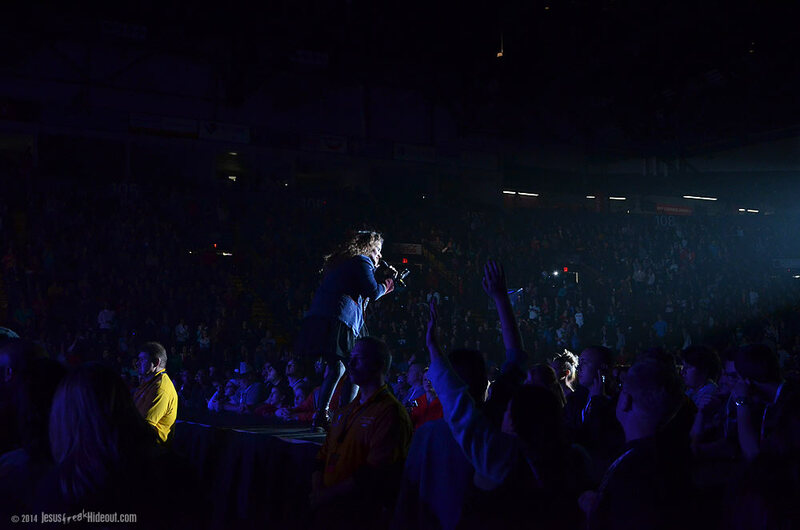 But the night won't soon be forgotten by many who attended. 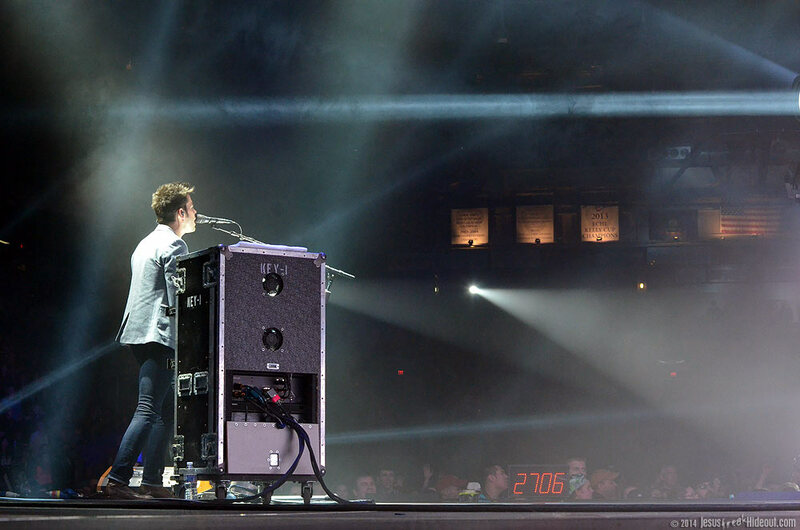 It's a big, big tour with affordable pricing, but just be sure to expect plenty of sponsor plugs throughout the night and advertising near the vendors. 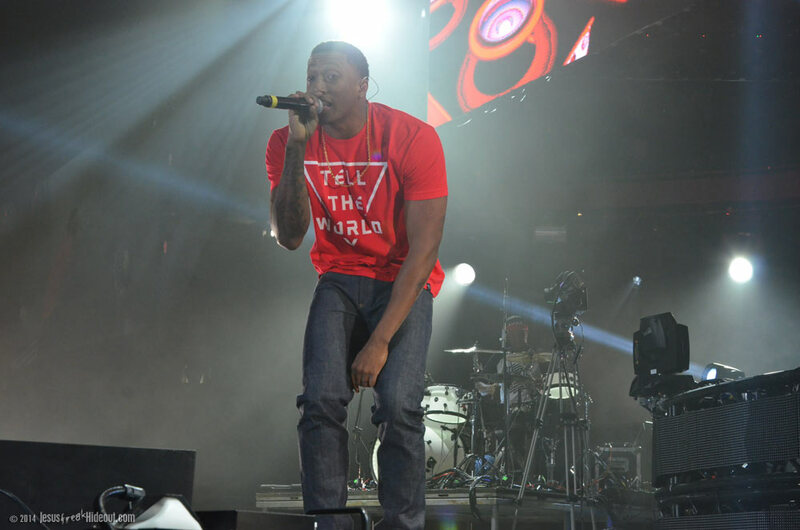 With the low prices, it's no surprise you'll be inundated with messages. 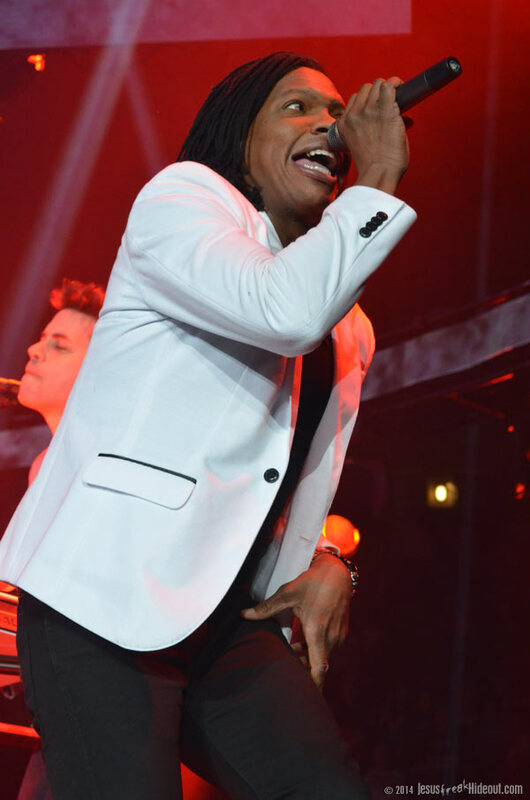 However, I didn't quite expect constant encouragement to text words to numbers during the Newsboys set. 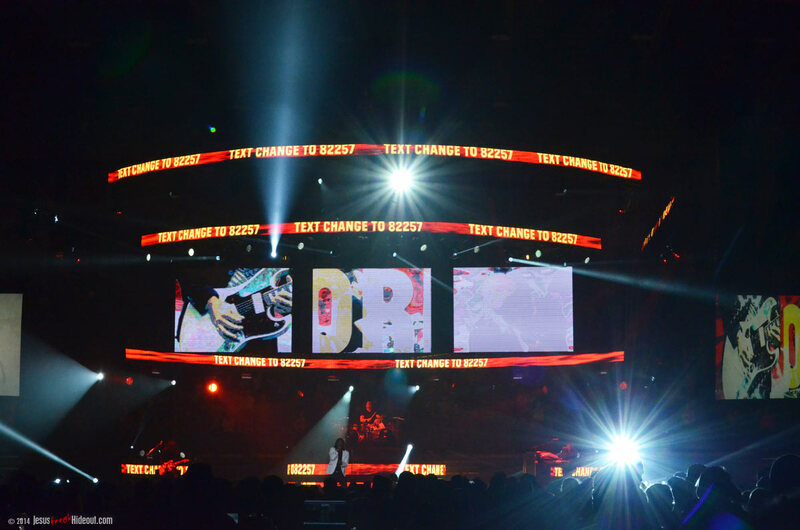 From vocally announcing to "Text ____ to ____" to such a suggestion being displayed in lights on the screens (see photos below), it just seemed like a lot. 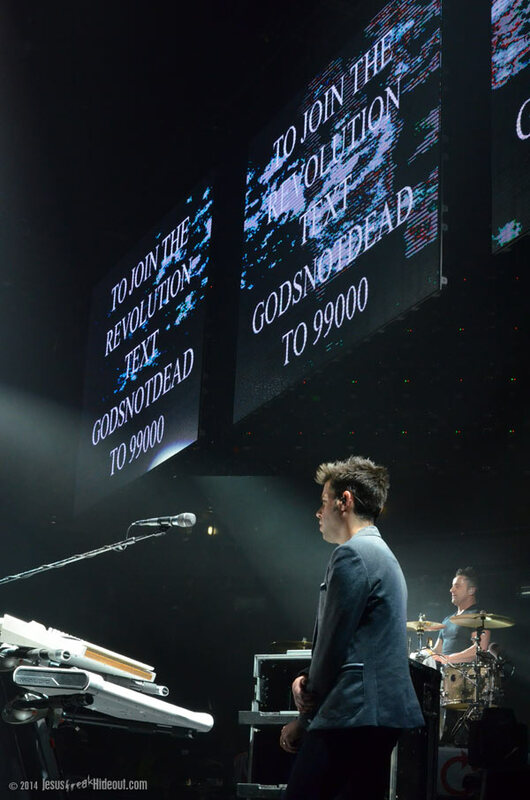 And not all of them were explained as to what you were signing up for in doing so either. 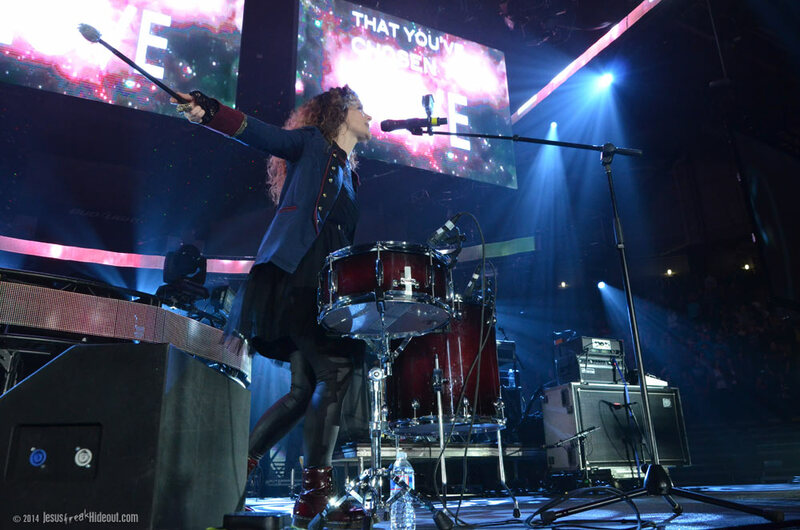 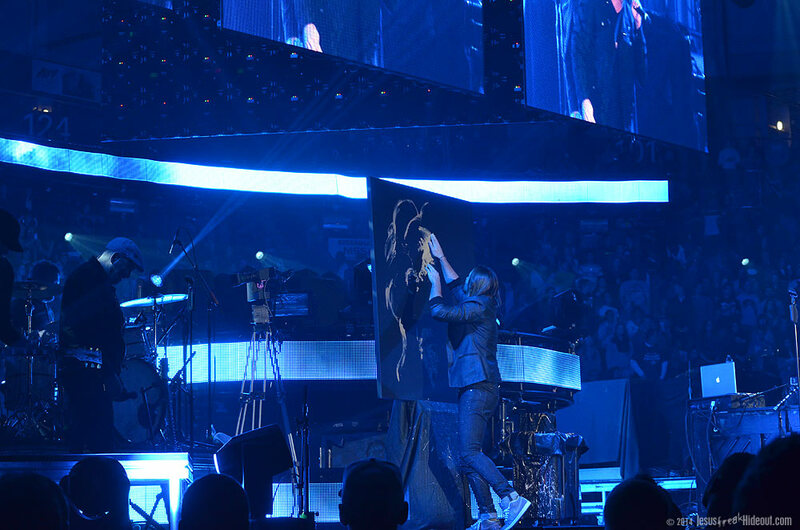 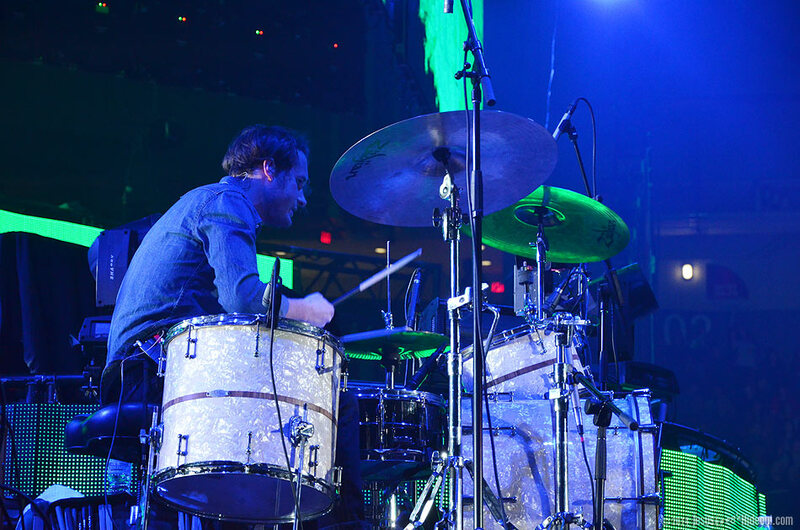 Advertising frenzy aside, Winter Jam unites a diverse collection of artists for a great cause in spreading the good news and encouraging the church. 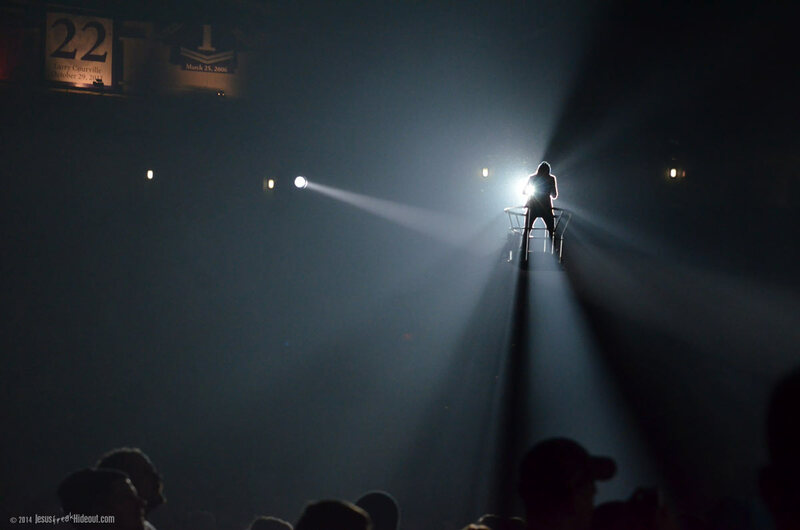 It's still the best bang-for-your-buck when it comes to a tour... just be prepared to get there early and stand out in the cold if you want good seats for the $10 price!